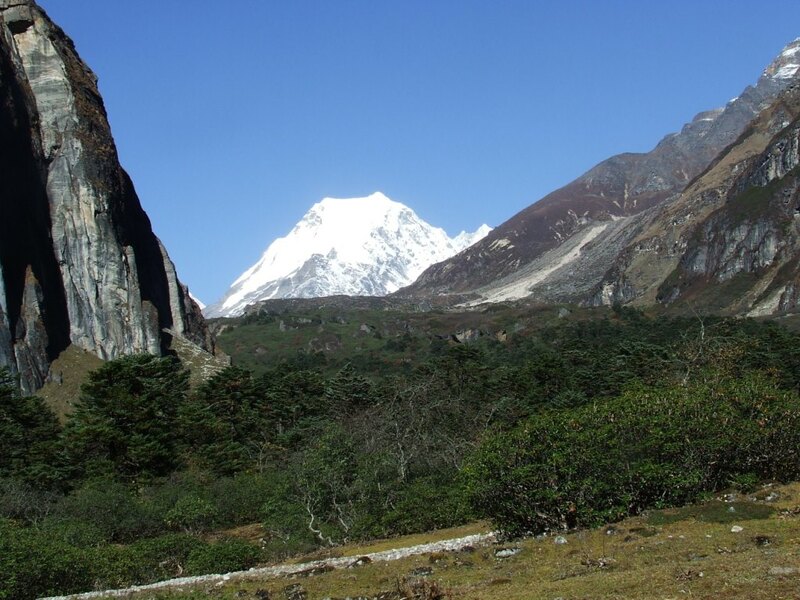 For this third exploration of the valleys of Makalu, we had seen large: overhang Shersong to discover simultaneously Everest and Kanchenjunga, go up to the foot of Cho Polu, finally overcome a 6000 m summit for, very close, admiring the Baruntse! 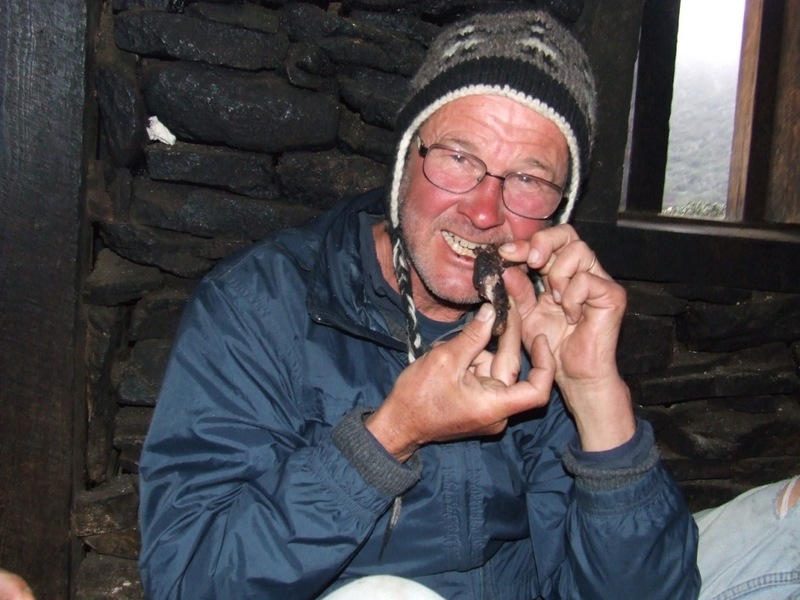 I had recruited a partner on trekkingpartners.com to secure the progress, always risked, in the high mountains. It was a wrong choice because this bad guy abandoned in Kongma, pleading a too heavy bag, painful feet and the bad weather! It will be necessary, in the future, to pay more attention on the selection of the candidates for Adventure! It was thus necessary to pull down a little my ambitions but the most mattering had been made (my first one 6000 solo!). Furthermore, the extraordinary valley of Barun, for the first time, revealed under a magnificent autumn sun. 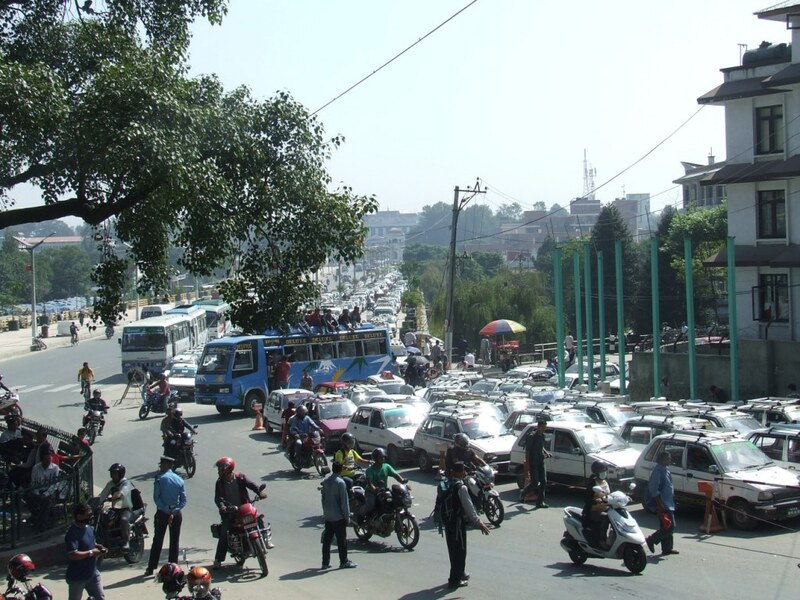 Luckily, I will manage to move in spite of the oil crisis which shakes Nepal. Few days after my return, the internal flights will be cancelled because of shortage… After the earthquake of last April 25th, the Nepalese have to be particularly serene to support with so much peace all these misfortunes and all these hardships without flinching! 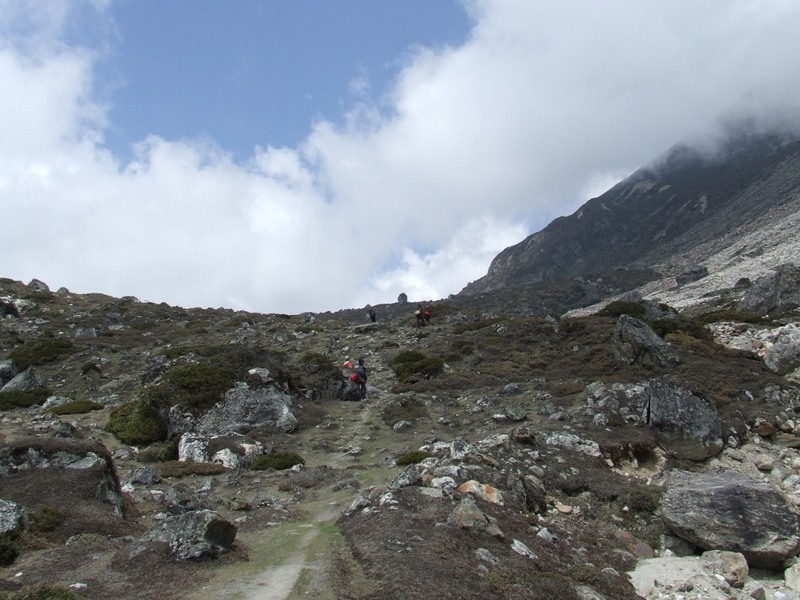 Trekkers will be more numerous than in May, 2014 on the paths to the base camp. Higher, it will be the total solitude, broken by some ravens trying to steal my small pittance. I’ll tend to sympathize more with guides and the Sherpas than with certain very demanding and sometimes quick-tempered tourists. 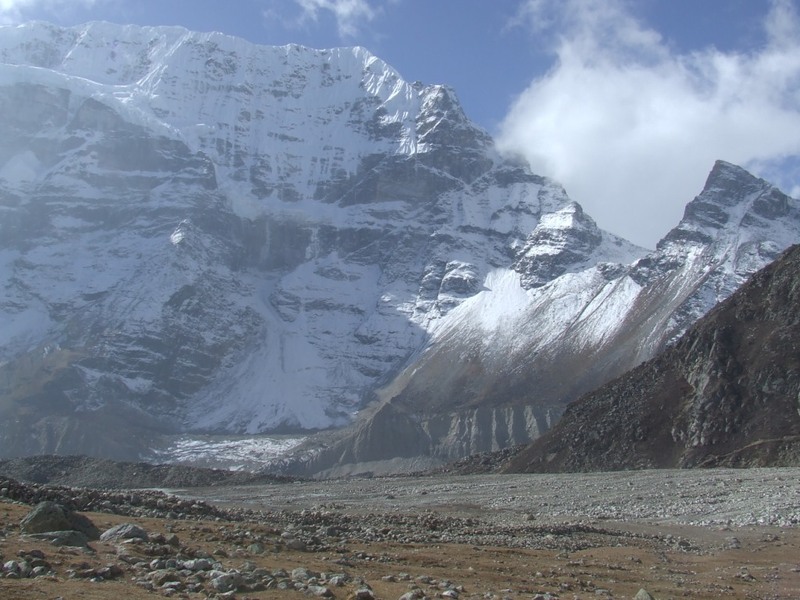 I am increasingly against the package tours sending people effortlessly at high altitudes and leaving in the mountain, the heaps of their garbages as eternal memories of their passages (see in appendix: The trekker and her porters). The same equipment is used than in May, 2014. 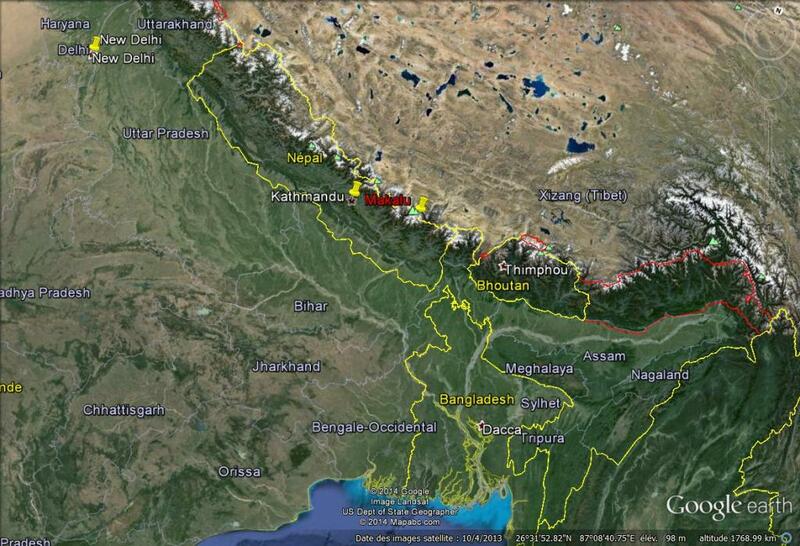 I embark this time 4.5 kg of food for 6 days planned in autonomy on the Barun glacier. I am loaded with 20 kg, water and petrol included (it is too much, my back will not forget quickly). I travel again with Air India (620€, good service). It is easy to find cheaper but the stopovers are often very long… On the way back, we’ll arrive with a delay of more than one hour to Delhi but the flight for Paris will wait for us wisely. 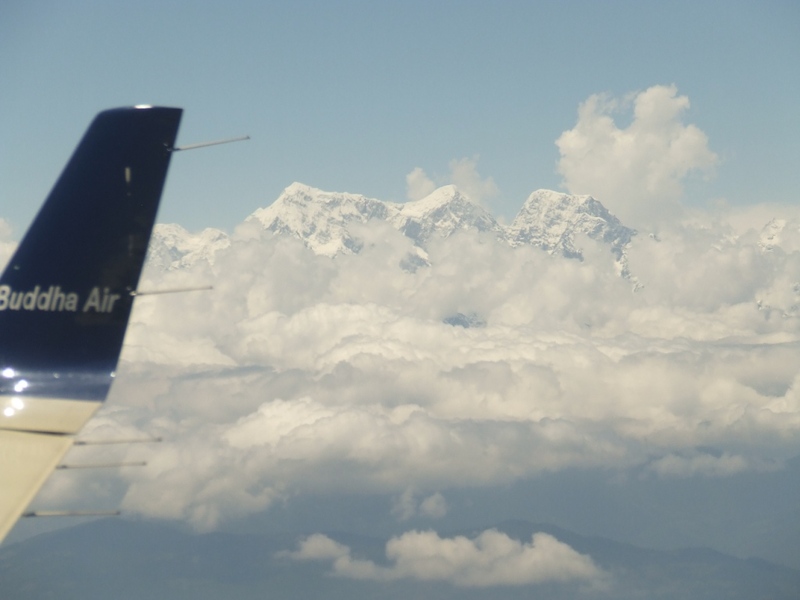 Yeti Airlines, as the other companies, increased its price rates in 2015 (247€ AR). I used private jeeps for the route Khandbari-Num (600Rs on the way out, but 3000Rs on the way back) by fear of petrol shortage but also for comfort! 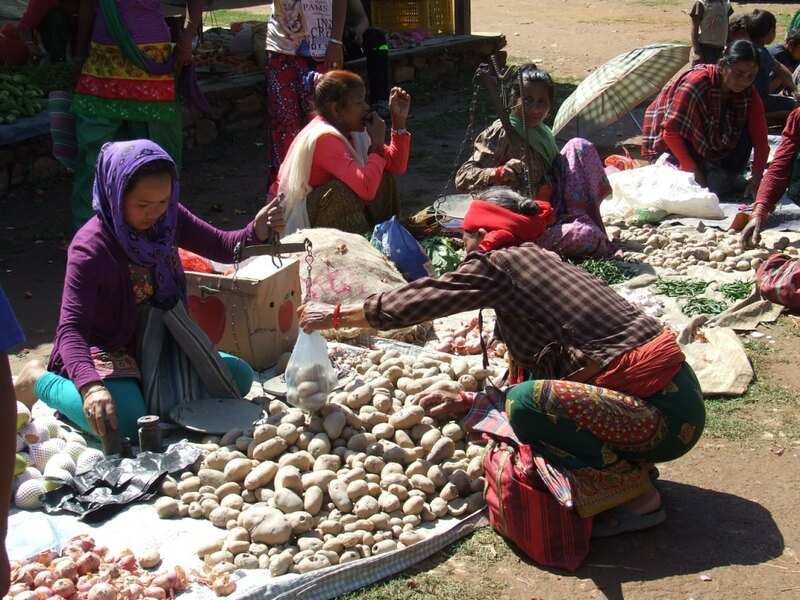 On site, in Nepal, the spending, all inclusive and without counting too much, was 500€ (with 4 « free » days of autonomy). 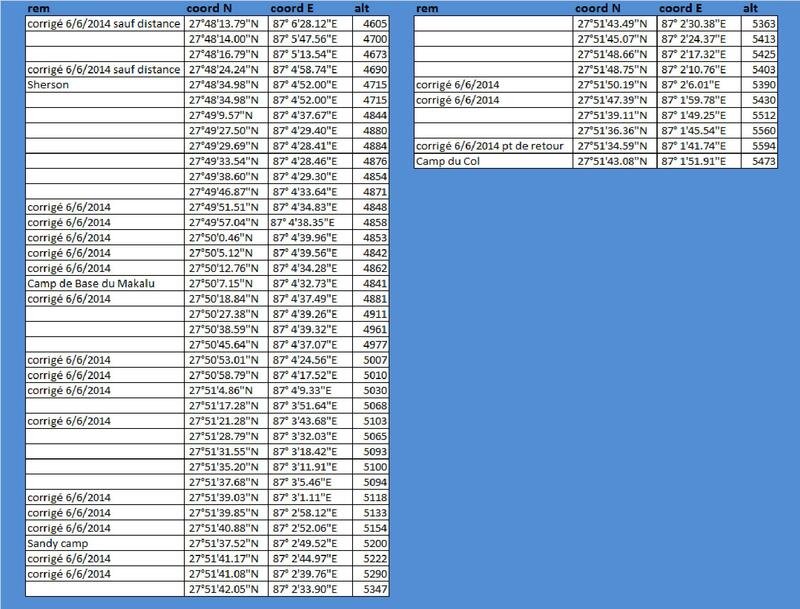 With the domestic and international flights, the total spending is 1370€, including visa and access to the park. For such an adventure and when we look at catalogs, it remains really very cheap! The journey in jeep was very comfortable. On the road, the so desired mountains already appear. It is a call for Adventure! I’m not in top shape for this first day that isn’t the easiest. From Num, Seduwa always seems very close, at the same altitude and just separated by the Arun’s valley. 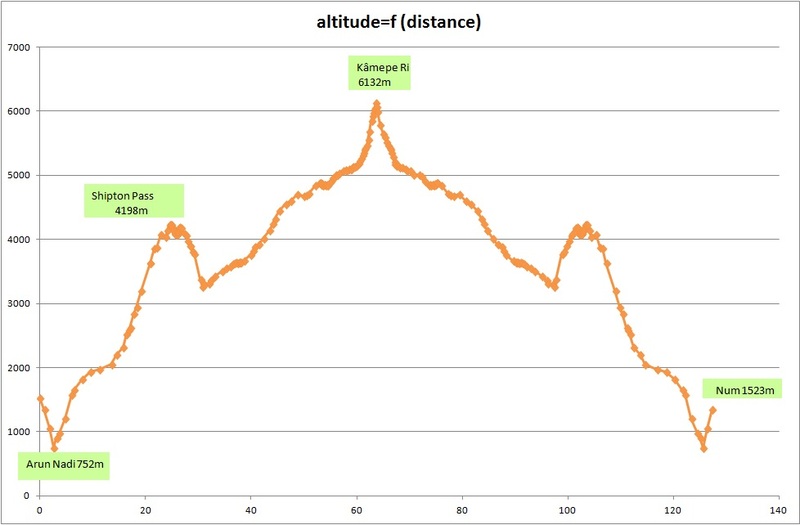 Just to remind: you should not forget the 720m descent followed by a 820 m ascent. We don’t hurry up and will arrive at nightfall in Seduwa. 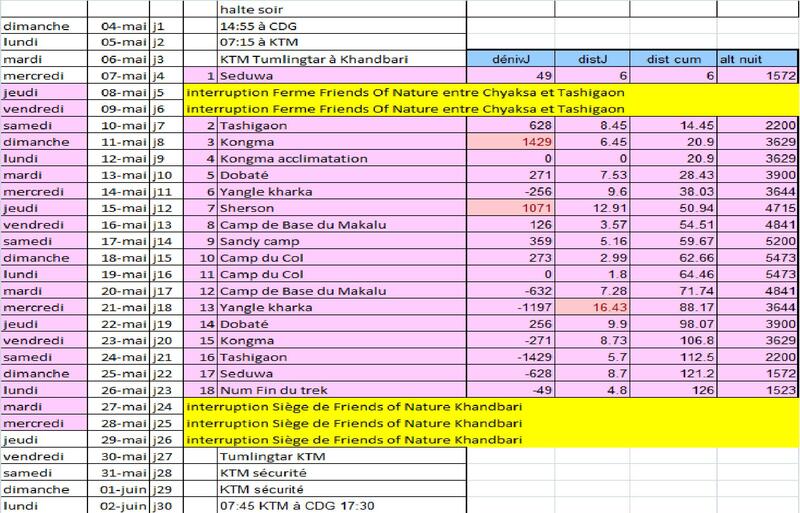 Here is a three days interruption to bring to a successful conclusion, the necessary audits for the progress of our projects in common with Friends of Nature. I discover a very pleasant waterfall to have a bath at less than half an hour of the village. The walking is easy today. It’s necessary to be careful to avoid the leeches by walking as much as it is possible on stones of the path. 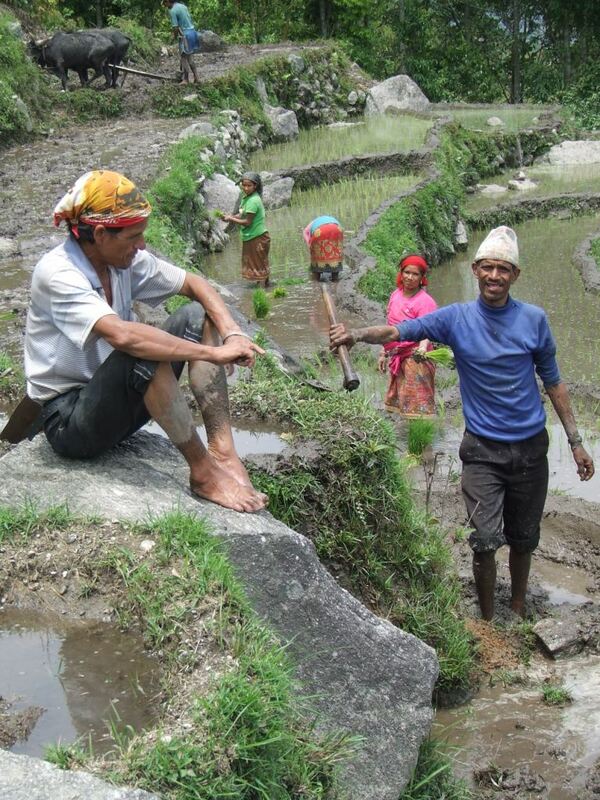 The second rice harvest of the year began and the activity is going full swing in fields. 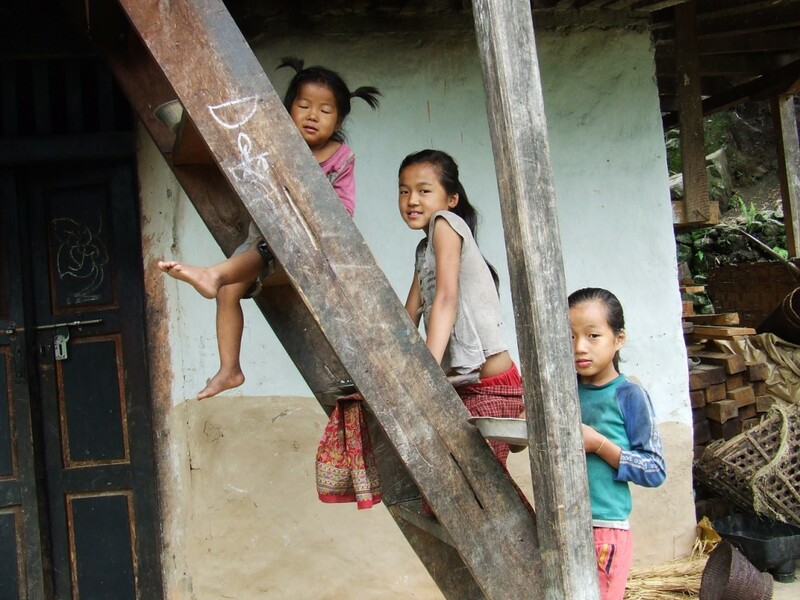 On the way, I visit the Tashigaon’s school, recently equipped. The welcome is warm. The weather covers in the morning but we avoid the rain. I settle down in the only one lodge open. 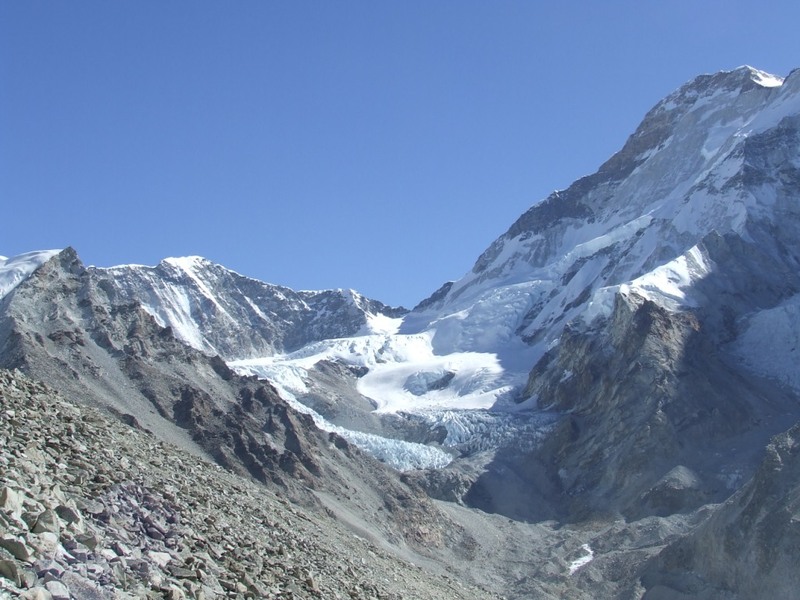 The weather is beautiful at the beginning of the morning and will cover strongly in the ascent to finish with a very violent thunderstorm in the evening with hailstones and snow. The tropical climate brutally gave way to winter. 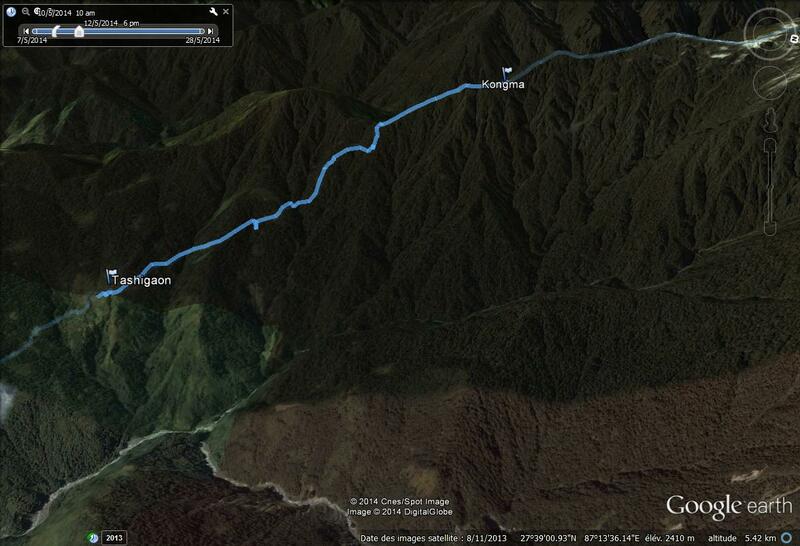 I locate the crossing of the path for the Isuwa (Ishuwa) valley on the crest (N 27.647117 ° E 87.209821 °). It can be a future trek. It is not said that the path continues very far. The descent then the progress in full jungle, if the path disappears, would compromise the project. It rains a little (I have no translation for « pleuvioter ») when we arrive in Kongma where two new lodges have been built since 2014. I remain faithful by installing in the oldest. The rain replaced the snow in the morning. I had intended to cross the four passes to arrive to Dobato today, by neglecting the acclimatization, a precaution nevertheless necessary. The bad weather persuades me that it is better to stay in Kongma. I pass a large part of the day in the bed, under 3 layers of blankets. I meet two young German trekkers who recognize me. 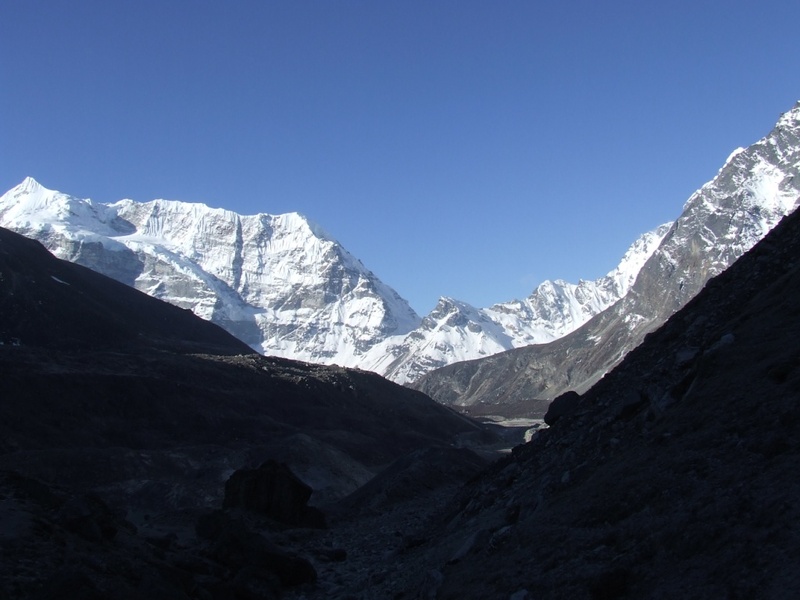 They organized their trek with the information of my logbook of May, 2014 and they come back from the base camp. 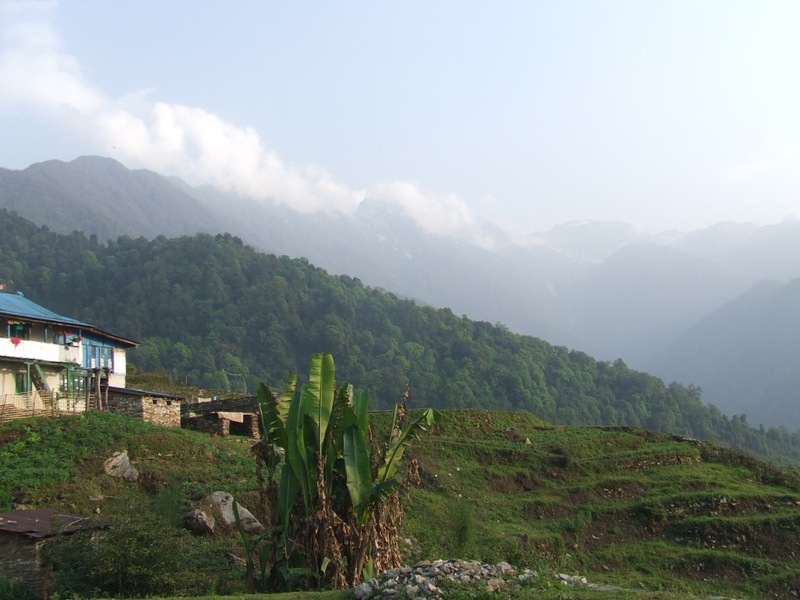 Here is a pleasant surprise proving the rising celebrity and usefulness of my site 🙂 They hoped to go to Sherpani but they abandoned, without any accompaniment… It is a pity we do not met earlier. As I am used to Kongma and above, it is an aldready lost race against the clock with clouds. The sun just rises for extracting the mist from hillsides filled with humidity. 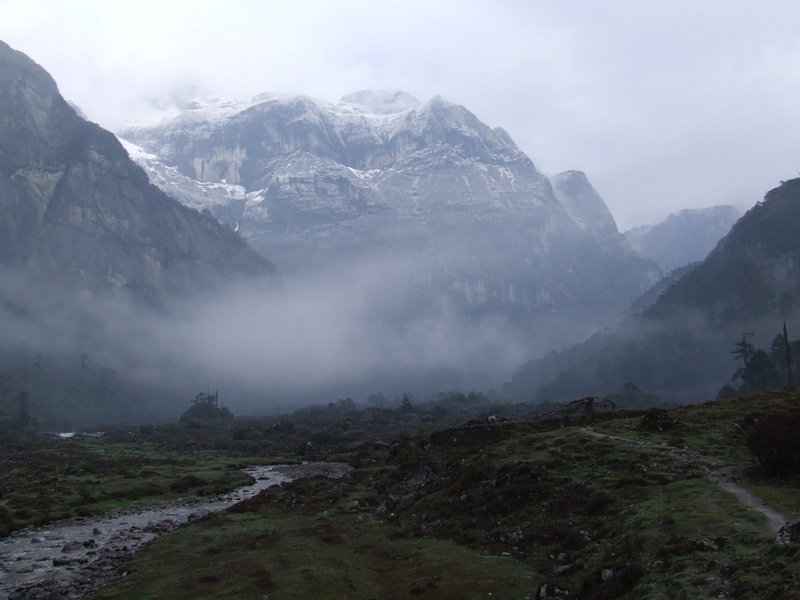 As usual, the mist rises to accumulate towards 4000m. I leave with the sun and arrive at the Kongma pass at 8 am. 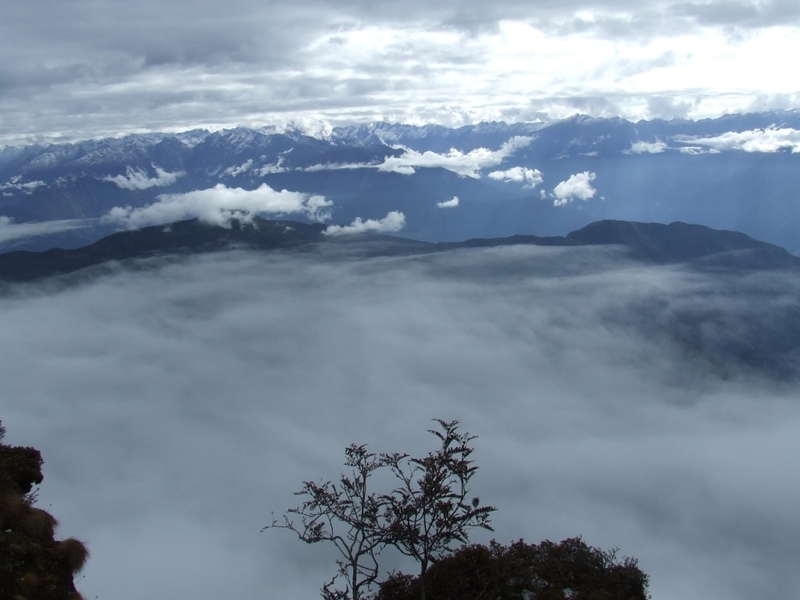 I still perceive the mountain range in the East, dominated by a high altitude layer of clouds. 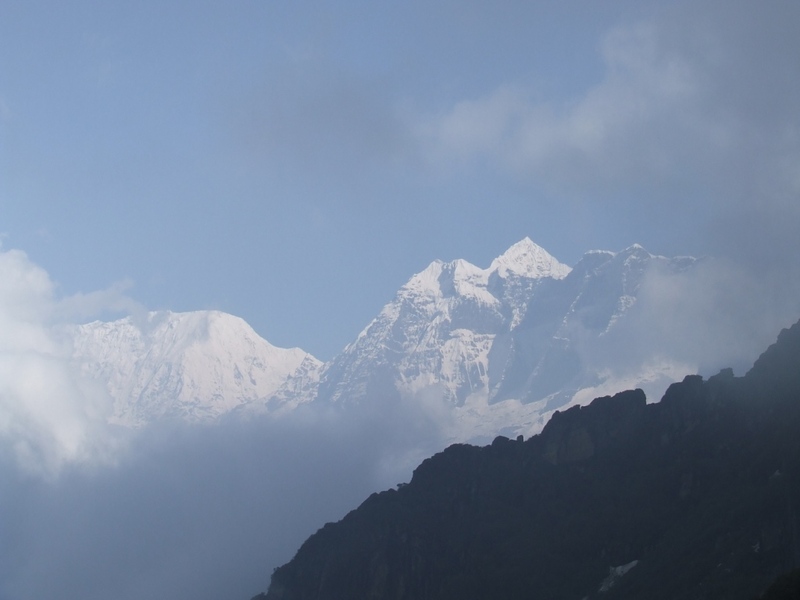 Among them has to hide the Kanchenjunga (8586m and the World’s third summit). It seems that we see it from here by clear weather. Summits combing the Isuwa valley are totally hidden. 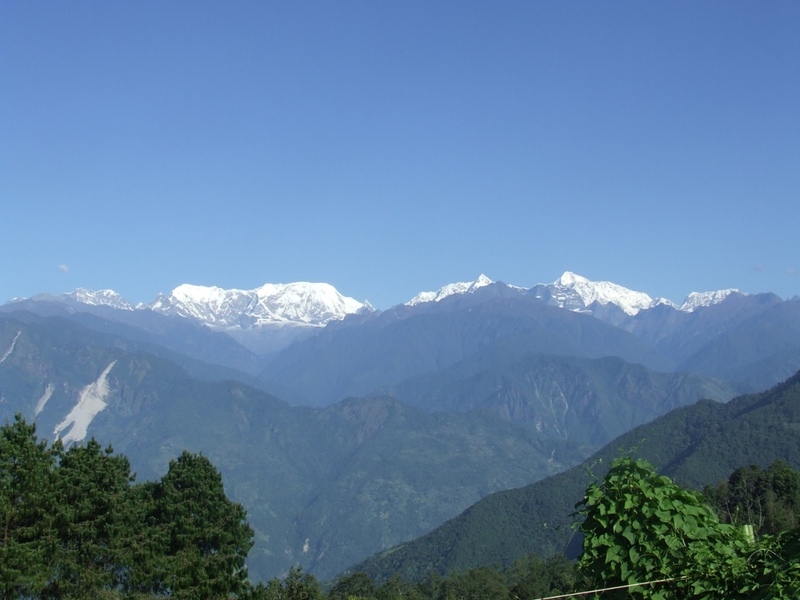 The valley, from Tashigaon to Num, is always under the clear morning sun. It seems to me already very far. 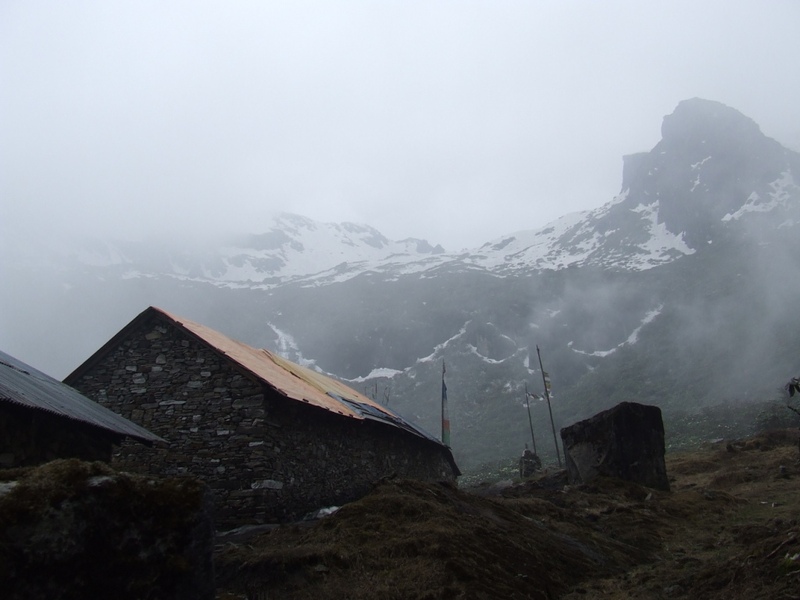 A drizzle joins me towards the 3rd pass (Shipton la, 4230m) which is soon transformed into snow until my arrival to Dobato. The walking is one thousand times easier than last year because the path is free of any snow or freezes. I pay however attention at every step not to slide on wet stones. I catch a light but persisting headache, in spite of the acclimatization of yesterday. A tablet of ibuprofen doesn’t delete it completely. I force to eat on the road by sheltering me under the roof of a recently constructed building. The snow doubles near Dobato and I am happy to find Pemba Sherpa welcoming me with his good mood. We lunch together on a delicious dalbath with undefined offals, washed down with tea. At about 5:30 am, the icy snow crackling on the steel sheets roof, wakes me. It is more than a bad omen. I don’t rush for a departure at dawns… It will snow all day long and I begin to despair about the bad weather. Apparently, the blood of the Dashain sacrifices isn’t washed easily. I try to manage my day so that the time doesn’t pass by too slowly. The arrival of trekkeurs, in the afternoon, gives me the opportunity for lively discussions. Six French arrive from Yangle with a porters regiment. One of them shouts out to me brutally because he finds shameful to use the services of 12-year-old children, carrying an heavy backpack (30 kg). I may try to argue that he should pressure his travel agency, that it is none of my doing, whom I am myself simultaneously guide, porter, and trekker, nothing can be done but time passes and it is what matters! 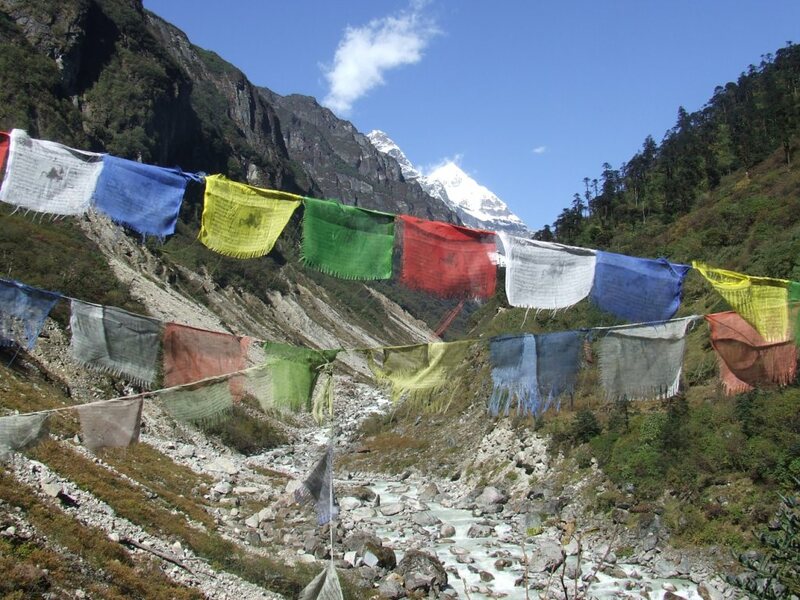 See Appendix » the trekker and her porters « . For reassuring me from my doubts of yesterday and/or surprise me, it’s full sun this morning! Enough to punish those who gave up quickly because of the bad weather and to reward my tenacity! 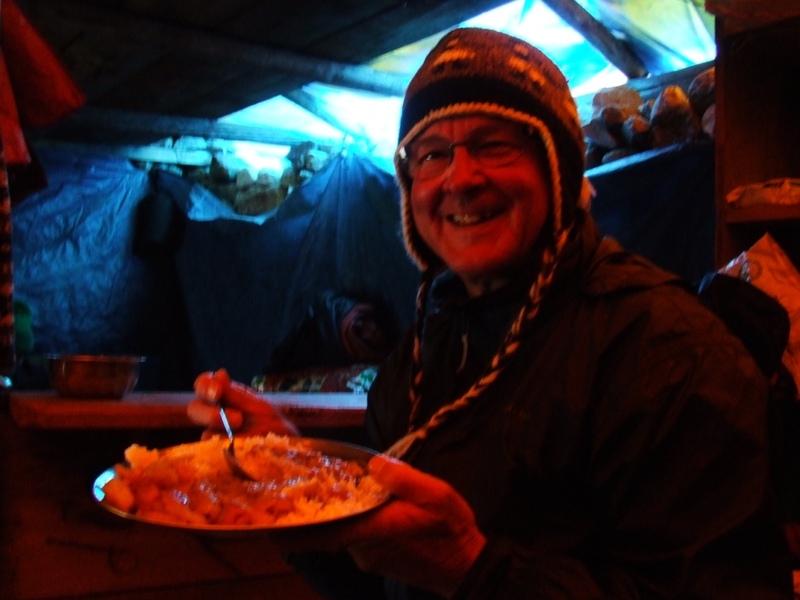 I left a few foods to Pemba because I cannot now stay 6 days on the Barun glacier. It is useless to overload. The mist rises from East, pushed by an icy wind. 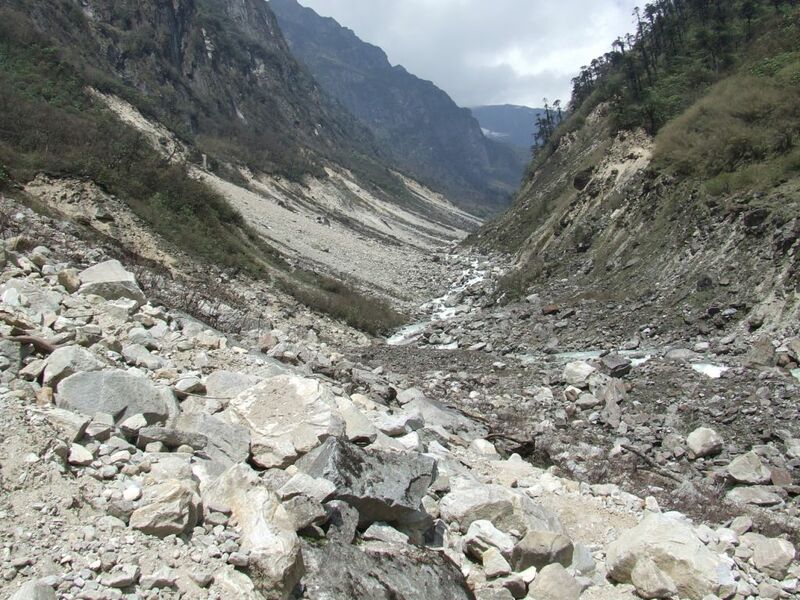 Masses of fallen rocks lining Barun were a little strengthened since May, 2014 and the progress is made a little more easily. To Yangle whom I find under the mist, the young owner re-knows me and I find a couple of Spanish met to Seduwa. They come back from the base camp where they found clear weather. It restores my confidence and courage. Another good evening at the corner of the fire. 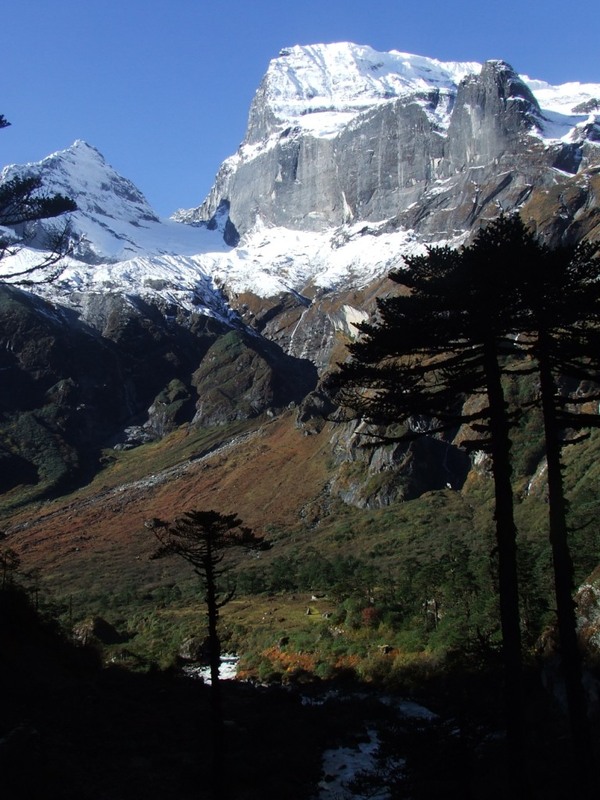 This is the third difficult day of the trek with a more than 1000m ascent. 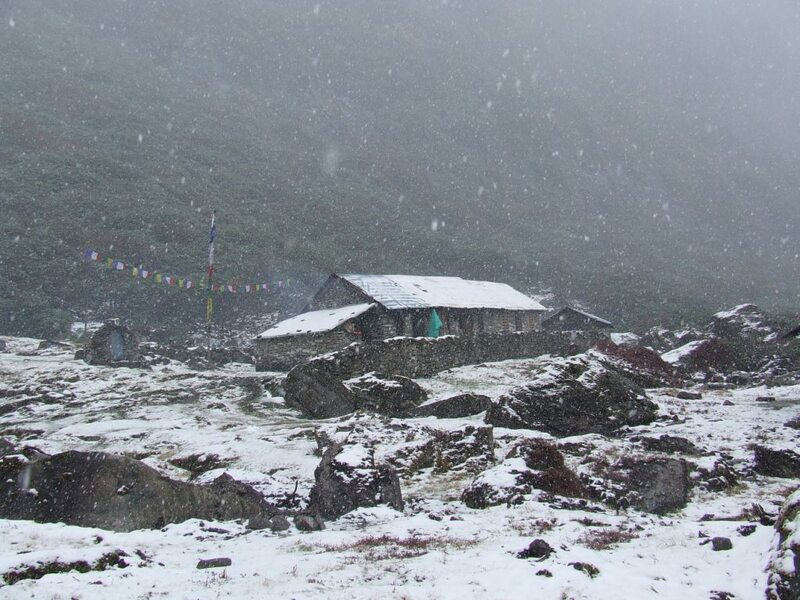 I consider that the acclimatization in Kongma and Dobato has to be enough. 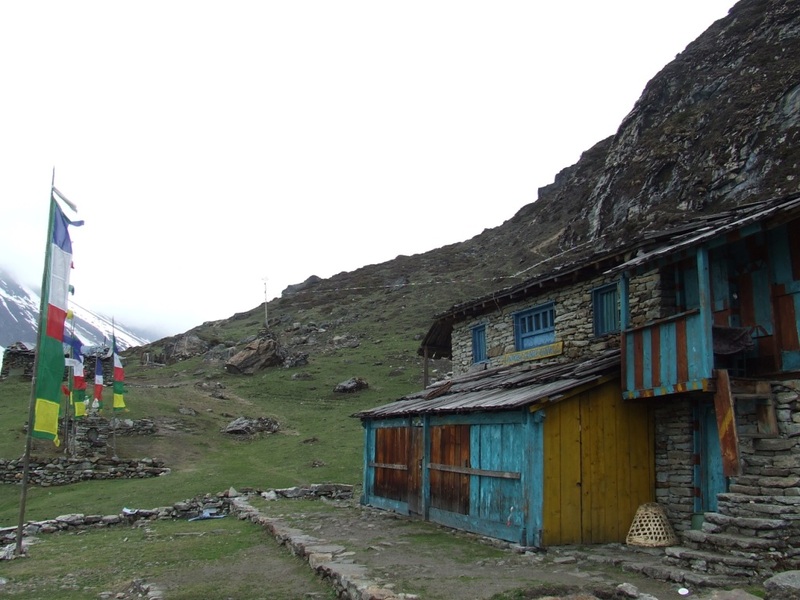 This year, the Langmale lodge is opened and allows a safety stop for trekkers without tent. 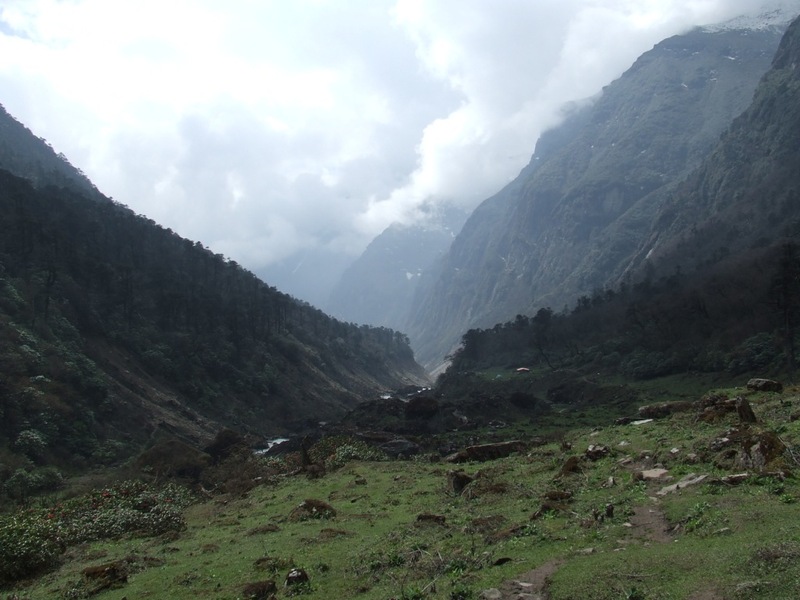 I have the surprise to discover the magnificent valley of Barun under the sun. 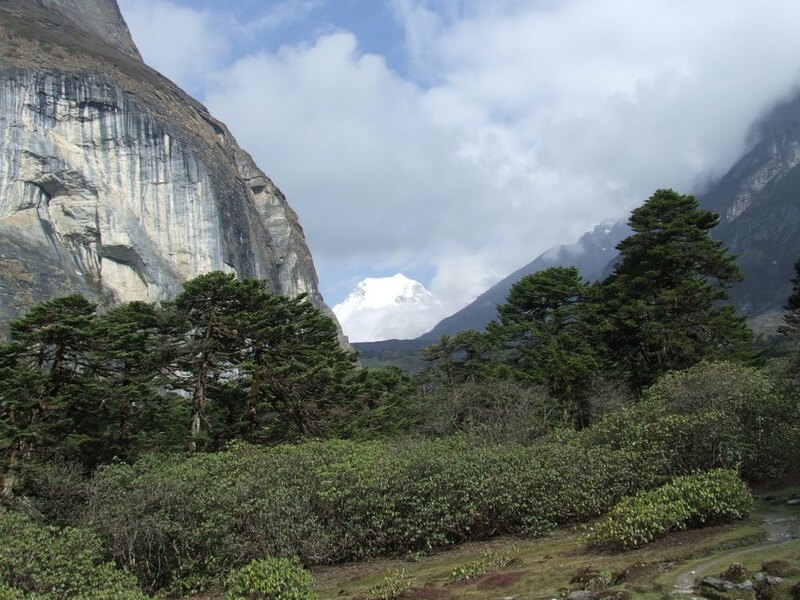 The landscapes are great, still very green and bordured with ochre, dark and gigantic cliffs. 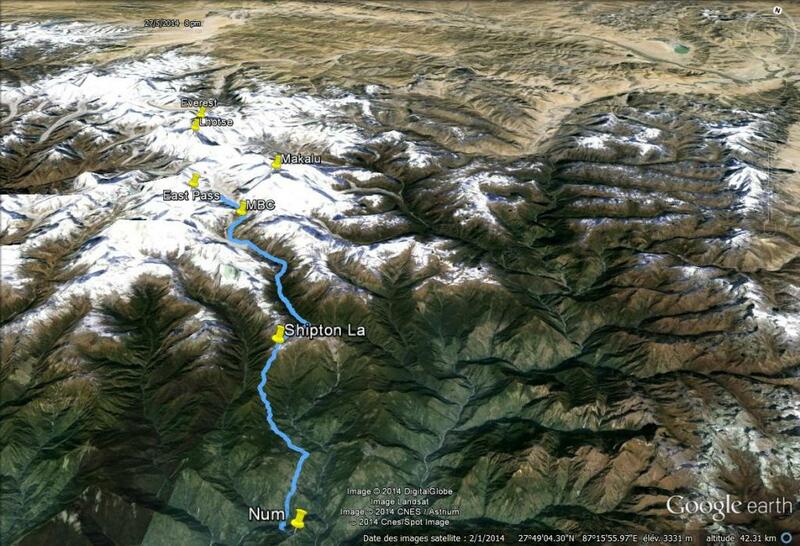 Farther are outlined the snowy high mountains which I have to join in two small days from now. A light headache accompanies me on all the ascent. The wind remains icy and the sun has difficulty in warming me when I stop to have a break. I only meet a young mom and her baby in all day. 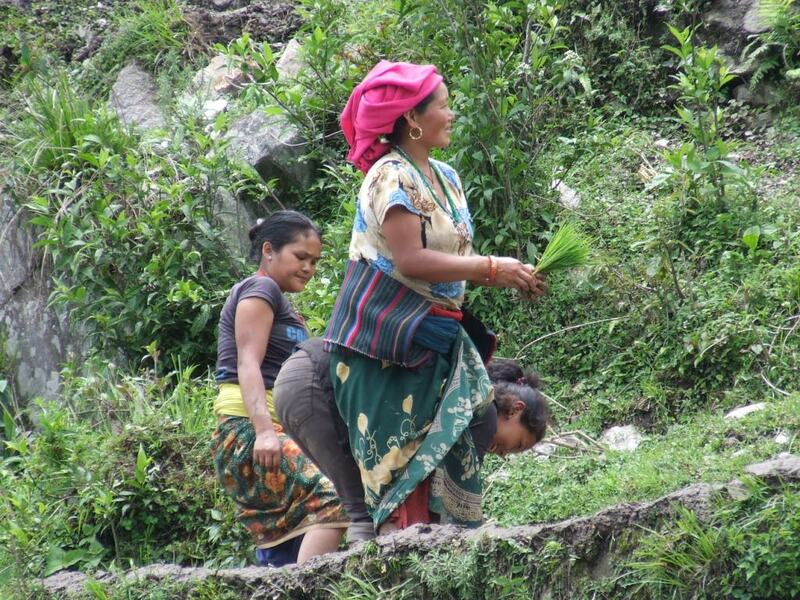 She asks me where are my guide and my porters. When I reply that I am alone, she remains very sceptical. This situation seems for her totally improbable. She leaves me with her doubts. I find my camp in Shersong and I put my tent in the same enclosure. The ibuprofen eliminates the headache. A chicken soup mixed with semolina is a delight. There is already nobody anymore here. It is the edge of the mineral world. The fine weather persists! 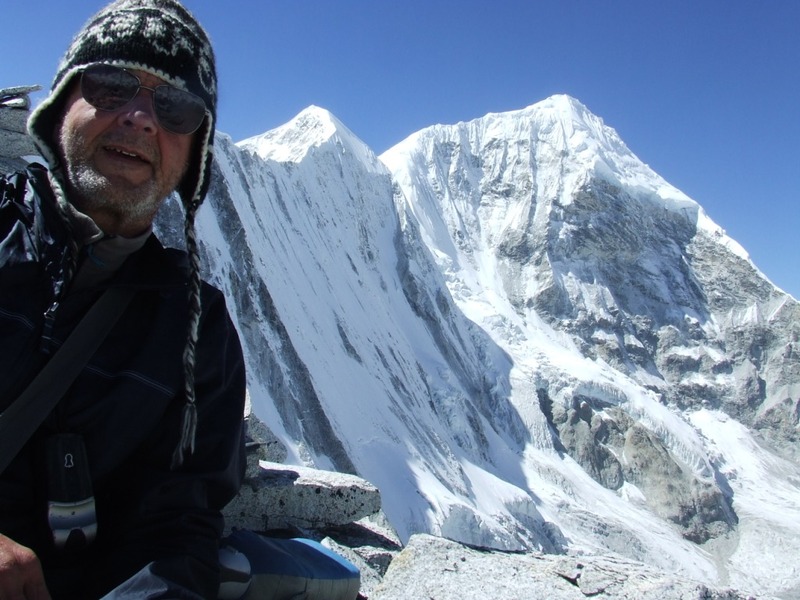 I can take advantage of the sight on peaks 6 and 7 (6758m) on one side and Makalu (8485m, the World’s fifth summit) of the other one. Everything is covered with hoarfrost. I need a lot of time to unsettle the camp, dry the sleeping bag and the tent. The sleeping bag dries on a stony low wall. The tent will remain wet at folding. At 2:30 pm, I have to face the facts: Sandy Camp disappeared. 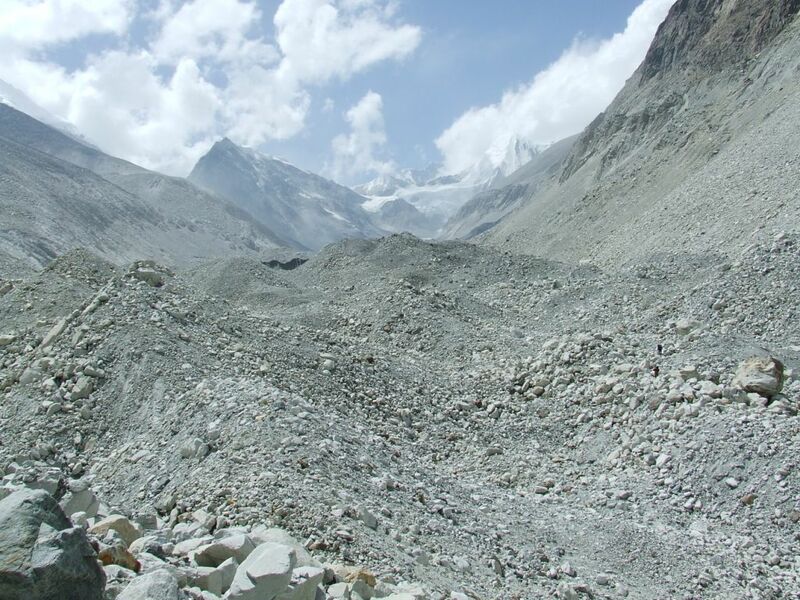 The moraine, with all the hillside of the mountain slid in the glacier. Itself is unrecognizable. 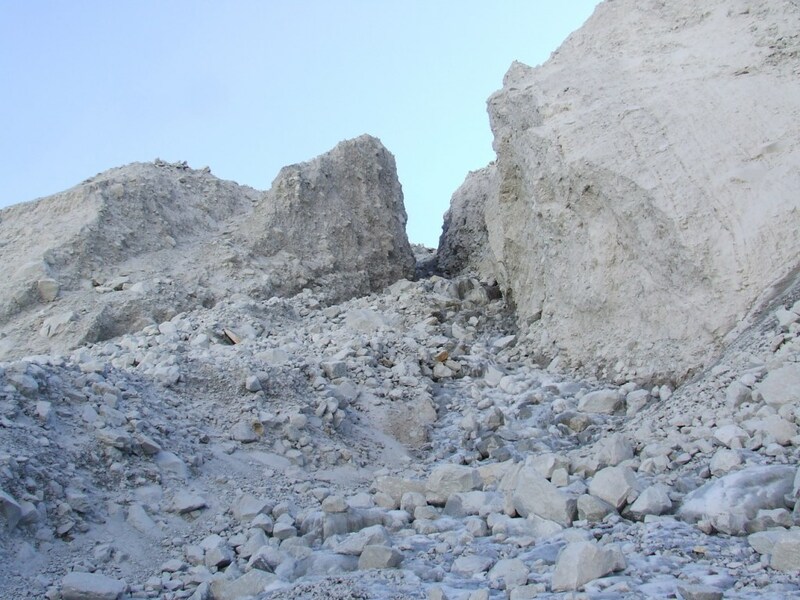 It consists of immense craters, mounts of stone and of gaping cracks. 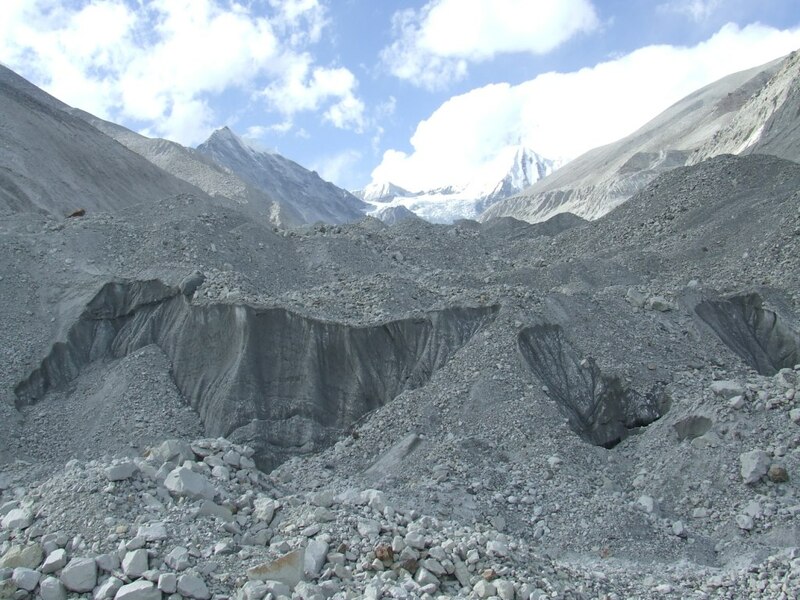 I continue to progress in sloping masses of fallen rocks and finally perceive on the glacier a small more or less horizontal headland. I move towards there slowly. This flat plateau of fine sand is crossed by small cracks. The ground is unstable everywhere but it’s there indeed I have to settle down for the night. I have no option. I have to go back to look for the water for dinner and breakfast in a crack. When I go back up, I hunt a crow which began to tear my bag of reserves. It’s about time! It didn’t have time to begin them. My new camp is 80m lower than the missing Sandy Camp. 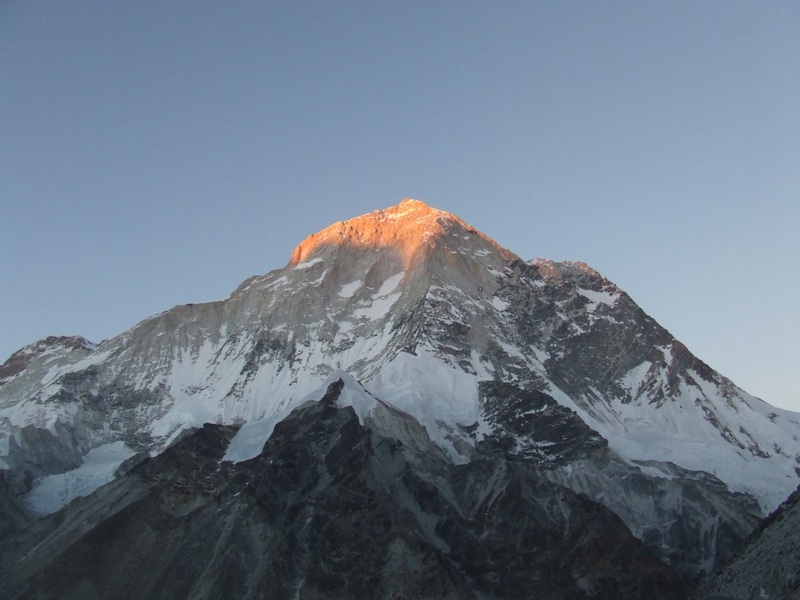 At nightfall, I can perceive the summit of the Everest behind Lhotse. The progress seems at first sight less difficult than yesterday. That’s not the case. 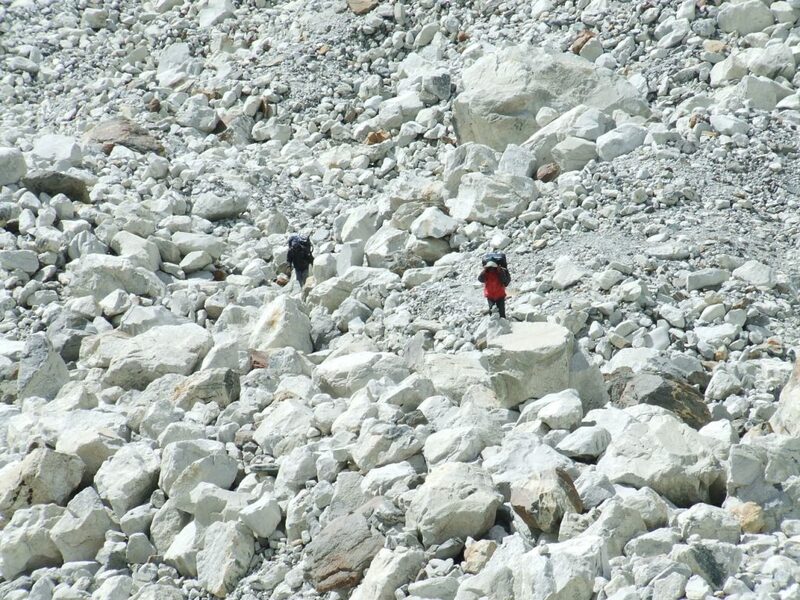 heap of mass of fallen rocks remain little convenient to the walking. I fall by twisting me the right ankle. A small pain will appear then from the slightest twisting. I am reassured to have taken anckle brace and compression wraps. 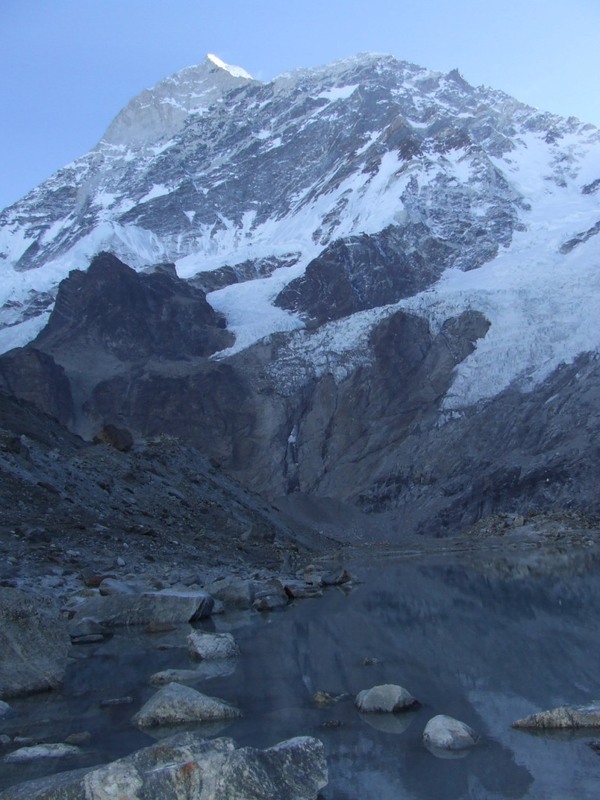 I had planned to approach the side glacier of Sherpani through the bottom, meaning from the Barun glacier rather than by the headland formed by the moraine. The destruction of Sandy Camp’s moraine doesn’t leave me the choice: it became the only possible way. 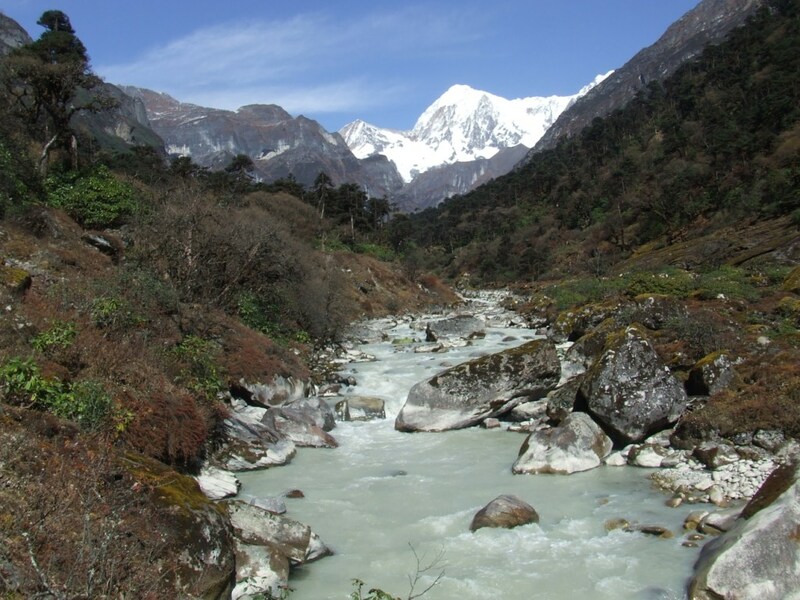 I go on in a narrow neck by which flows the water coming from the glacier. Here, nothing holds, whether the stones on the ground or the mud and stones walls dug by the torrent. I also have difficulties to find the camp of the last year. Everything seems to have been upset, here also. With less violence. I find footprints which confirm that trekkers passed here recently. 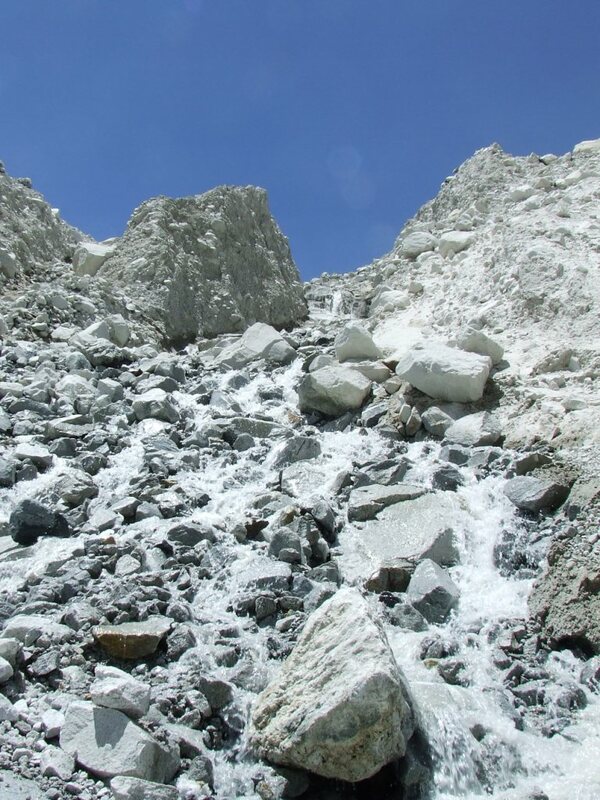 We had informed me repeatedly that two groups had tried to join Sherpani pass. I take advantage of the sun to do a small laundry and toileting a little. 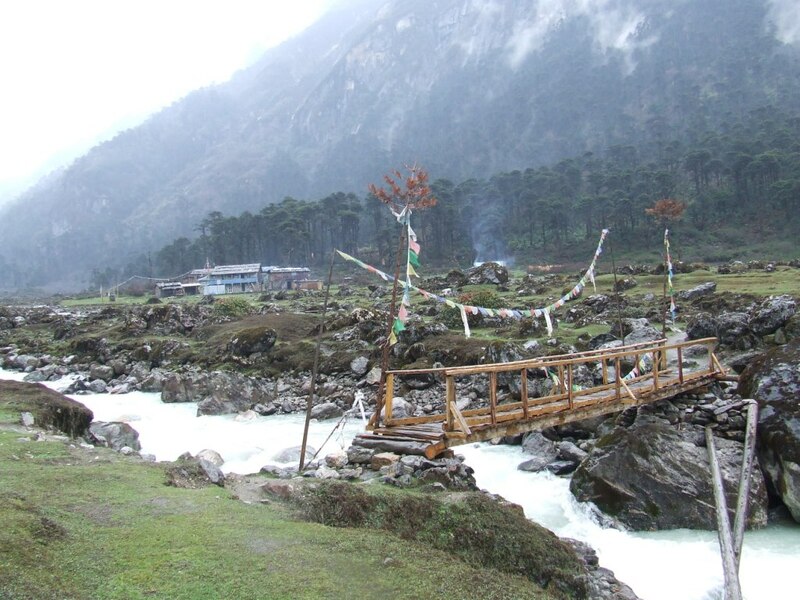 The water of the small torrent tends to go astray during after noon with its flowrate growing because of the increase of temperature. It comes to invade my camp! I build a small dike with stones and mud so that it stays in its bed. My ankle does not hurt me any more. The closure of the double roof, which worked already badly, dysfonctions totally. It is maybe because of the fine sand? I curse because it is the worst place where it could occur! I repair by drilling the fabric and by sewing all the opening with my rope which has a too important diameter. The repair will allow me to preserve a little of my heat. It is the D-day. All efforts which precede were made to overcome this summit. 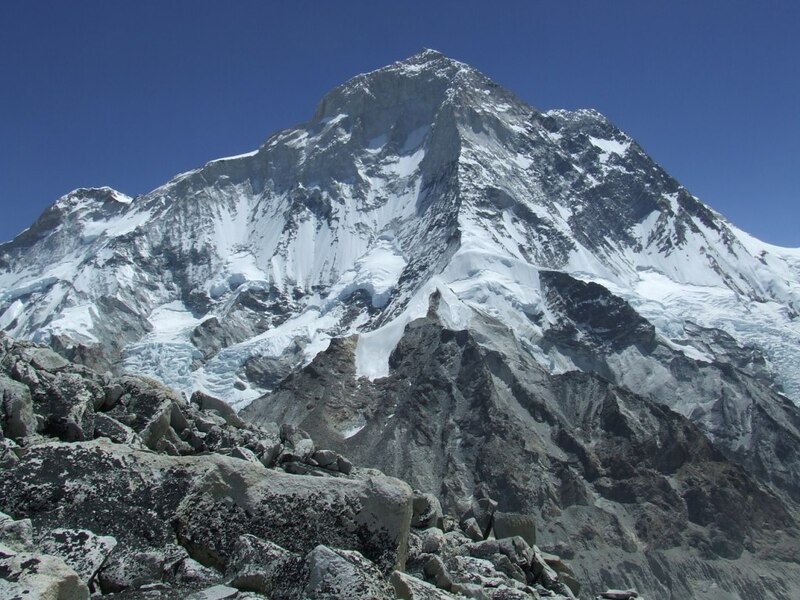 If the monsters which surround us, Baruntse and Makalu are inaccessible, the ascent, begun last year up to 5850m, seems feasible without particular equipments. 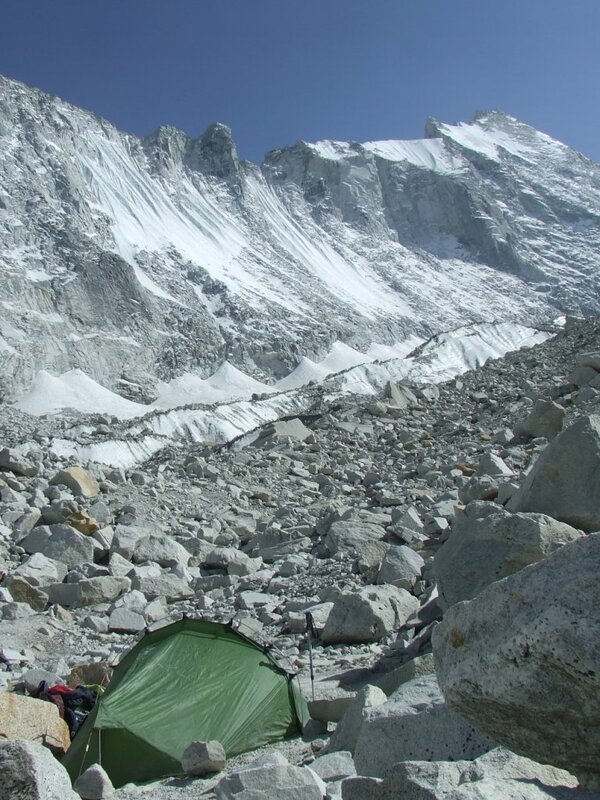 The base camp is perfectly placed and the weather, as since several days now, is totally cleared. 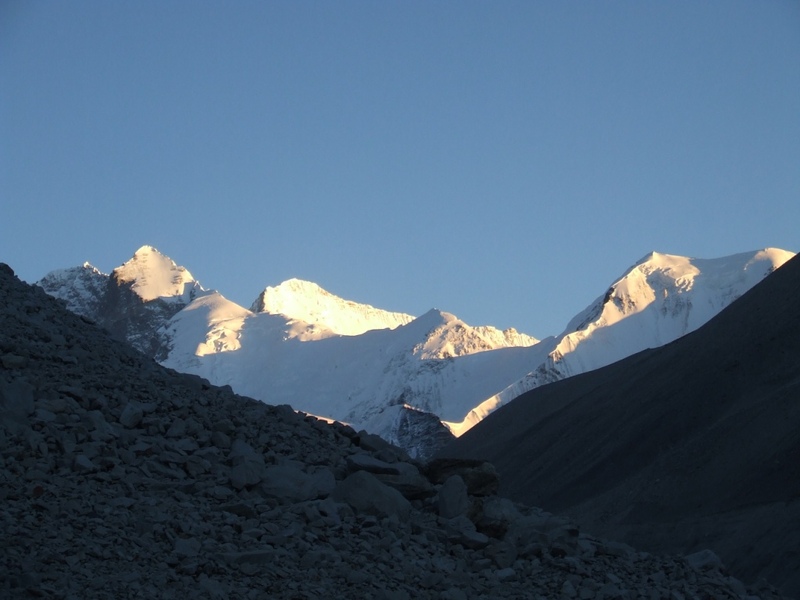 At the summit, I can discover the Baruntse as well as its glaciers and the massifs further to North West: Cho Polu and Lhotse mainly. 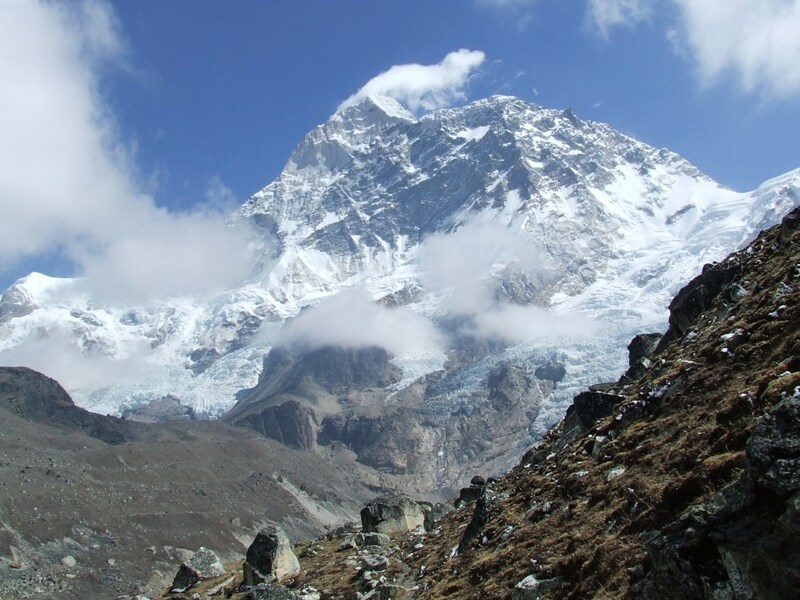 Everest guesses, hidden for its biggest part by Lhotse. I lunch at the summit and decide to descend by a channel composed of dust and gravels in the South side, which seems to me safer than the path for ascent. 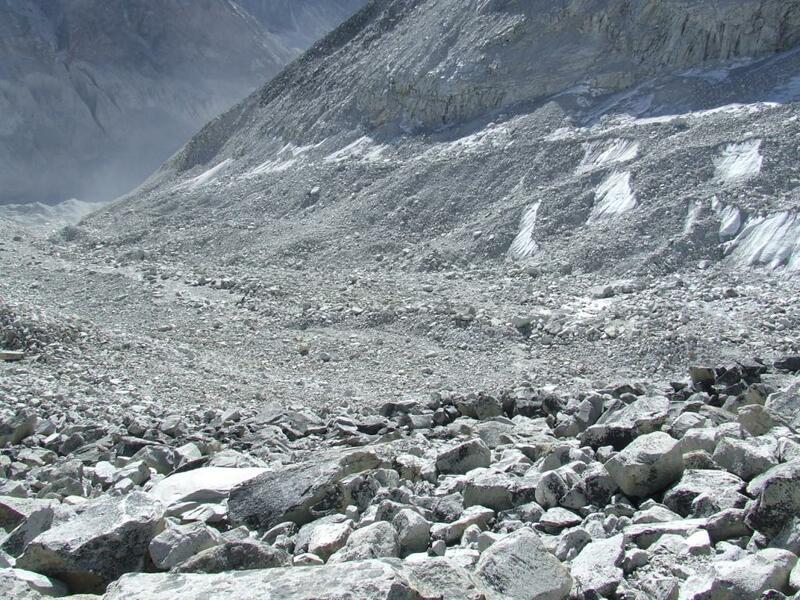 This descent goes on with bigger and bigger blocks to give onto the Sherpani glacier. I install my microspikes for the pleasure to walk on the ice. By progressing, I find footprints in the single file. 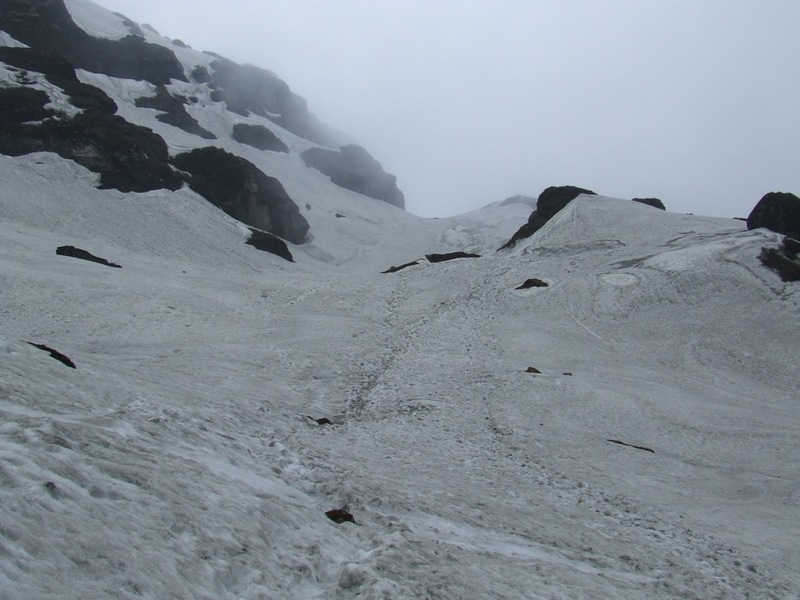 These tracks go to Sherpani Pass and confirm that a group at least went recently to this pass. I return bad-tempered to the camp. Kamepe Ri, in Scherpa means the mountain without snow. 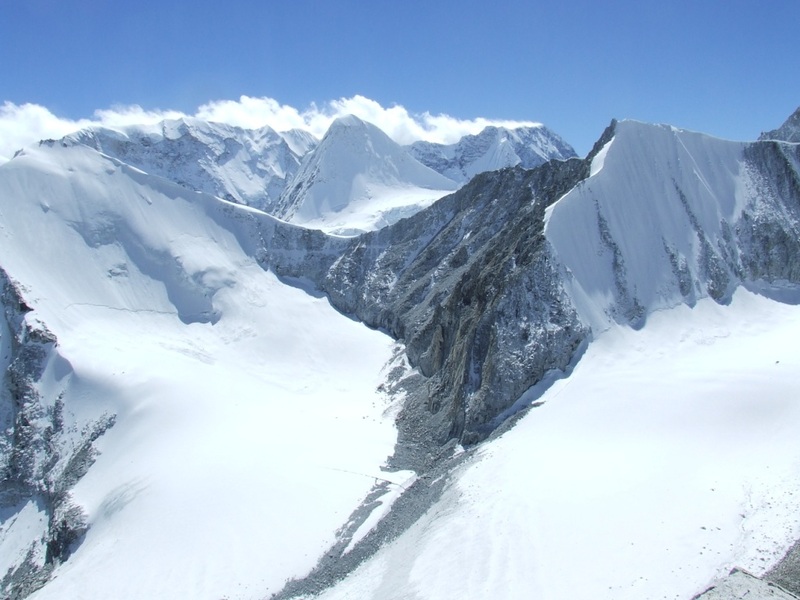 Snow is ka in Sherpa by growing longer the A, as in Turk kar (R not pronouncing, cause a natural extension of A). The etymology is probably common. These small details of the History of the Humanity fascinate me. It’s now my stove which abandons me during the preparation of the dinner. I may clean the jet and the oil pipe, I do not manage to relight it. It is maybe the pump. The breakdown is rough in any case and I have the dirty hands of soot. 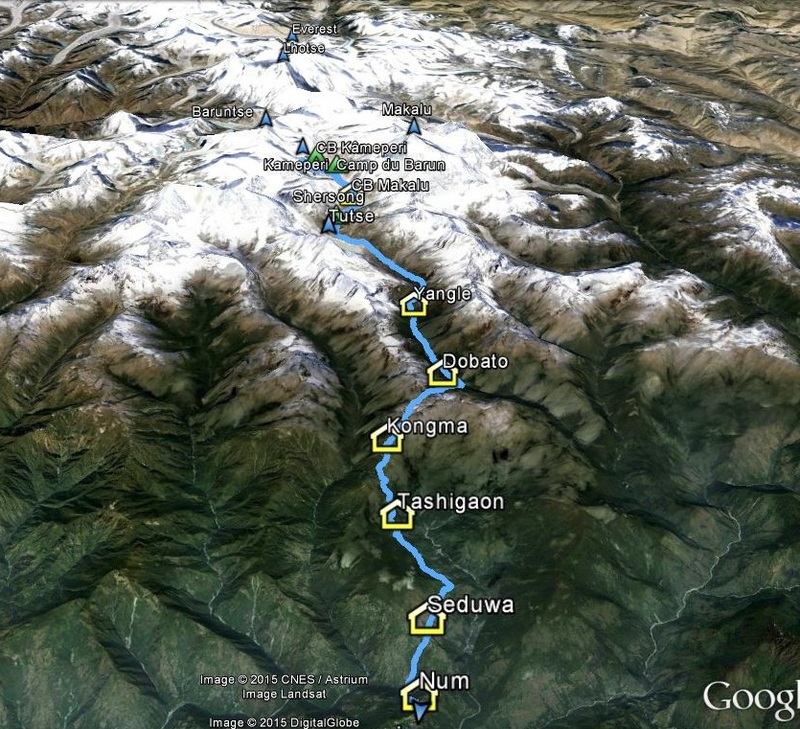 This last event incites me to give up staying one day furthermore to try to join Sherpani Pass. I shall content myself with the beautiful victory of today. It is what we have to call the Wisdom! More than the material troubles, the return towards MBC annoys me. I know that, what about is the path chosen, it will be dangerous and exhausting. 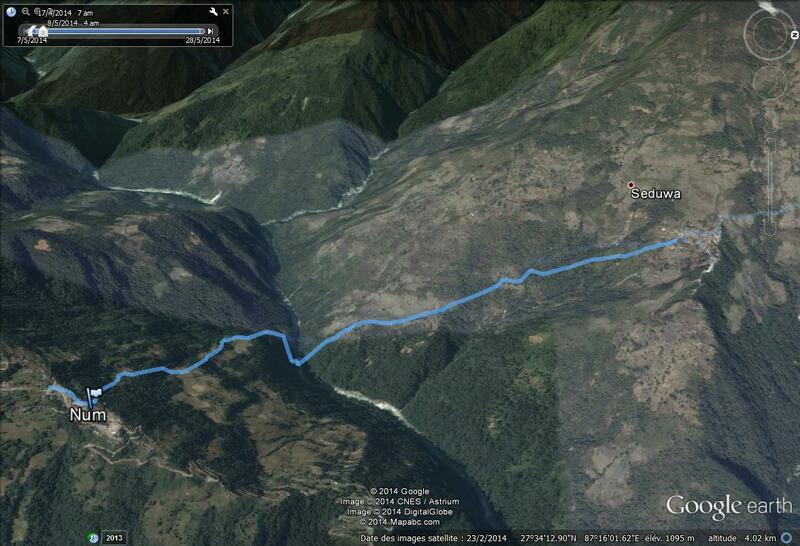 As I went with difficulty by the border of the glacier, I choose to return by a more central route. 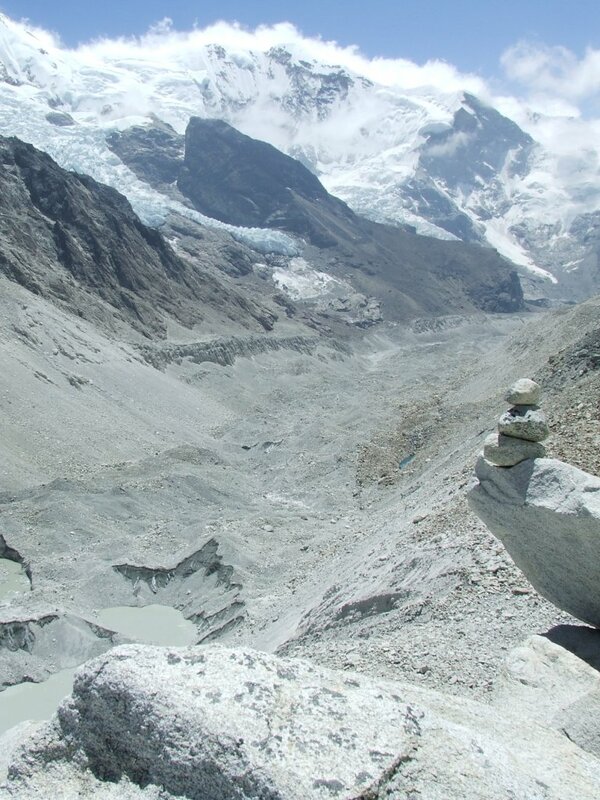 I begin the return by following a series of cairns on the Sherpani glacier. 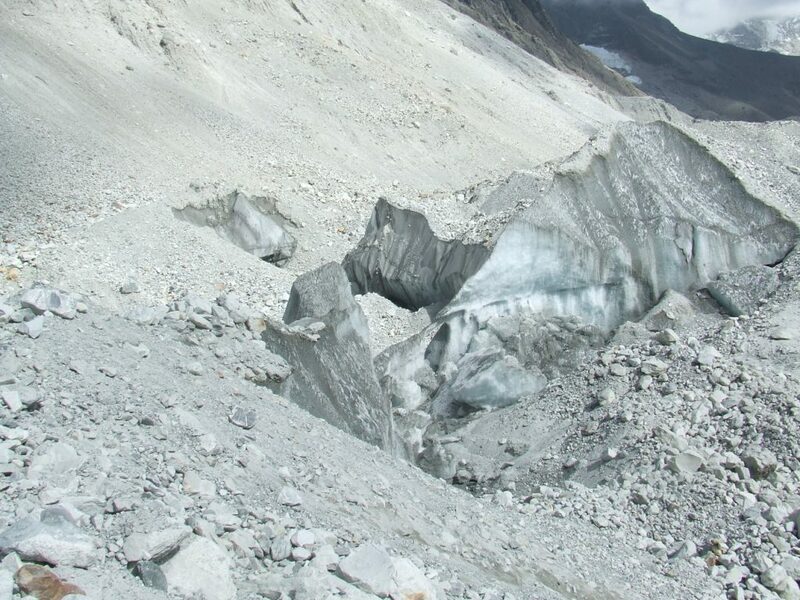 These disappear in the neck joining the Barun glacier. In this battlefield for giants, it is sometimes necessary to lose more than half an hour to avoid a crack appearing at the last moment: there is no global visibility. I slip down on an ice banister of ice to win some time. I also try to avoid the biggest hillocks and the funnels of mass of fallen rocks. Time goes by and I move forward very slowly, approximately 300 m/h reported to a straight line. 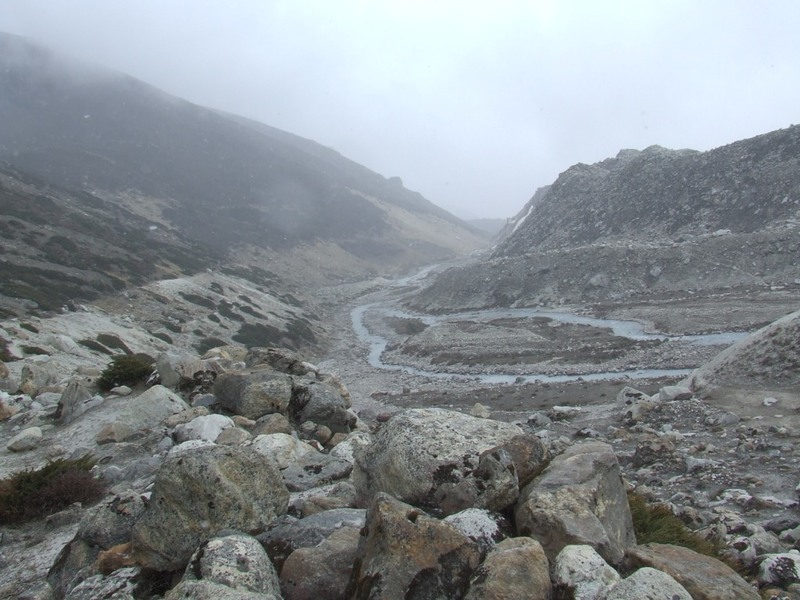 When I reach finally the limit of the glacier, I continue by following the bank of the rising torrent, hoping to join the base camp without bother. I notice that it is not the good solution because it would be necessary to follow the long bends formed by its meanders. On the other hand, the tempestuous water often prevents the progress on the bank. I thus decide to join the beginning of the path, in overhang, with the GPS. I have not joined the path yet when the night begins to fall. Fortunately, a half-moon, already raised, is enough to light meagerly the obstacles in my acrobatic progress. 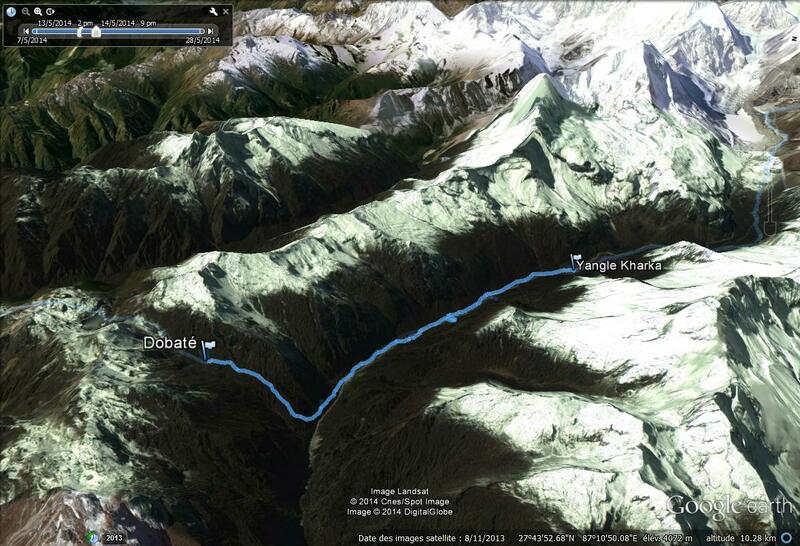 I have to walk even more than one hour before finding the base camp. It is a particular feeling that that to hear voices again far off and to smell the smoke of the wood fire. 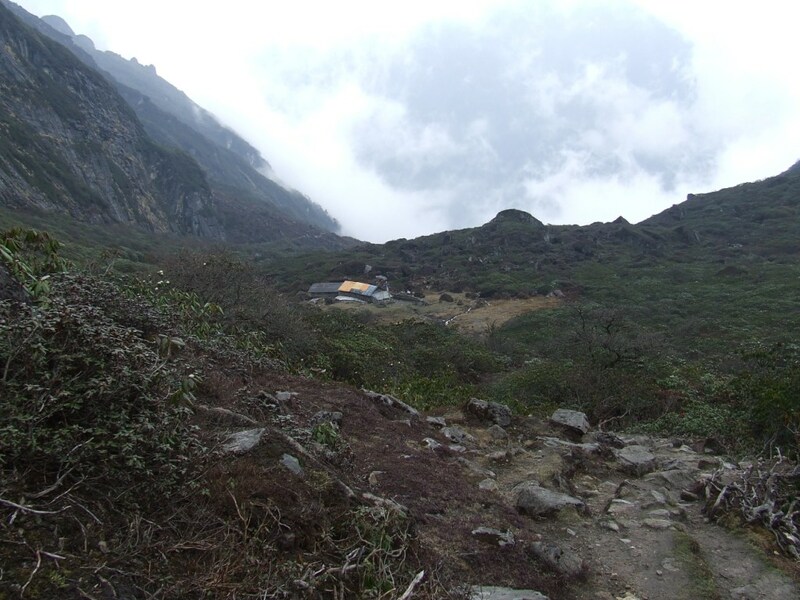 I rush into the only one lodge open, exhausted by 9 hours of unpredictable walking, strewed with falls. My back will keep a painful memory during several weeks (month?). 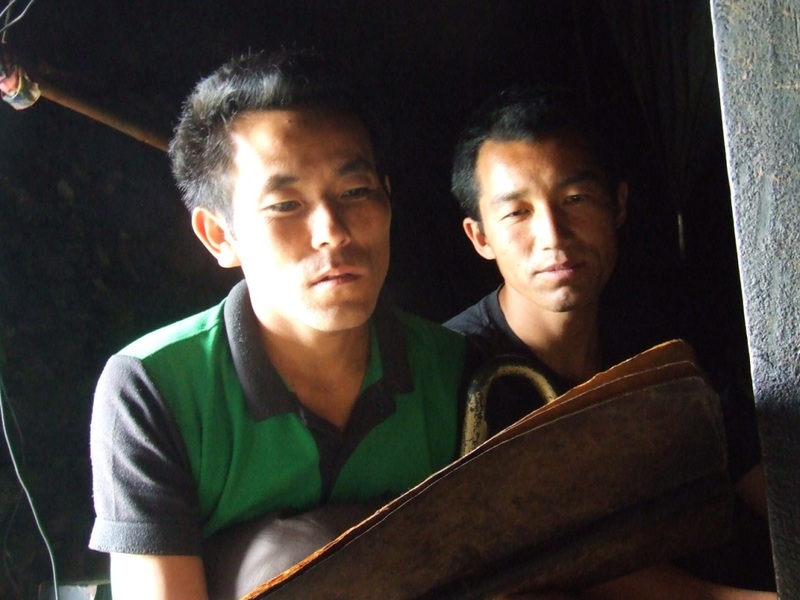 I spend the rest of the evening with a couple of French, tenants of a house to Patan. 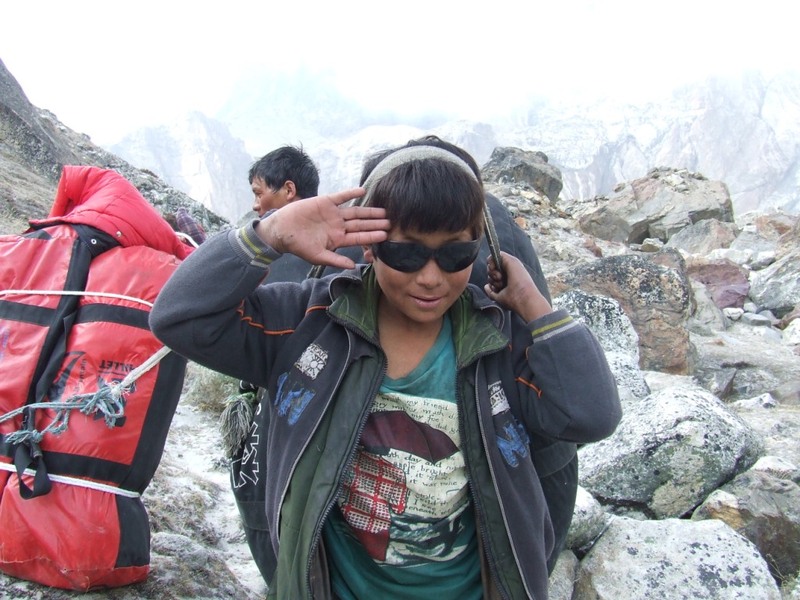 They want to join Khumbu via Sherpani with their guide. Good luck! 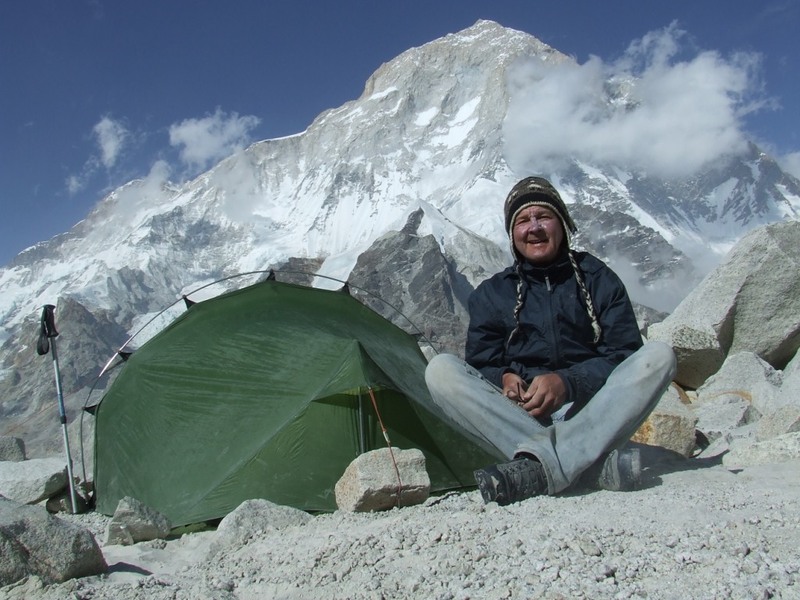 The weather is wonderful in the base camp. 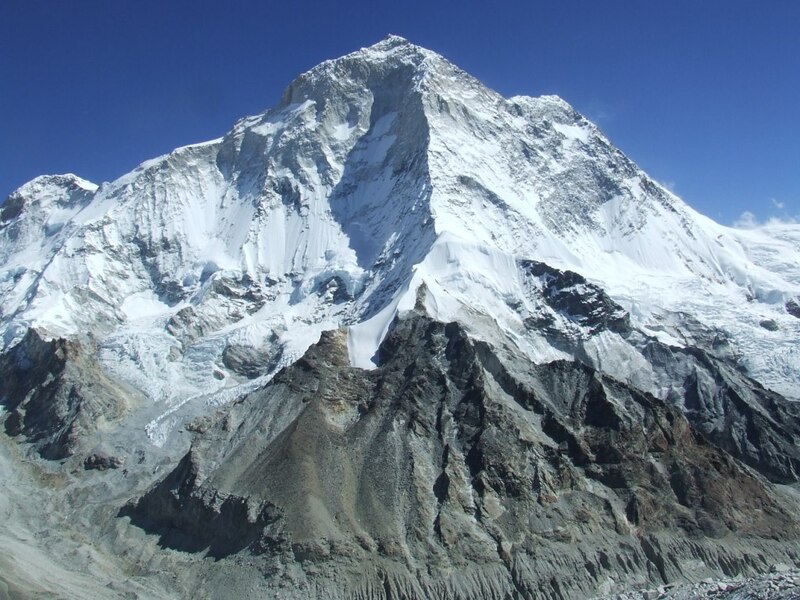 Makalu, majestic, always thrones so near. The path doesn’t present no more difficulty, especially with the bag relieved by 4 kg of food. The weather covers itself gradually in the morning and the snow begins to fall well before the lunchtime. I cannot put any more my gloves because my fingers are hurt and painful by the numerous catching up on the granite blocks of yesterday. I cross a procession of numerous Japaneses rising towards the base camp. Some are equipped with umbrellas. In the fog and the snow, this show is phantasmagorical. I force to stop and lunch in an abandonned shelter. There is not a soul around here. The nature covered itself with a white coat. By leaving, I have difficulty in finding the way from time to time. I arrive finally to Yangle kharka which looks like a Christmas card. The lodge is padlocked and I am afraid of having to spend new night under the tent. 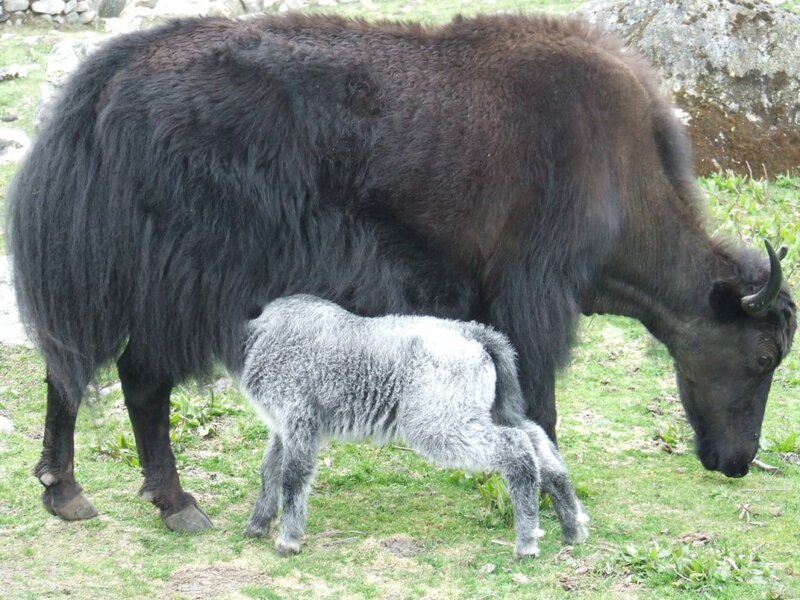 The owner waves me from the other side of Barun: he gathers his 13 yaks with his companions then he will join me. I can settle down on the first floor, remained open. Finally, it is me who join him because he waves me again. 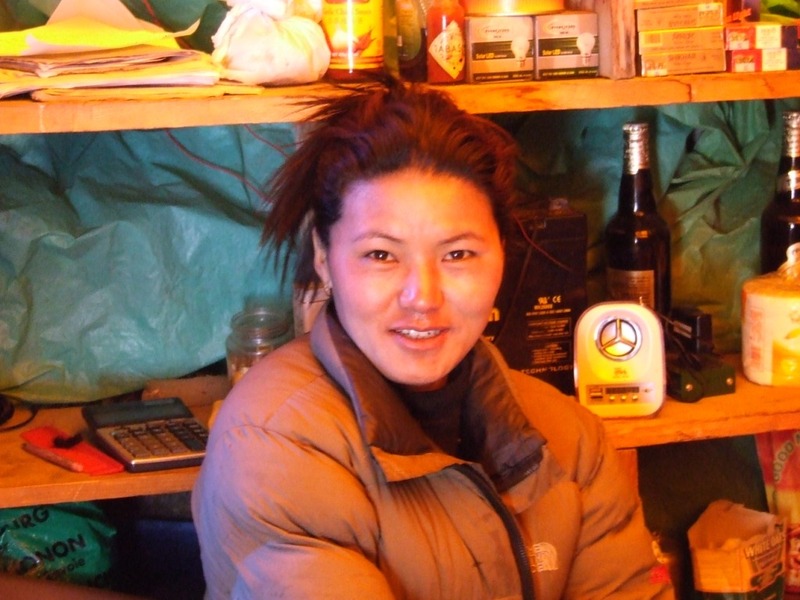 In a small wooden shed, an improvised party has begun: eleven of the yaks are parked. Two ran away in the jungle but they will be found. Each day has enough trouble of its own…nobody is worry. The herd is now ready to join Tashigaon for winter. It’s again under the beautiful sun that I continue the descent on the valley of Barun. The small icy East wind begins again to blow. My back hurts me quickly and I am obliged to stop more often to ease the pain. 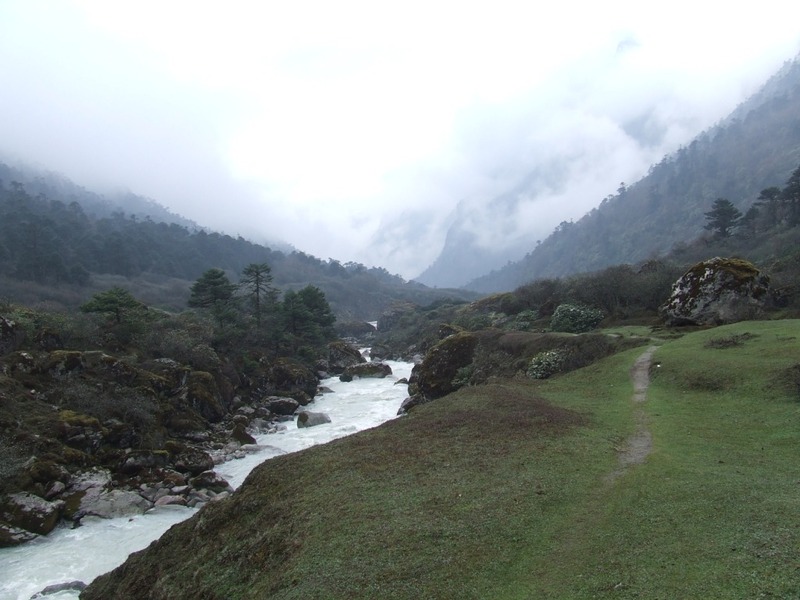 I don’t meet anybody on the road except two trekkers going up towards the base camp. The weather is mixed this morning, with some bits of blue sky which will quickly disappear. When I arrive at the first of the four passes, the fog wrap me. The local gods protect me from the rain and from the snow. I have never gone through these passes under a clement weather! 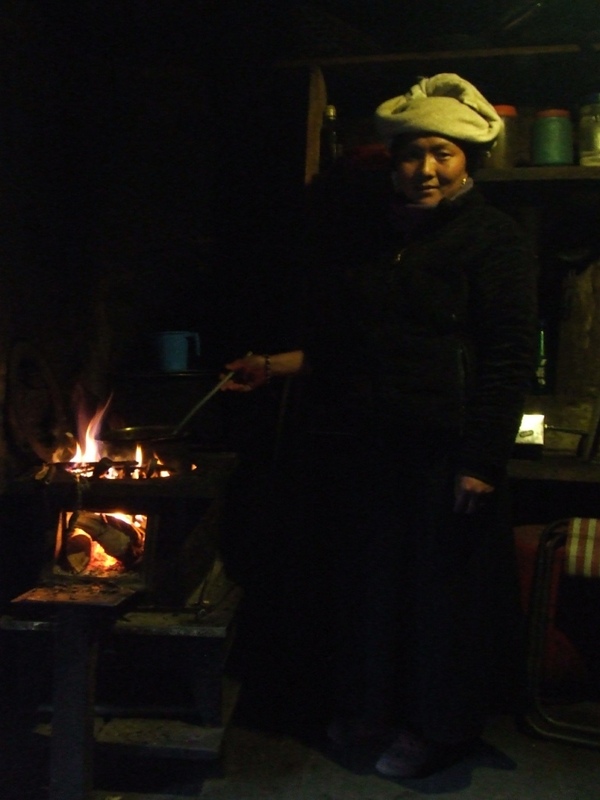 A nice team of Italian settled down in Kongma with their own cooking. It will limit our exchanges. The owner of the lodge phones to Num (Japanese Sherpa Lodge) to book for me a place in a private jeep for return to Khandbari. Indeed, the shortage of gas would make the return impredictable in public jeeps (?). It is a long day of descent with a climate becoming again soft. My place in jeep is confirmed in the evening for the next day at about 1 pm. It belonged in Dobato and it had rained all day long. This kind of days, time goes by very slowly and it’s necessary to learn patience. There is nothing to make that to read, as slowly as possible, the only embarked book or to empty the spirit by trying to warm ourselves closely to the woodfire. 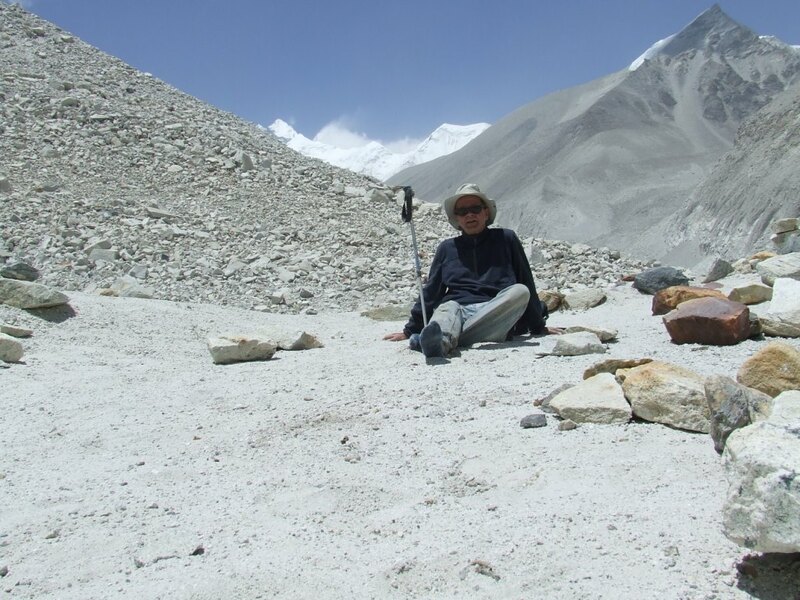 A femal trekker arriving of Yangle Kharka extracts me from my torpor . The afternoon is half moved forward, as stuck between a gloomy morning and one evening which doesn’t arrive. I examine her in detail: she is dipped, drawn features and seems angry. 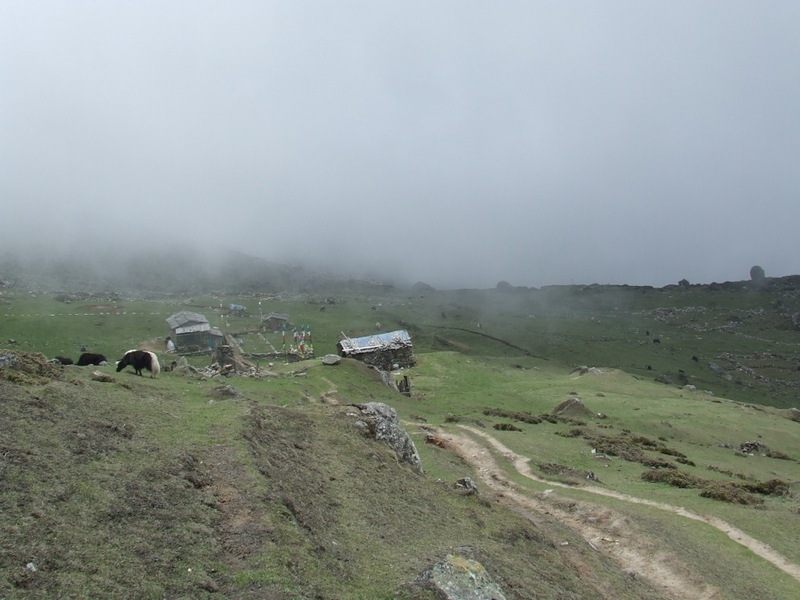 The ascent towards Dobato is a torture under normal circumstances and the rain had to transform every stone into formidable trap for ankles. I show that I feel sorry by a smile. My mimic is an invitation to the conversation. Having drained more or less, she gets closer to me of a warior step. 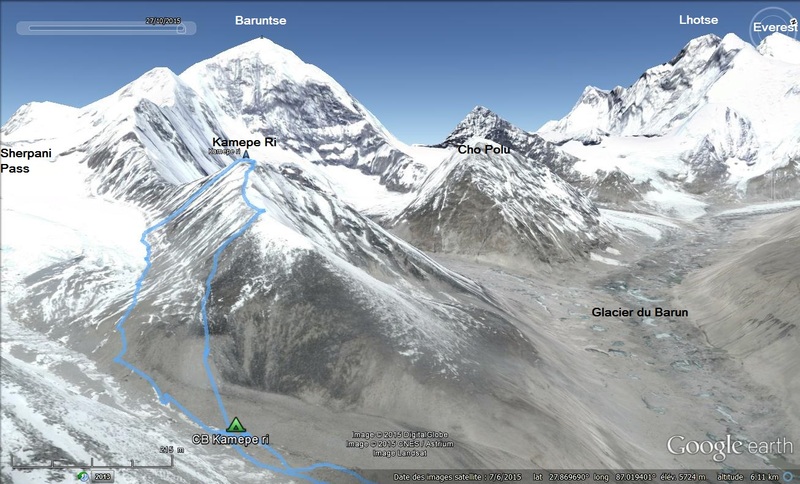 access to Shipton La, I organize a new trip towards Makalu, 5th summit of the world throning in 8434m. 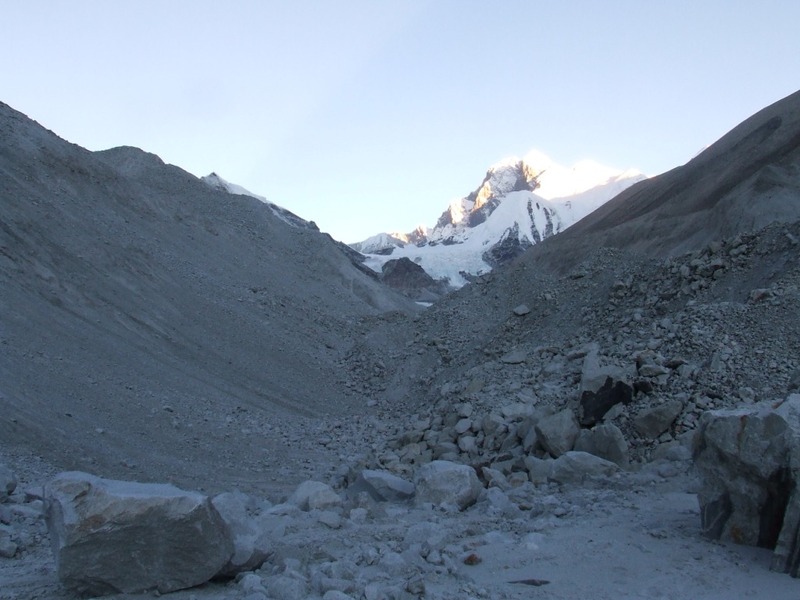 The objective is to by-pass it until « East Pass » at 6150m, full stop of the project, to have it just 2300m up, in front of me. 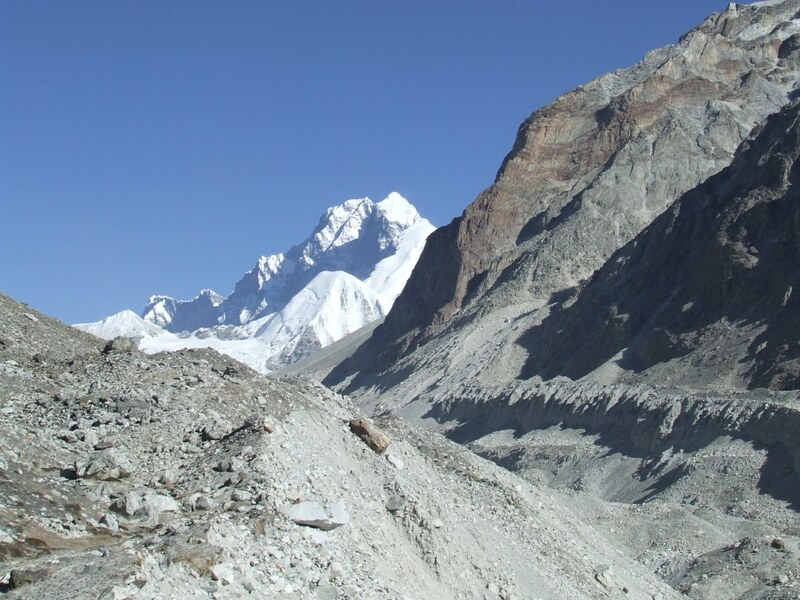 Beside the meetings with our friends of Khandbari, Seduwa and Chyaksa danda, it is a ballad in 17 days with a total difference of altitude of 5400m, on a round trip distance of 130km. 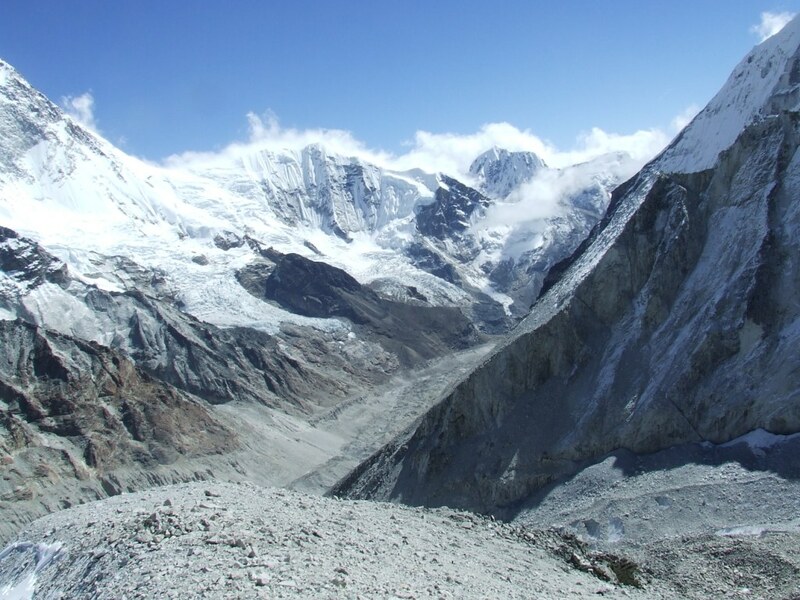 Valleys and crests leading to the monsters of Makalu’s high mountains do not deny their reputation: the sky will be hardly blocked, up to the Base camp of Makalu (MBC). The rain will sometimes be present at the end of morning. Going up, the weather clears up to give way to a perfectly crystal clear sky during my four days and three nights of isolation after MBC. This respite will plunge me in a fabulous universe, which will mark my dreams as much as my shins: the trip is dangerous on a big part of the route, without path in the masses of fallen granit rocks of sometimes several hundred kilos in unstable equilibrium. 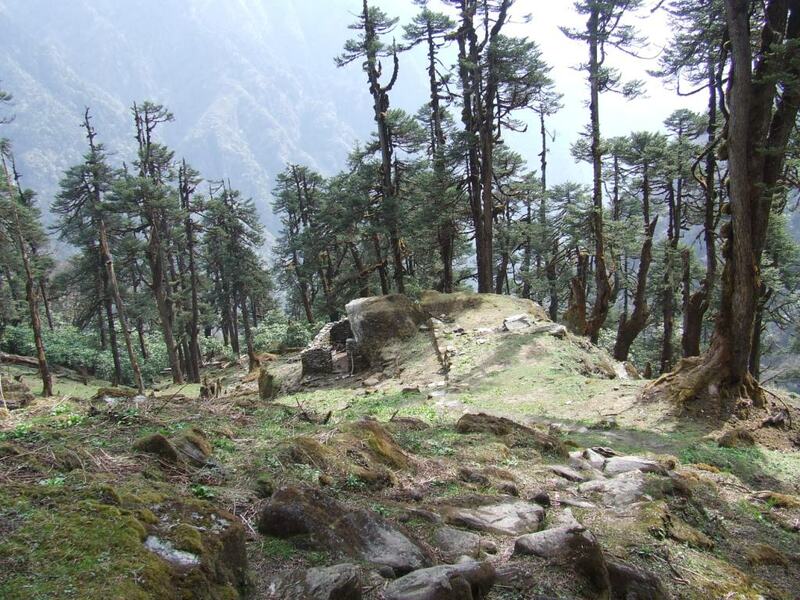 With three foreign walkers met in three weeks, we can say that this trek is confidential. This Sherpa’s region would be worth nevertheless being better known, so warm than it is not need to know how to speak their language to exchange and spend long and unforgettable evenings by sharing Rocksi without moderation (Arack in Sherpa: alcohol of millet distilled once) and Sucuti (dried meat of yak recooked in the wood fire) and the unchangeable dalbath. 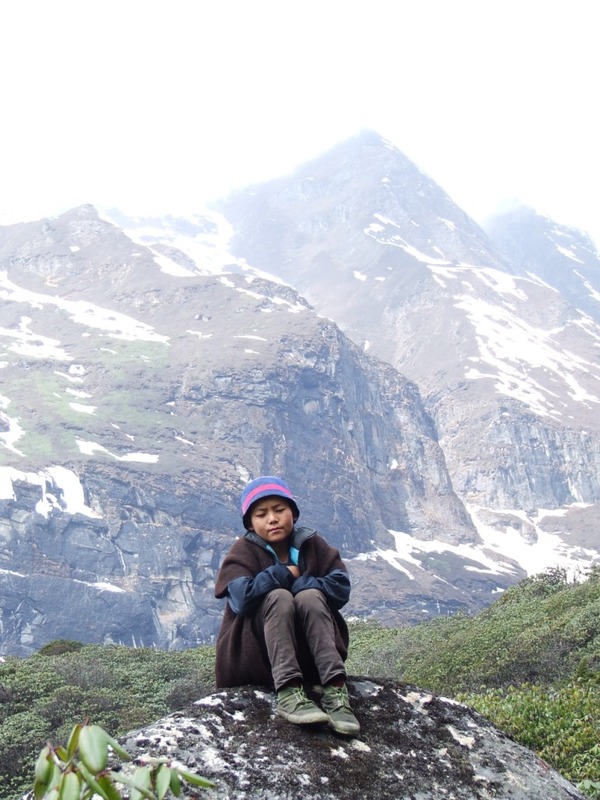 It is precious to discover their culture mixed with cheerfulness, innocence and frankness…hoping that it remains for a long time hung on on the sublime hillsides of their sacred mountains. 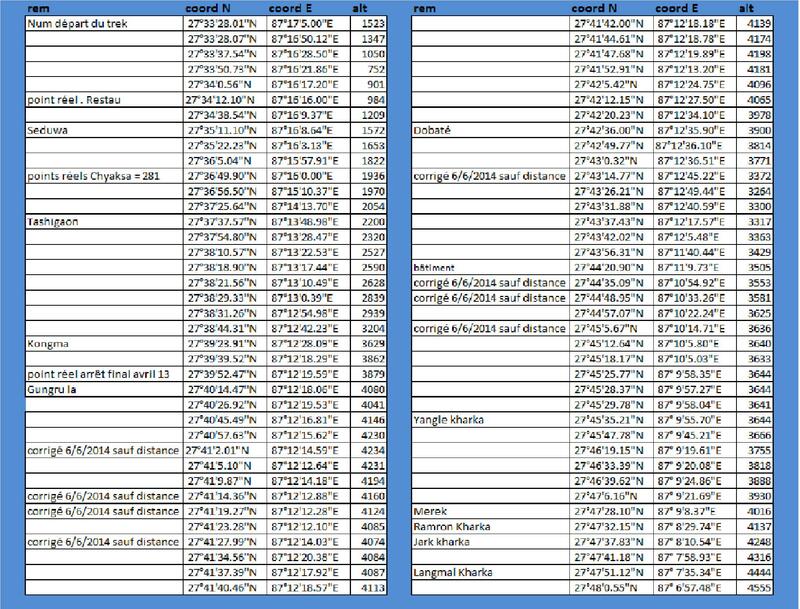 The route and the stays are positioned with the help of Google Earth ( GE ) and points entered in the Garmin GPS. 5 Days of autonomy are planned (2.6kg of food + tent). 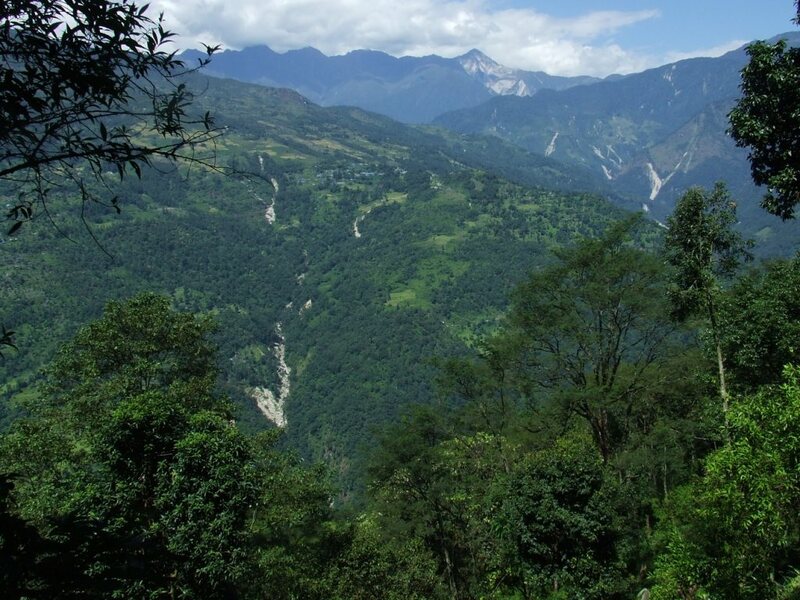 I am accompanied with my friends of Friends of Nature to Tashigaon then alone up to the East Pass’ Belvedere. It is necessary to take back the good habits after 3 hours of expectation and pay the last seat which remained desperately empty to be finally able to leave. 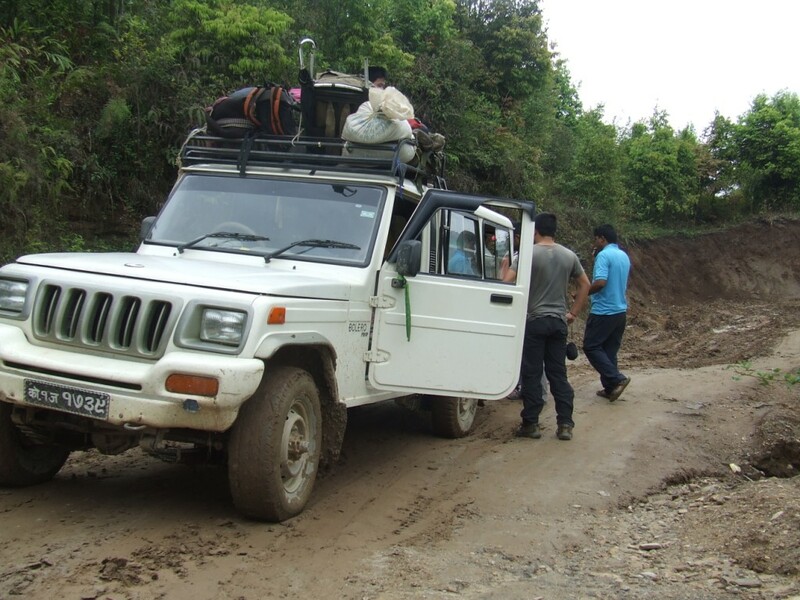 Finally 4 hours of jeep between Khandbari and Num on an chaotic track opened five years ago. This time, we are lucky because the rain does not fall. 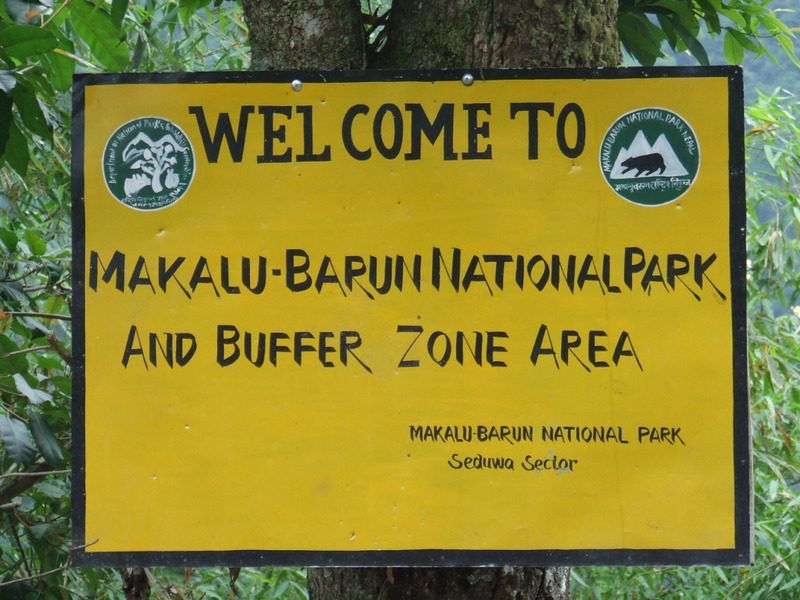 The trek begins only towards 1 pm after an inescapable dalbath in Num, giving strength enough for the route. I have to get used again to the bag, which destabilizes me at every false step. The descent from Num is vertiginous. It avoids a real cliff which falls in the Arun’s bed. I have difficulty following Sanjaya, been used to the path. We arrive shortly before the nightfall in Seduwa. Our friends wait for us there and reunion will be celebrated with the local Tongba (beer of millet which continues to ferment with the successive additions of hot water in the mixture). A turista takes shape in perspective. It is unfortunately a good idea to avoid Tongba and Chang unless if the water being used is enough boiled or was chemically treated before. 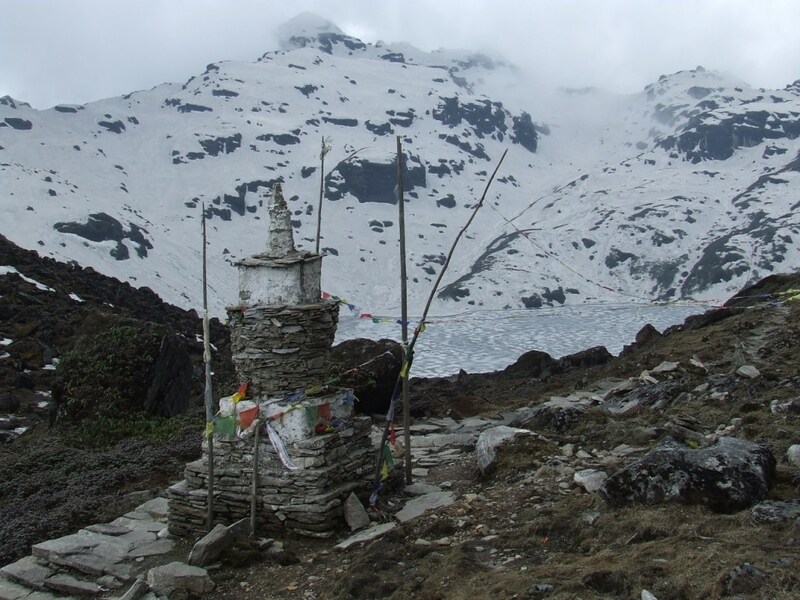 Thursday 8 and Friday 9 – Interruption of the trek. 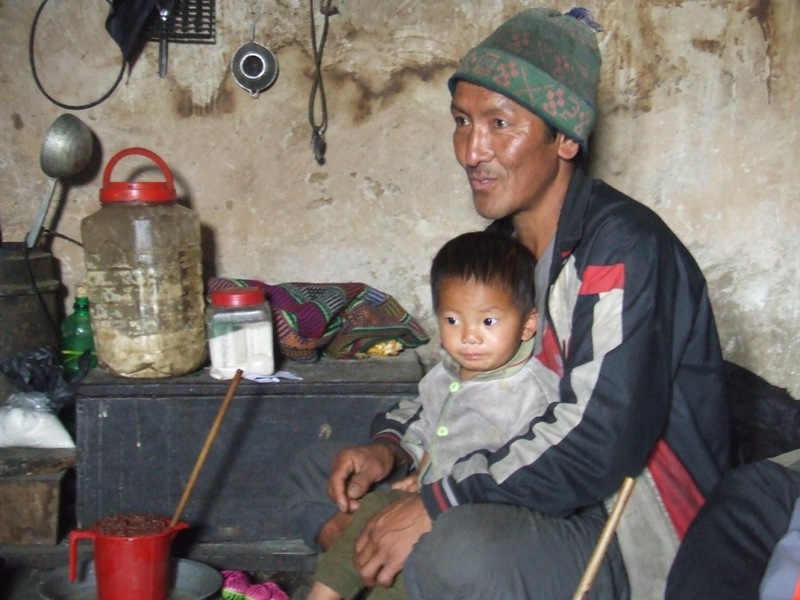 It is an ideal opportunity to enter Sherpa’s houses and share their everyday life. My friends translate but it is not need for words to appreciate the tchang prepared by the hostess in front of us. The principle is to never let glasses empty. They have to be always full. 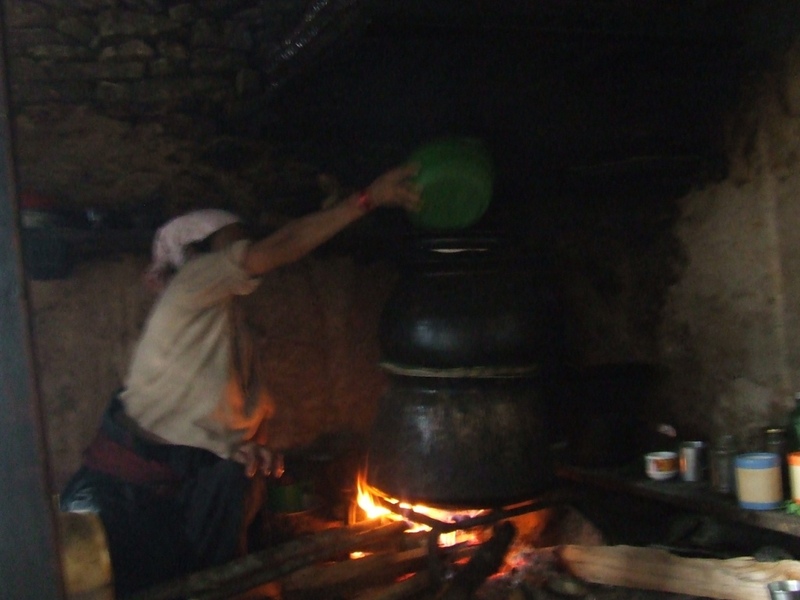 We also attend the distillation of this beverage which will take the name of Rocksi to Arack or still Local. The cold source is situated in the superior pot and must be regularly changed to allow the condensation of the distillate. Contrary to Tchang and Tomba, this drink is completely safe for the digestive system. We continue to walk in rice fields and I discover my first leeches. They hang on to soles or to clothes when we touch them. They infiltrate then under clothes to quietly drink the blood. They are plenty between Seduwa and Tashigaon but I’ll not see them any more afterward. 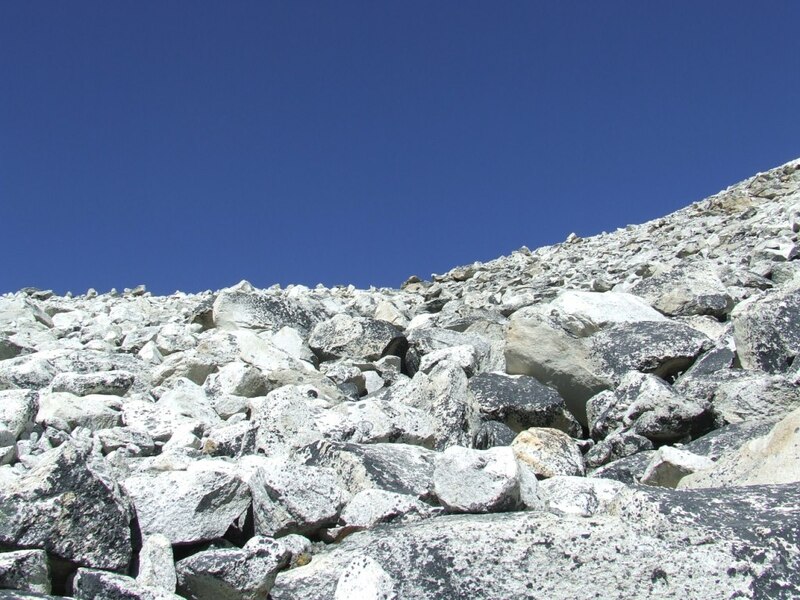 To avoid them, it is necessary to walk at maximum on stones and avoid the edges of paths. 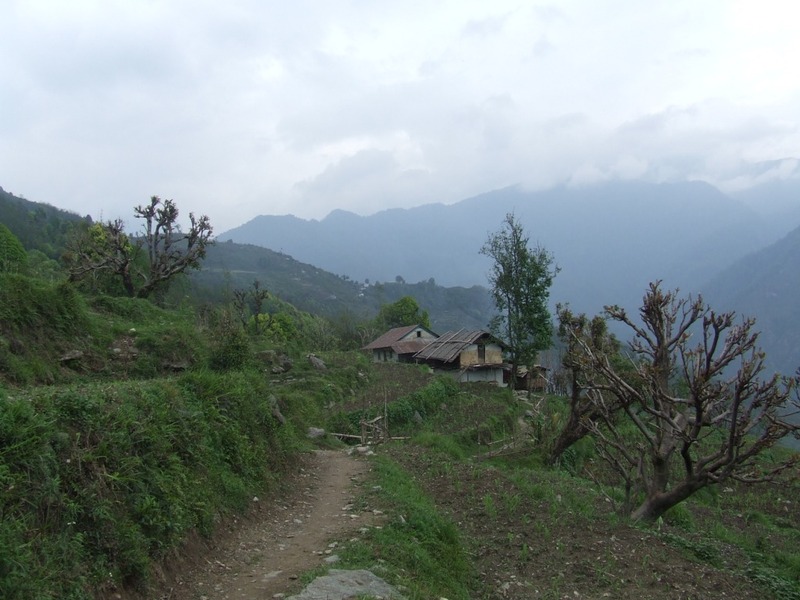 The country remains peaceful and hot.The overcast weather does not allow to distinguish the surrounding mountains. In Tashigaon, we celebrate my solo departure the next day with a lot of beers. 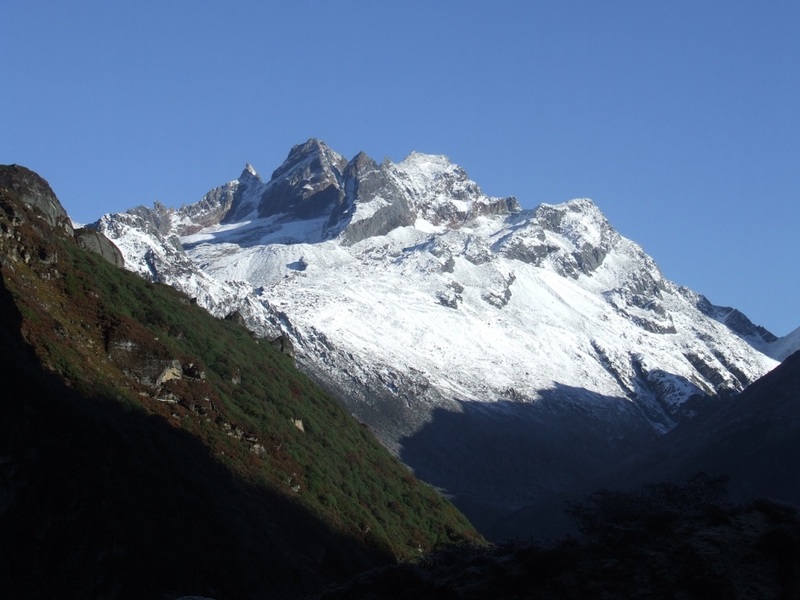 The manager of the park warns me on the difficulties of the route and makes me understand that it can be wise not to go up to the Base camp. I note it but I burn with impatience to get stuck with myself finally in the real difficulties of the route. 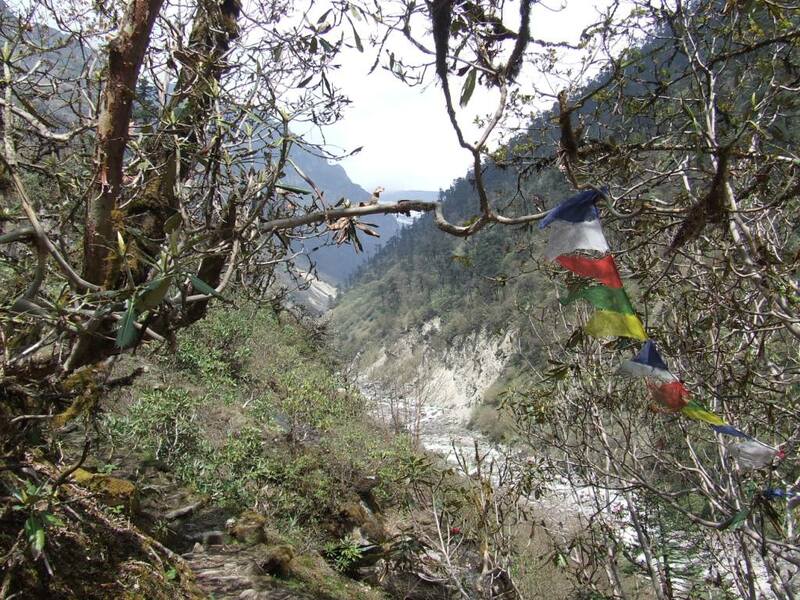 The ascent from Tashigaon to Kongma is practically continuous, in the forest. I take advantage for the last day in tropical atmosphere. Birds answer in the infinity. 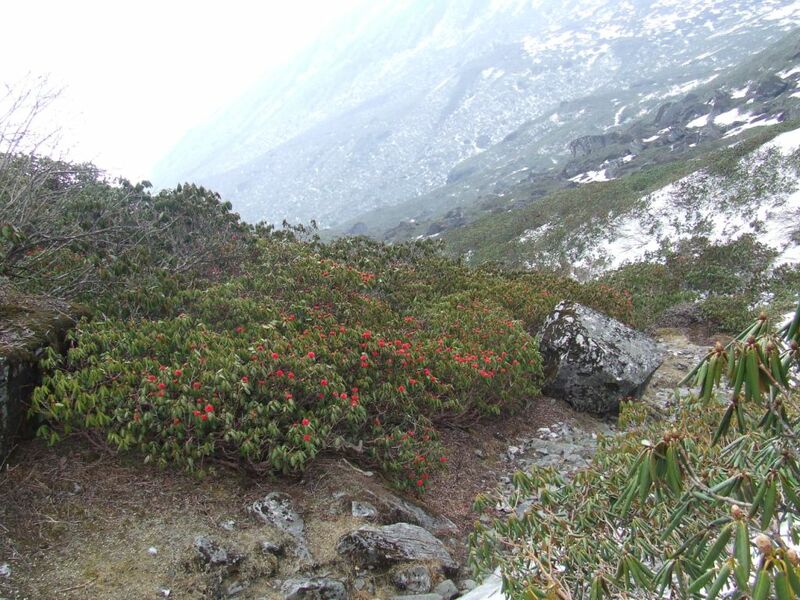 The last rhododendrons illuminate with red brightness the path. The steeply track is an obstacle. You should not try to go faster than of reason. The air is not still lacking but the path already dilutes in separated series of stairs on which feet, still clumsy, look for an often uncertain support. The ascent is long. It is necessary to be patient. It is the price to be paid to escape, maybe, the mist which surrounds anything when the sun begins to give. 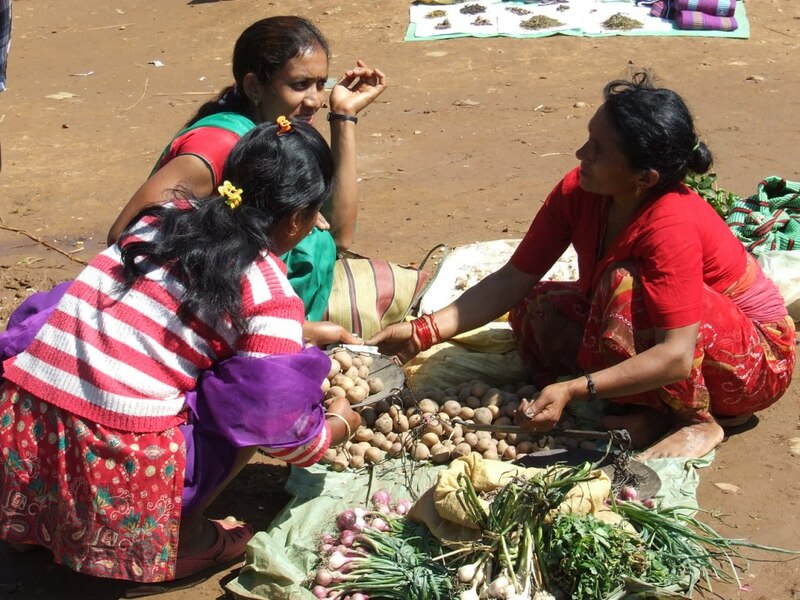 There are few houses on the way, some farms among which one allows the provisioning and even a lunch when it is opened. I meet a Sherpa with a high-alcohol breath. I shall learn afterward that they find the energy there to carry their heavy loads. I find Kongma without the snow setting we had left, there is a little more than one year. The almost vertical walls I cross today were then covered with snow. I feel more at ease. I hesitate to stay but I need to be reasonable. The good weather invites me nevertheless to leave. I met the day before my first trekker. 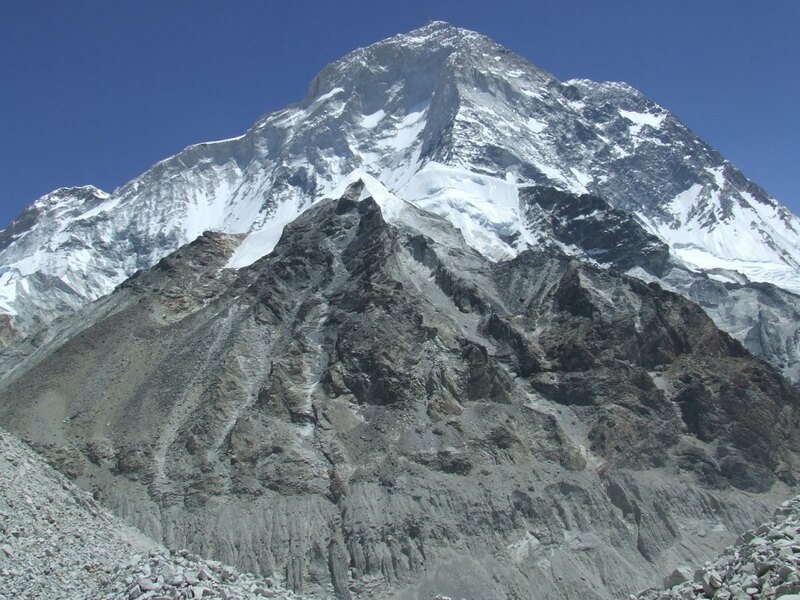 He comes down from Makalu and indicates a beautiful antenna from Shersong: the crest to be taken staying on the left to overhang the base camp at 5300m or a bit more in the direction of the peak 3. 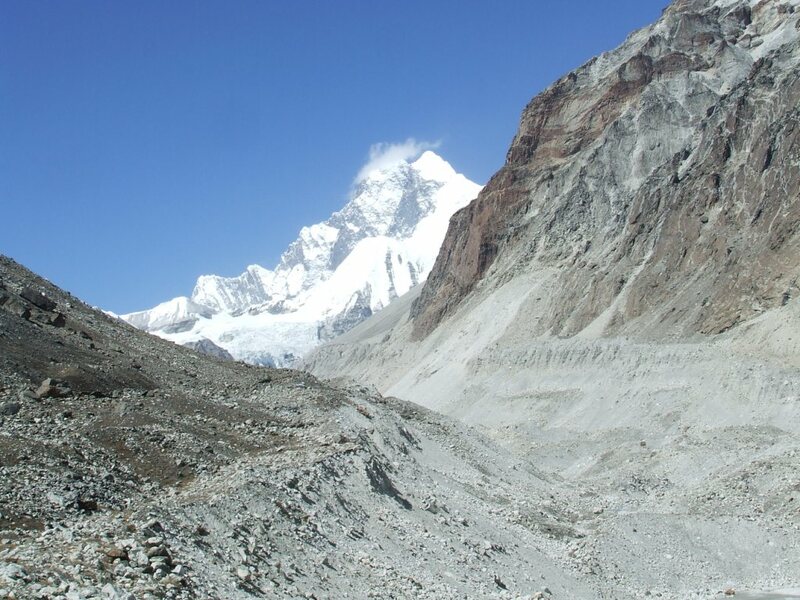 In clear weather, by settling there we can discover simultaneously Makalu, Everest, Lhotse and Kanchenjunga. I would not go this time if I can go towards the East Pass which is the objective of my project. Up at 5 30, 4°C in the room. Departure at 6 40 Arrived at 14 00. 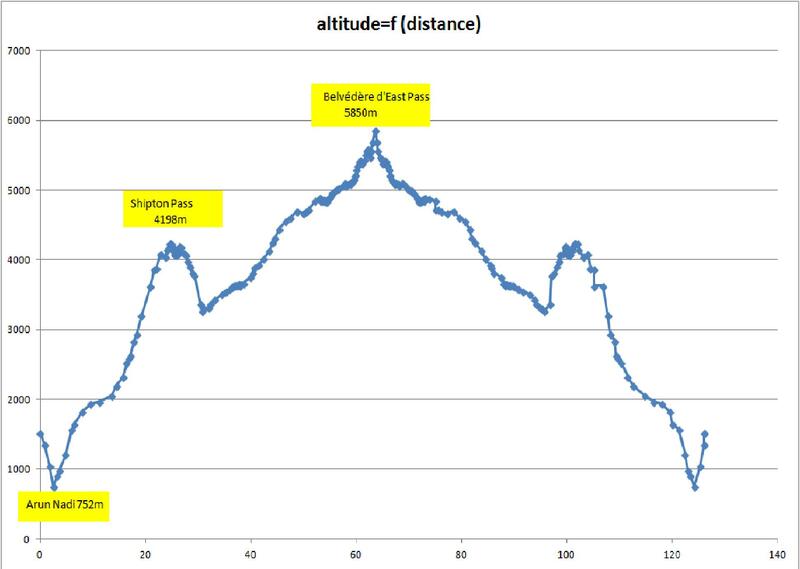 If there were only four passes (Kongma, …, Shipton, Keke) to arrive to Dobate with Shipton peaking at 4234m, the walk would be almost a formality. But the snow is always there with more than one meter in thickness in certain places. It spreads on the longest part of the route. The path remains often well indicated but endless sinking up to the thighs is exhausting. 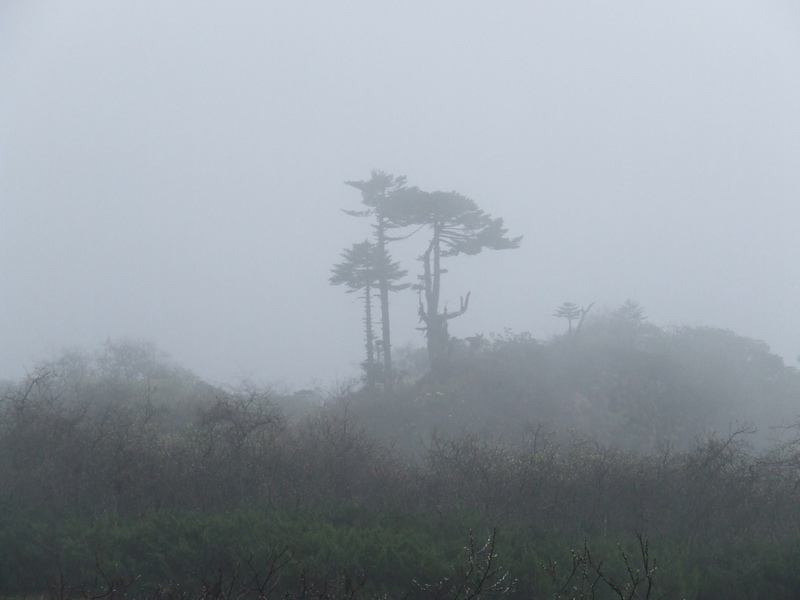 The weather quickly becomes cloudy and the fog fills all the space. 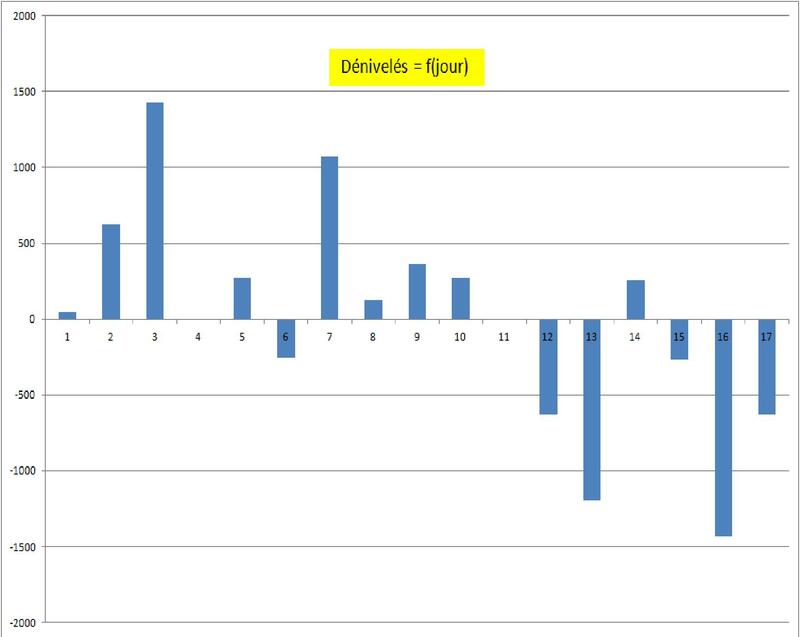 A short and unreal moment, peaks 6 and 7 appear. I get closer to the high mountains! I meet three yaks coming down in the direction of Kongma. When it will be necessary to follow the same way, each of their steps forming a column of space in the snow down to the ground will be a trap still slowing down my progress. Icy snow walls must be crossed with the help of hands to reach the third pass. 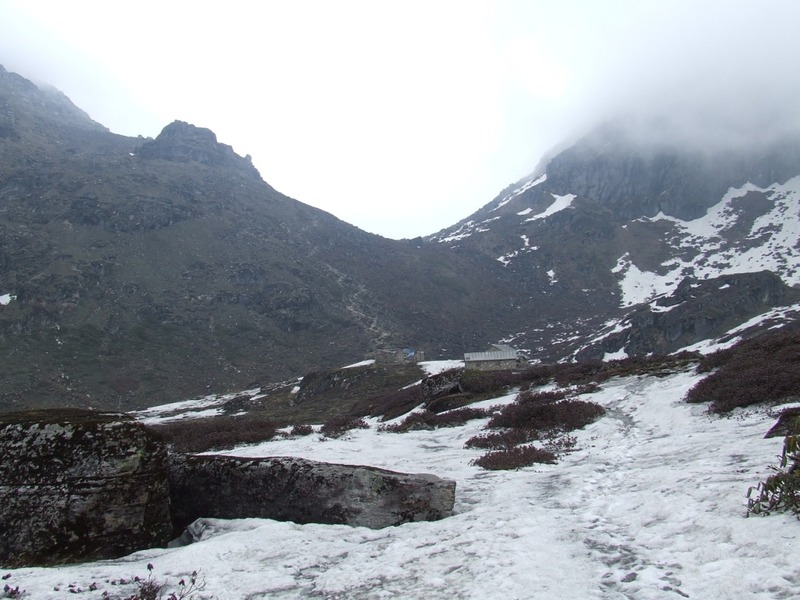 The path has disappeared under the snow and the trek is similar to climbing. I begin to understand the negative words of the park’s manager in Tashigaon. The lake preceding Keke La is partially covered with snow and ice. Ice cracks under my foot and a shoe fills with water. I hurry to go out and to empty it but the damage is done. 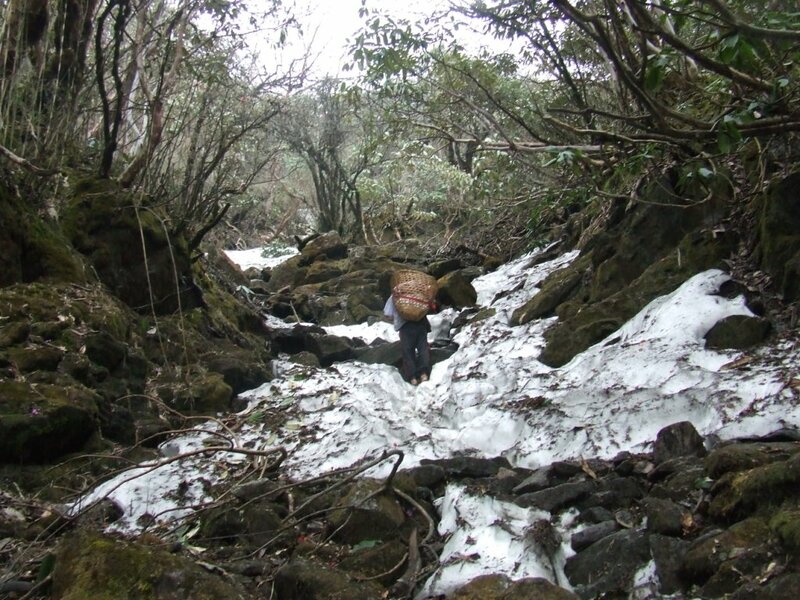 The descent towards Dobate where the husband of the Kongma lodge’s owner waits for me, Pemba Sherpa, is more serene: the snow almost disappeared and the red and yellow rhododendrons alternate. I shall spend a good evening there. His English allows us to exchange on his life and on my project. I have some difficulties understanding how he can live so isolated and far from his family. Apparently, this situation suits him very well. 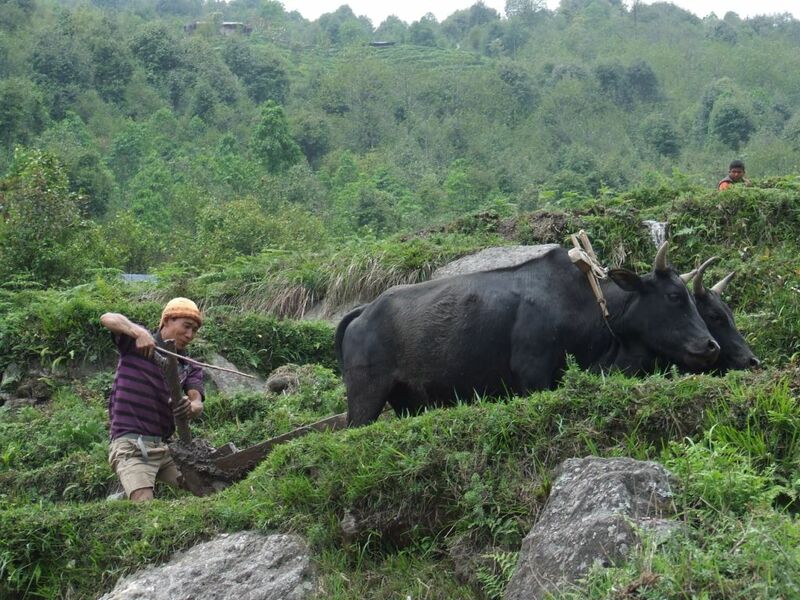 Many families are, like him, separated during the autumn and spring seasons between Tashigaon and the high valley pastures leading to MBC. I dry my shoes and my pants close to the fire and drink tea without counting. Up at 6:05; 0°C in the room; departure at 7:20 arrived 14 15 in the rain. 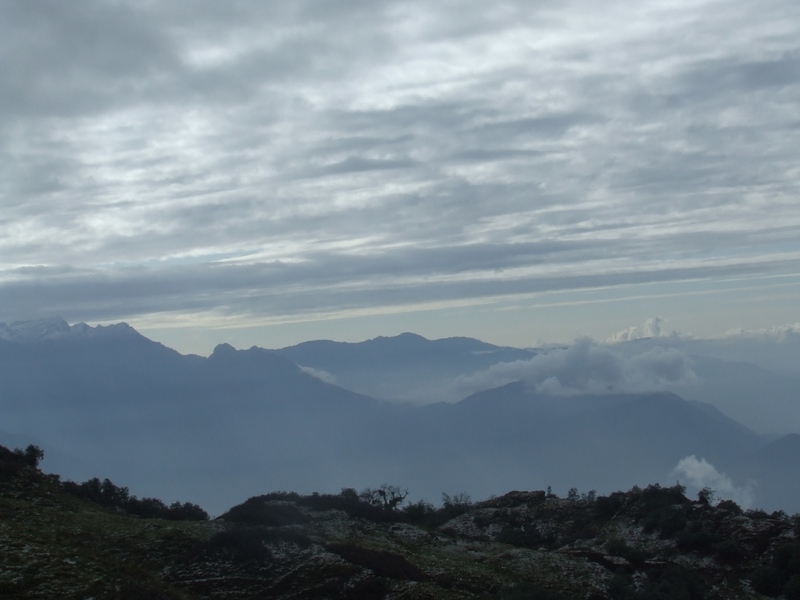 The weather is beautiful in the early hours and mountains appear by stealth, for a little while … During the copious breakfast made of pancakes and tea, Pemba warns me that a rockslide destroyed a big part of the track leading to Yangle Kharka, the only hamlett opened before MBC and thus an inescapable stop. He prepares two additional pancakes for my lunch. I find a waterfall shortly after Dobate and I take advantage of a ray of sun to take a great shower. I change the first set of batteries for the GPS. 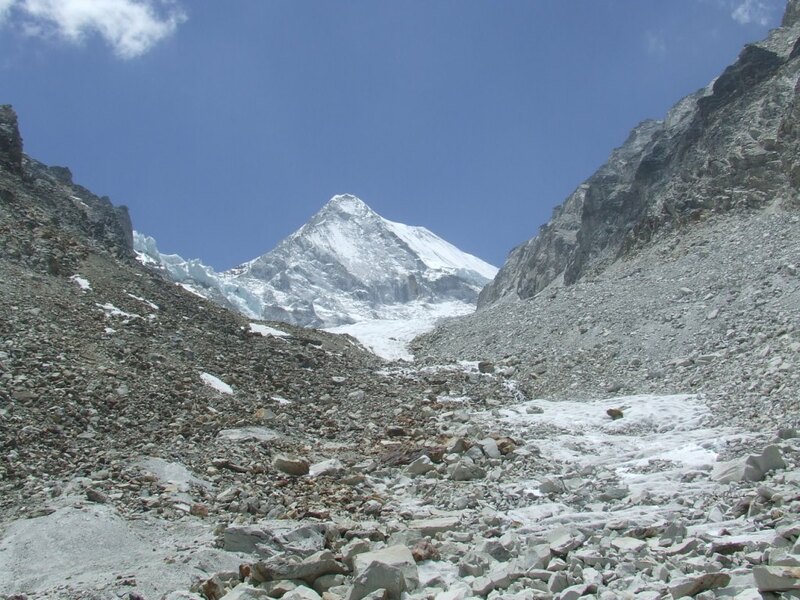 The descent towards the Barun’s valley complicates and I believe to be in the collapses described by Pemba because I am sometimes in an almost vertical channel which has to be the bed of a torrent when it is raining. 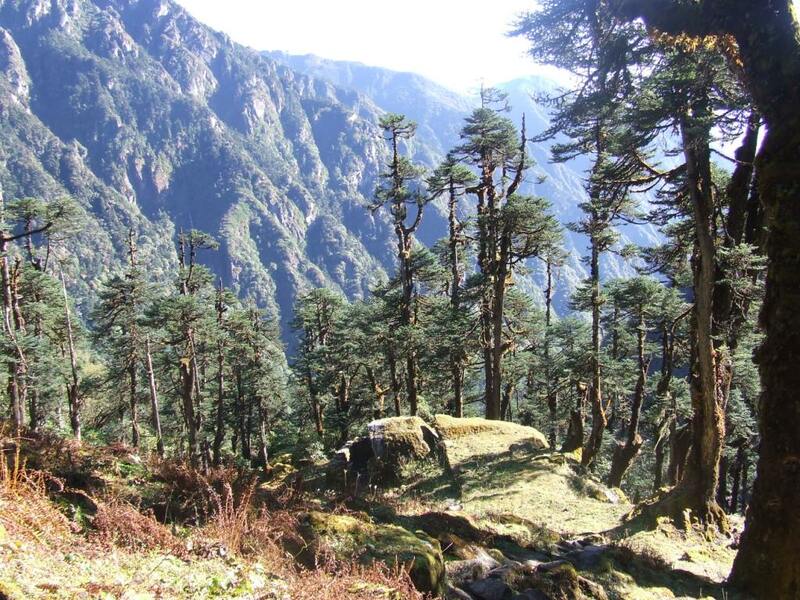 It is not the case and it is only a stimulating appetite walk compared with the long kilometer of unstable rocks that waits for me along the Barun! At noon, the rain begins to fall. At first insignificant then expanding. After the forest, the grazing appears and the path becomes easier. I arrive to Yangle Kharka at the right time because the rain doubles intensity and I would not have stayed dry a very long time in these conditions. Yangle Kharka seems very boorish for a hamlet at this low height. 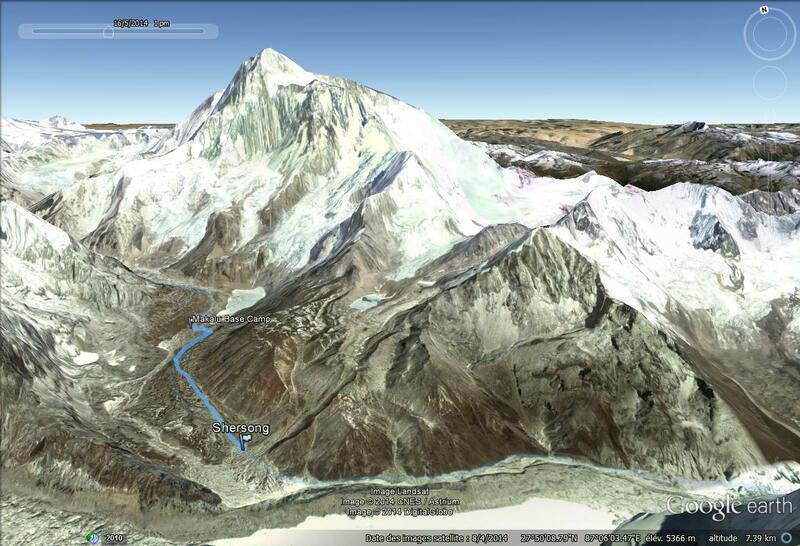 I am so far from Annapurna! Sad and long afternoon to try to warm myself close to the wood fire where will be prepared my evening dalbath. This simple thought kills my appetite. Everything is dirty and nice here. The rain prevents any serene vision for an immediate future. Thanks to my equipment, I plan to stop to Shershong (with none shelter place). 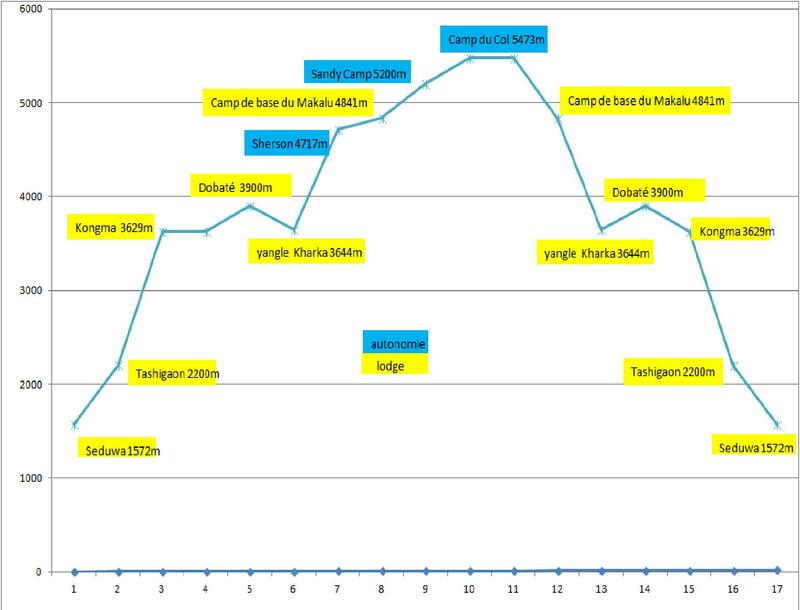 I shall not make there my second day of acclimatization as expected because it will be made at MBC at two hours and 200m ascent from there. 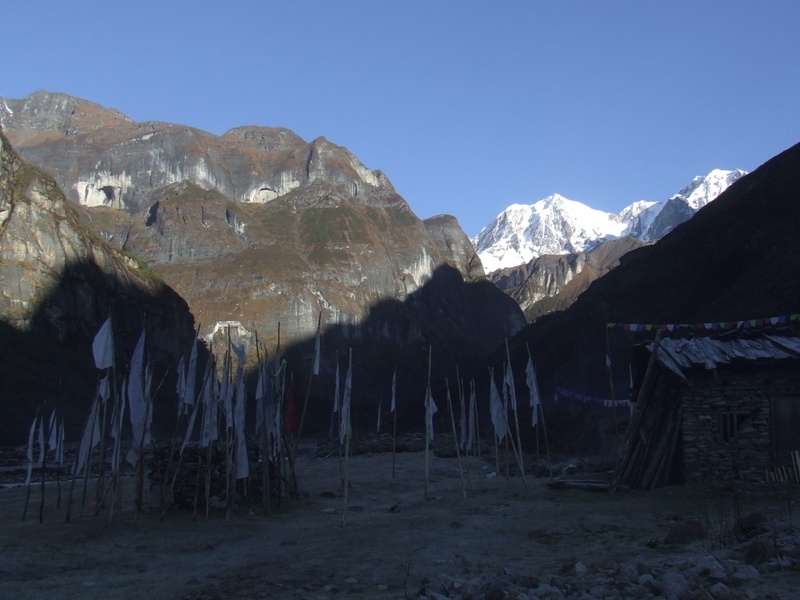 In Yak Kharka as in Langmale, buildings are actually closed with padlocks. Refuge is possible however possible in adjacent shelter if necessary. A silent kid follows me during dozens of minutes. I go nevertheless very slowly for him. He will be joined by his father and his brothers. 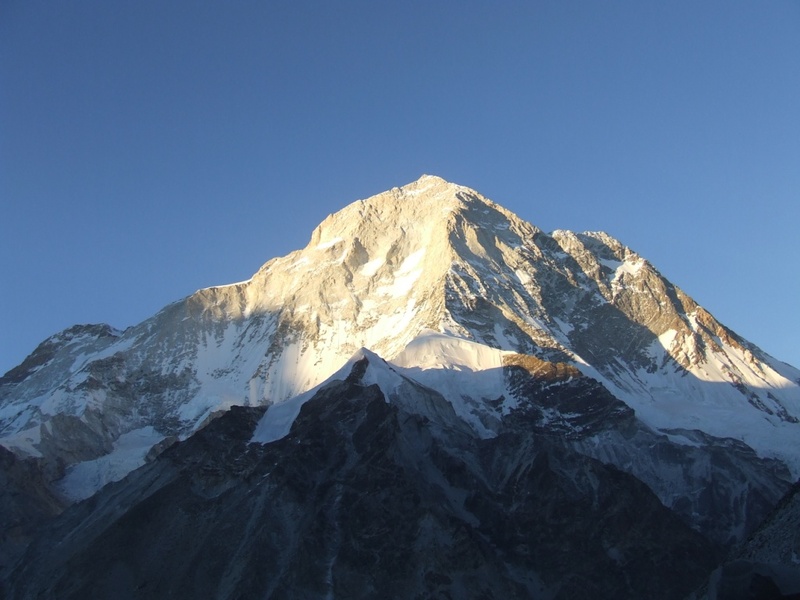 They go to the second base camp where, it seems, more than 200 people prepare expeditions to overcome the summit of Makalu. I imagine, in my long solitary walking, the kinds of traffic jams which have to reign there. I have never understood this paradox: so much personal effort to find themselves finally crowding in places so empty, mineral and majestic. Each to his cup of tea!! The air begins to be lacking and it is necessary to manage the beatings of my heart which is now beating too fast with the slightest effort. Stops are necessary more and more often. No matter, I have time. 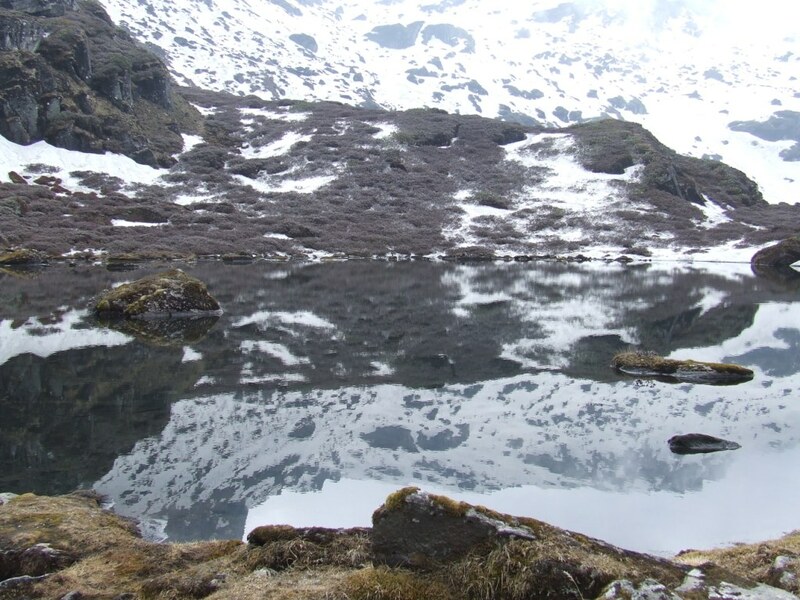 I arrive under the snow to Shershong and I find a water source at 150m from the camp. I set up my tent for the first time without any problem. 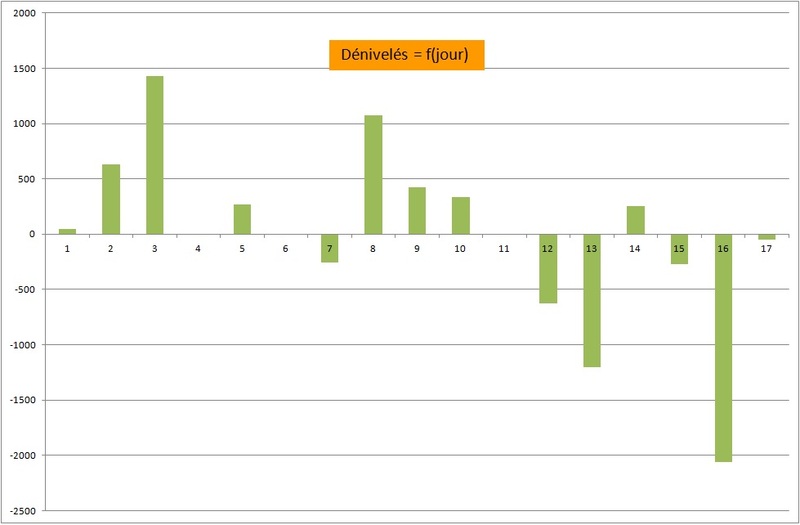 The weather clears up in the afternoon, enough so that peaks 6 and 7 appear in an supernatural environment. These enormous cliffs, so close, set the tone of what will be my environment from now on. I have to erase a big migraine with some Ibuprofen and I have the impression that my heart is going to stop because it beats very slowly. 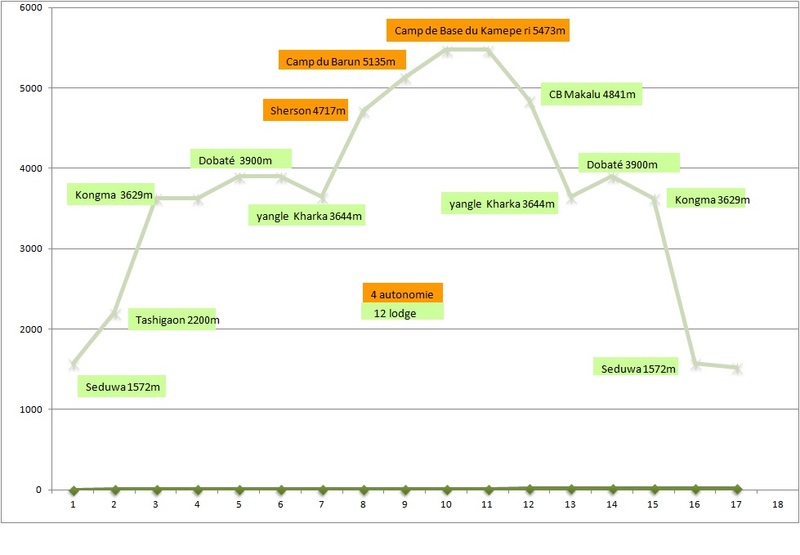 These almost 1100m of ascent at this level are too important. The night will be difficult and long with numerous awakenings because of my difficulty to breth: I went up too fast. It is Sylvie’s birthday. I wish her Happy birthday by the thought. I get ready quite slowly because the road will be short today. The weather clears on the road. It bodes well. 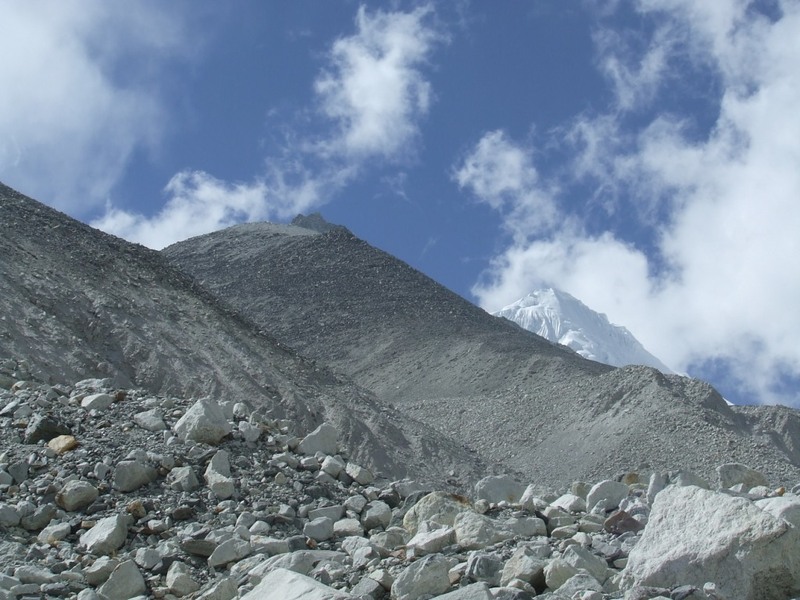 For the first time, Makalu appears to me, majestic and wearing a curl of clouds. We shall not leave each other during 5 days. I take advantage of the sun to get washed a little less basically than usually. I also dry tent and sleeping bag, wet in Shershong. 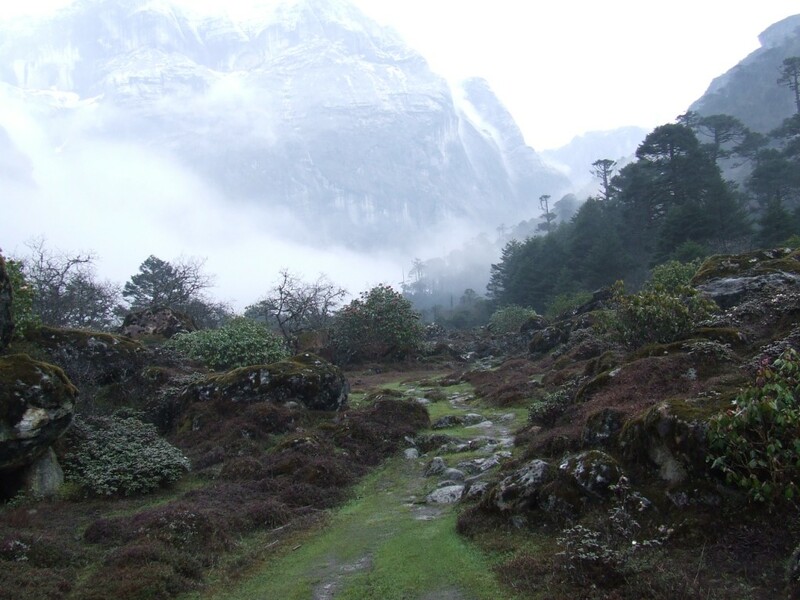 I go in recognition of the path, following Barun’s glacier afternoon. It begins well drawn (stop at WP413). I cross in great shape my first 5000m during this exploration. The lodge is very basic but the atmosphere is friendly. Carriers come to spend the night and we share our dinner there. It is -1°C at about 4 pm and I am afraid of lower temperatures higher, when I shall be alone. I stop at 7:30 to protect me with sun cream: the sun is present and burns as soon as it gives to these heights. The weather will remain totally clear during my stay above MBC. This respite is a big chance which will allow me to benefit completely from extraordinary and always renewed spectacles. 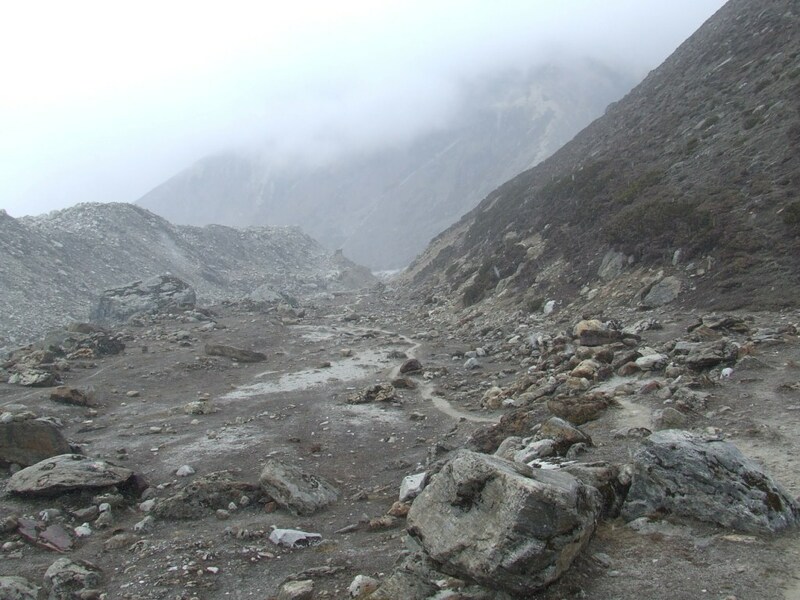 I have to leave the path which leads to the second base camp because I have to go to the left to join Sandy Camp. This hypothetical camp is not situated on any map and was located on GE. 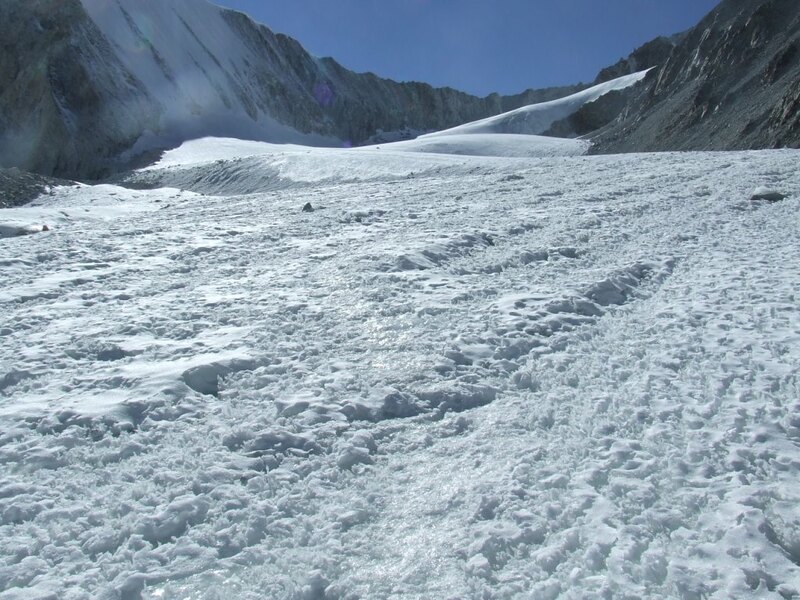 When I leave the path, it becomes chaotic, on the back of the glacier. 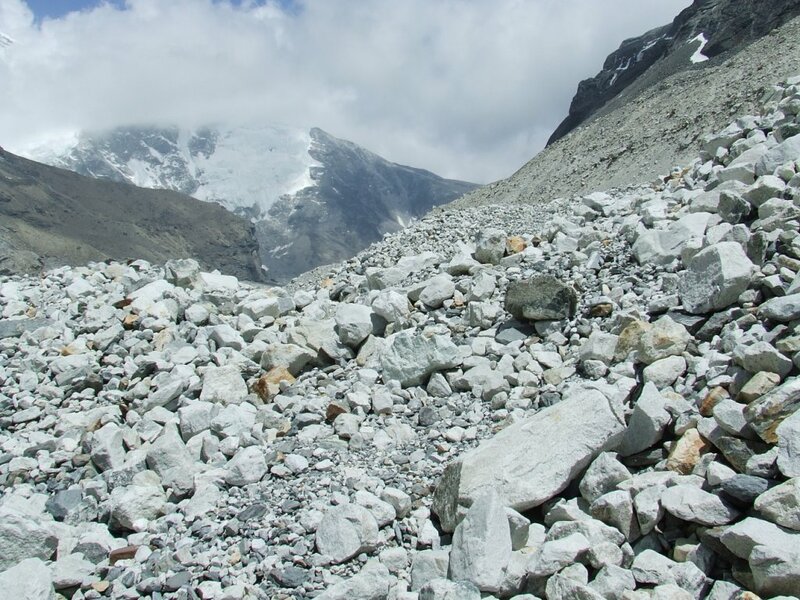 I progress now in the unstable rocks and I join the line of break between the glacier and the hillside on the right bank of the glacier. It is not the best solution because it is a zone of fallen rocks where the progress is difficult and dangerous. I constantly think that a broken leg means the death now. Nothing very heartening. I recognize finally Sandy Camp’s location in an overhang of small hundred meters. I knew that climbing would not be simple there and I had planned to go up by forming zigzags on the slope. It is not so simple because rocks, from all sizes, fall down and slide by pulling others with them. Nothing holds. I choose to go up by the bed of a waterfall, thinking that stones will form a more coherent set, thanks to the flows of water. Nothing changes it. On the contrary, the simple fact of putting my foot somewhere diverts sometimes the current towards me. I am not proud when I get, dipped, to the top. The experience is not to renew! 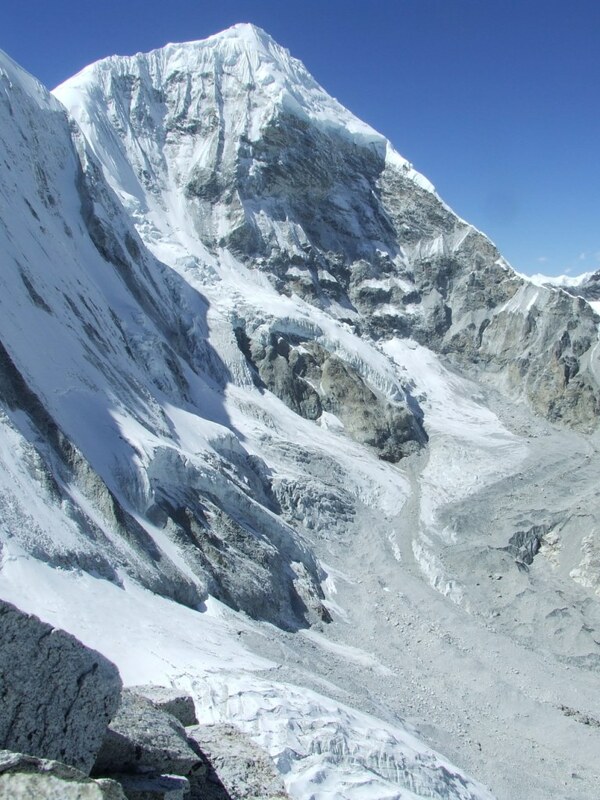 There is so much collapse here as there was of avalanches in the valley surrounding Dhaulagiri. It is necessary to become used to these new songs of the mountain. 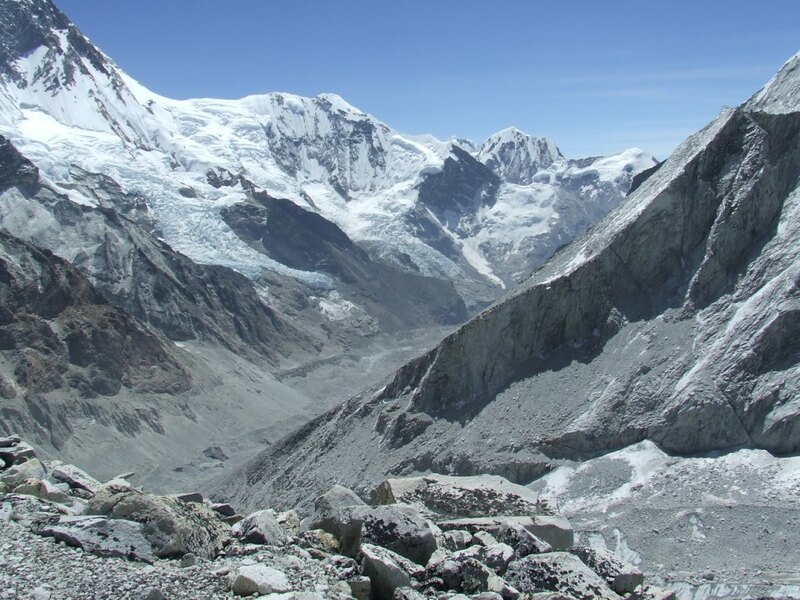 Sandy Camp is a magnificent terrace of fine and white sand, a real paradise for a sunbathing in an environment of snowy peaks, in the crystalline sound of the near torrent and in front of unchanging Makalu. 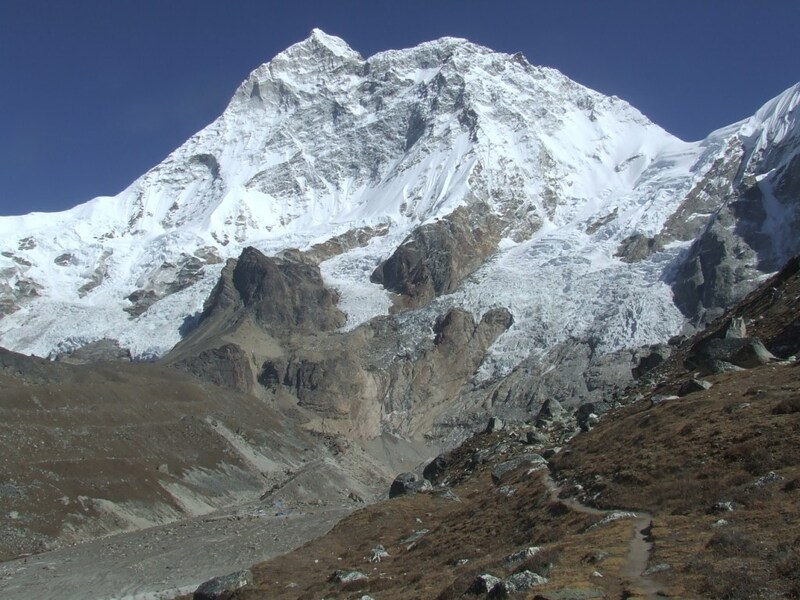 Afternoon passes, enjoying the simple pleasure of the sweetness of the sun and the fantastic view on Lhotse (8516m), Lhotse Shar (8393m), Everest at 18 km (8848m), Shar Tse (7591m), Shar Tse 2 (7457m) . My heart beats now too fast without making any effort. Everything will be back to normal in the evening and the migraine is not there. It is 15°C in the tent in 17:00. My fear of low temperatures at high height was not founded. The weather is fair and I follow the road planned in my GPS It brings me up while staying on the flat which goes along the Barun’s Glacier. I saw dozens of times the profile of this mountain which I have the impression to know by heart. I find cairns sometimes. It really had to be a path a long time ago. The condition of the garbage at Sandy Camp reminds me that it was not used for several years. The first part is made without too much difficulty. The descent towards the glacier and the moraine leading towards the East Pass is much less easy because the slope is too important for trying a direct descent. 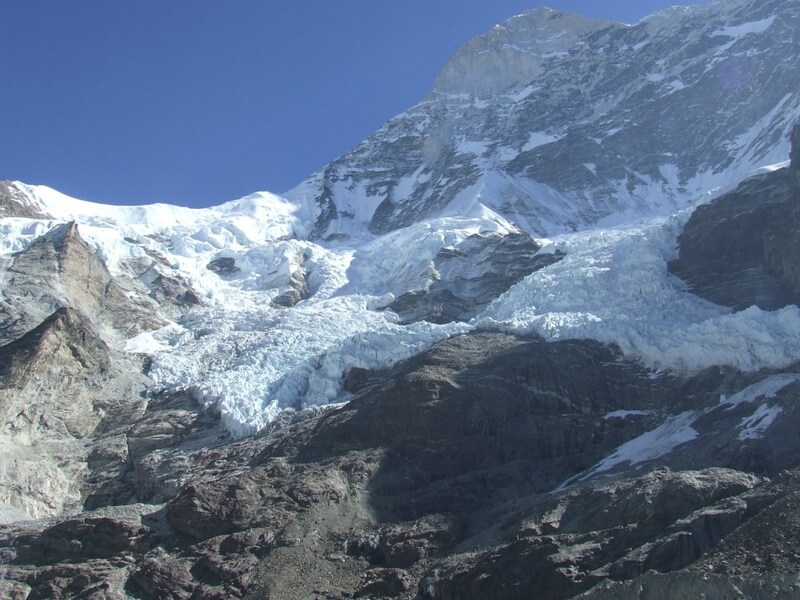 To try to join the glacier by staying on a horizontal is not more possible because the wall of the hillside becomes more and more vertical. I once fall, taken by the weight of the backpack. 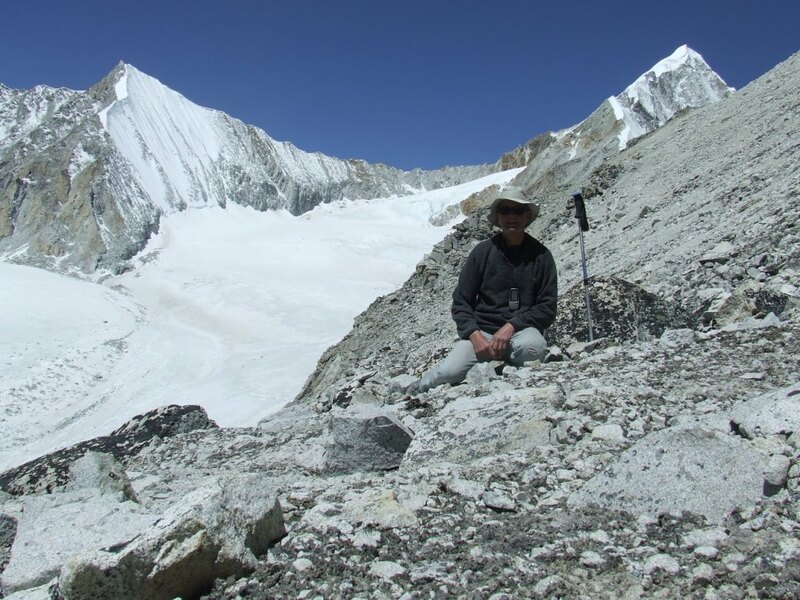 Arrived on the moraine, I continue to follow my GPS points but the ground is always so unstable. After a fruitless attempt of progress towards the foot of the main glacier going downhill to East Pass, I decide to stop on a sandy location which was a formerly camp, that I baptize Camp of the Pass, for lack of any better name. 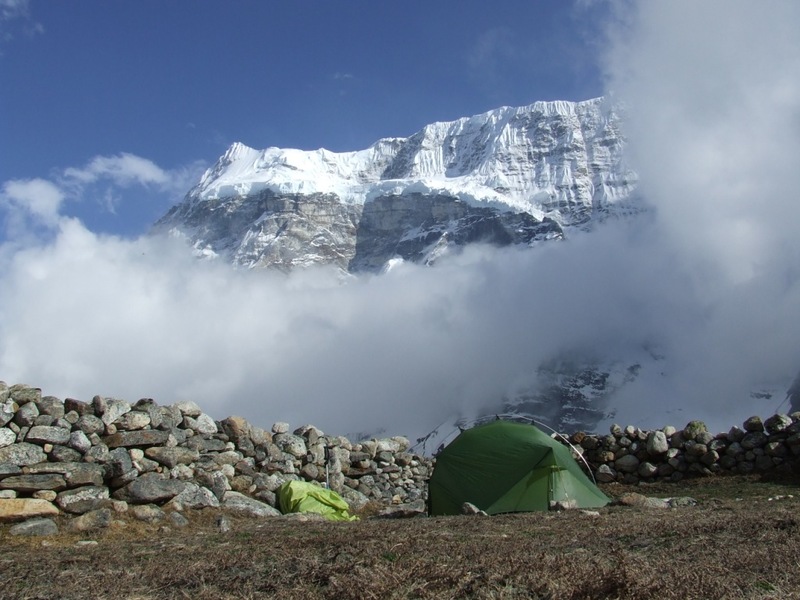 The location is ideal to plant the tent, always in front of Makalu, but higher and higher with regard to it. 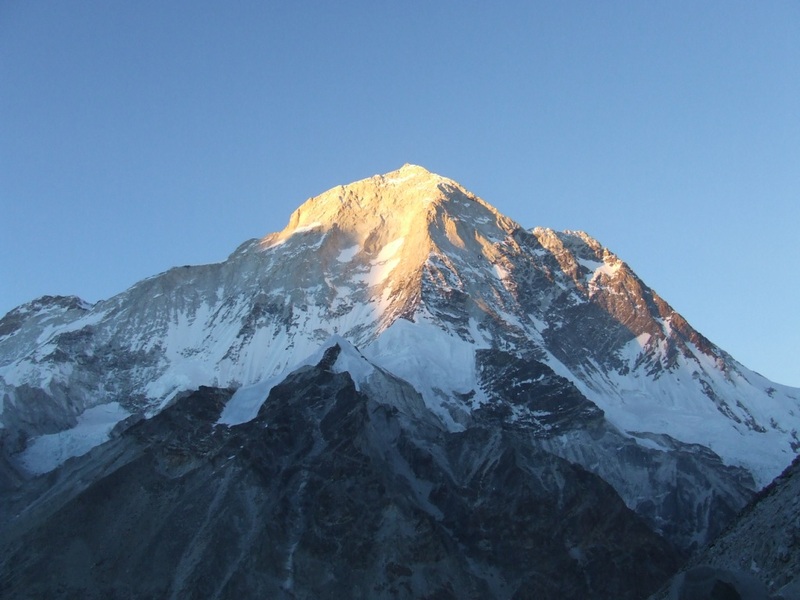 It is today one first record : my highest ground night, at 5473m … And everything goes well. 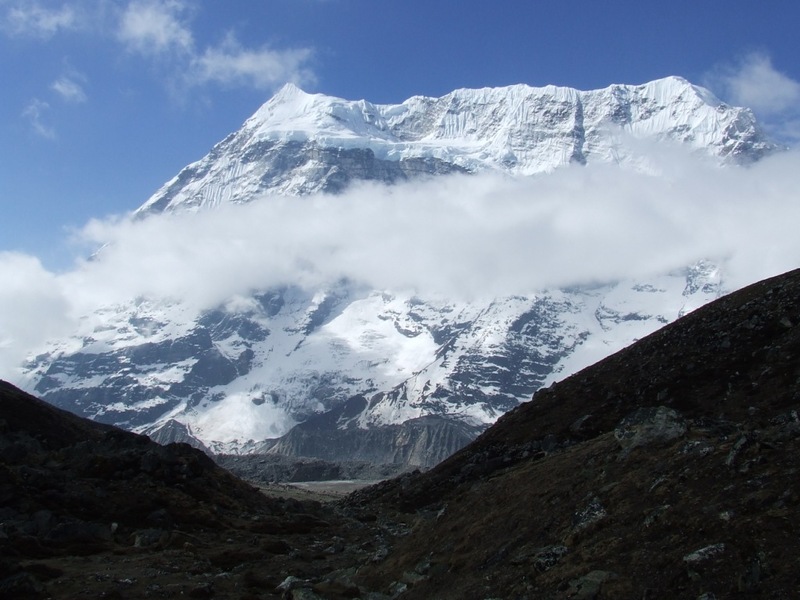 It is only when having unsettled and tidied up my things that my look is attracted by the slope which faces my camp in the direction of East pass. It seems to me obvious that from this height, I shall have a good point of view allowing me to decide on the way to be followed. 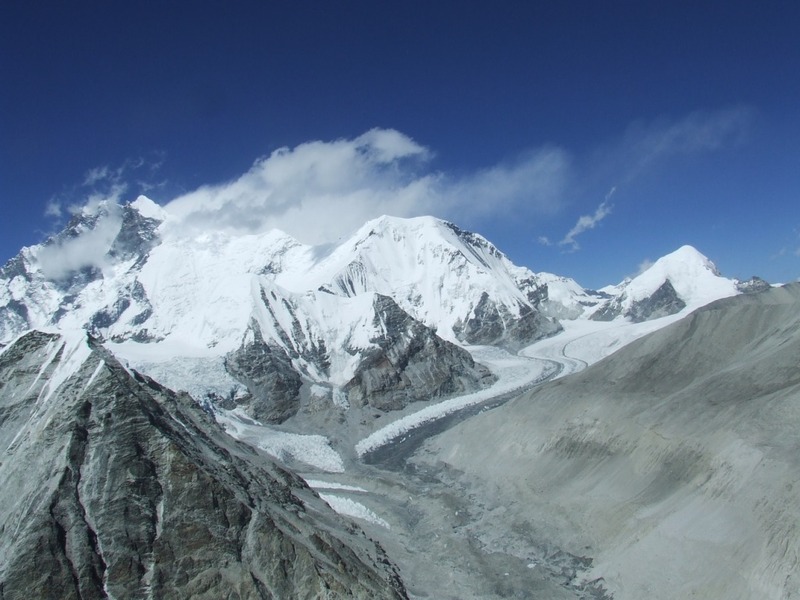 I have a choice to be made: either come down towards the MBC to join the heights above Shersong, the antenna recommended by Philippe in Kongma, or go up towards East pass today if I find a more or less safe passage. Half an hour has to be enough. I do not even take water. Without bag, the ascent appears to me a soft escapade. 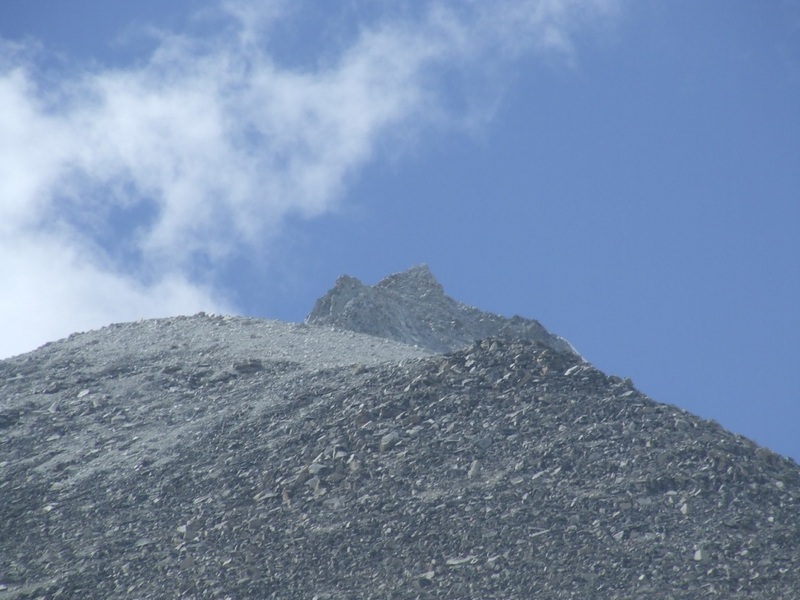 A crest masks other one and it is necessary to go on climbing to hope to have a finally clear view. I need 2 hours to see finally appearing the mountains’ circus surrounding East Pass. 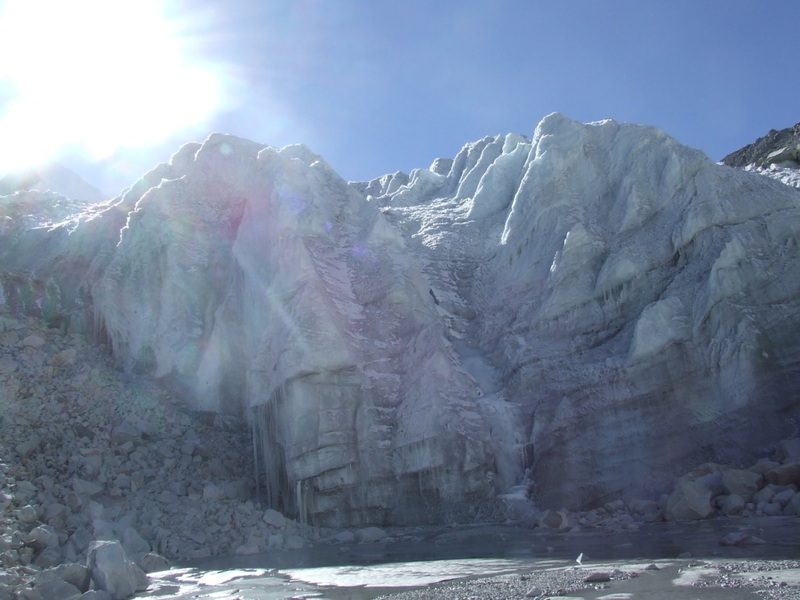 The glacier is enormous, inescapable and spotless. To cross it alone and without appropriate equipment seems to me totally irresponsible. The bell of return has just rung. 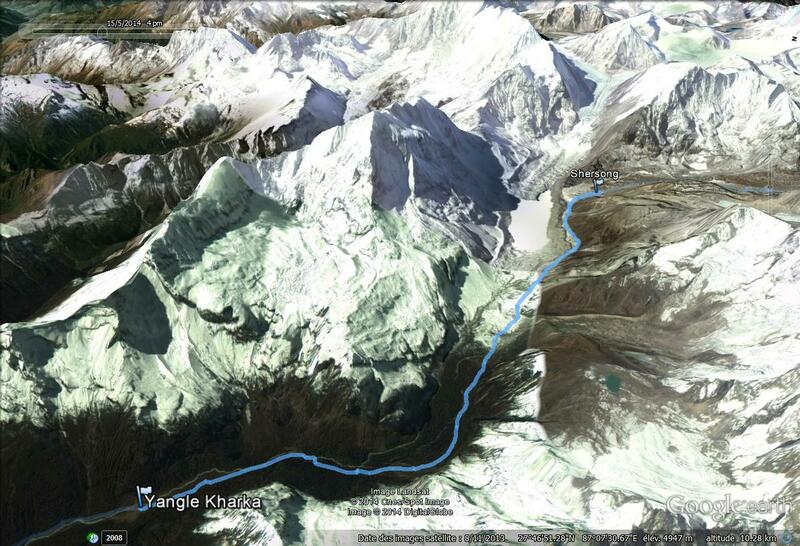 I am at 5855m. A helicopter takes brutally me out of my dreams. It is the first contact in three days. 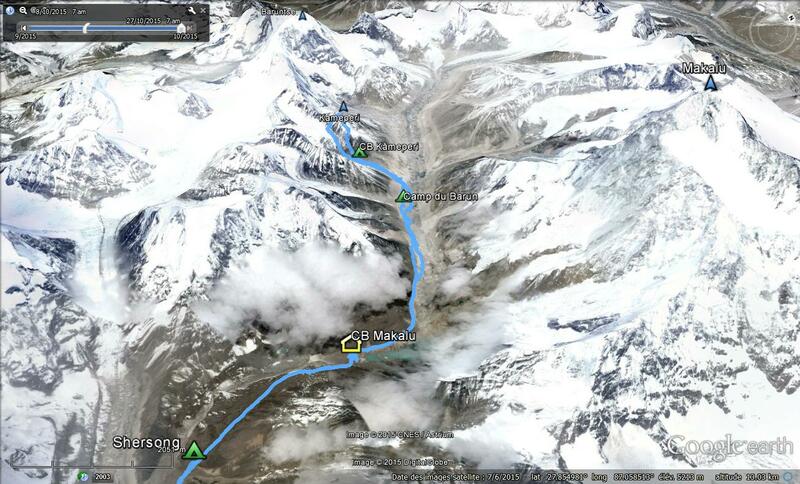 It was on the way to the second base camp of Makalu when the pilot saw me in the middle of nowhere. He comes towards me and I make a sign meaning that everything goes well. Everything goes very well even because I taste the success of my project as a gourmet in the various small dishes in the delicious flavors. 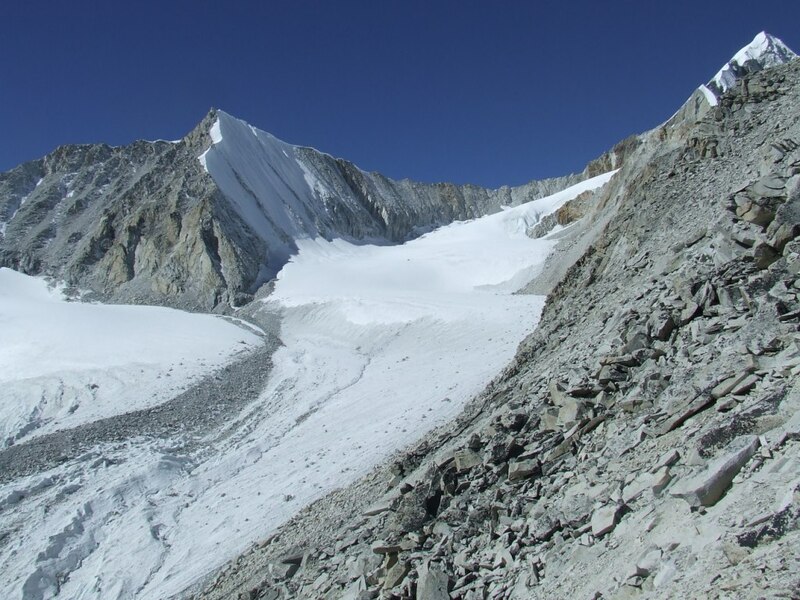 Sherpani pass, at the bottom to the left, appears to be a wall of unbridgeable ice. 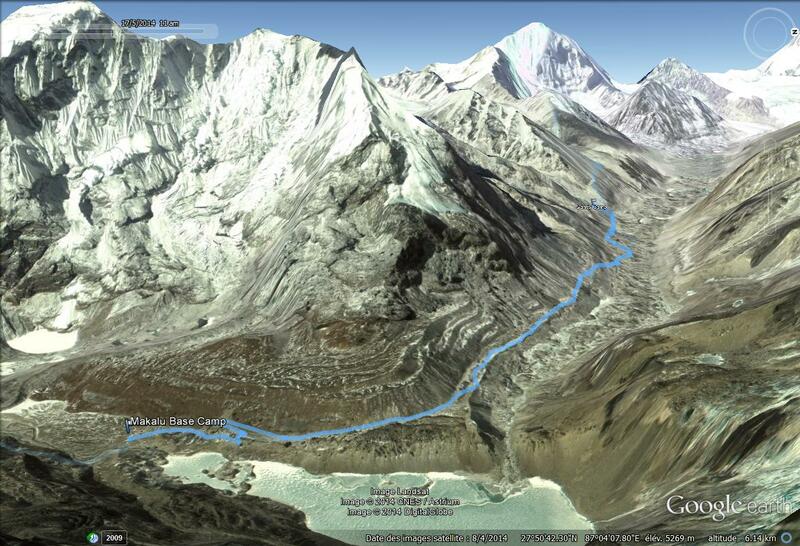 East pass, at the bottom to the right, seems more feasible after the long ascent of the glacier! Down to the camp, I plant my tent on the same location … That misses a little of anticipation. We shall do better next time. The weather covers little at the end of afternoon, enough to worry me a little bit. I guzzle my fourth extraordinary breakfast. The road will be long and difficult today to join MBC. There are two important difficulties to overcome because I do not want to try the low way by the meeting place of the side glacier where I am with that of Barun. I go back up on the plateau which leads to Sandy Camp without finding my way back on the way out. The GPS gives me a big service. I come down from the plateau towards the Barun’s glacier by preferring to slide on a glacis of bits of gravel and sand. Everything leaves with me but the advantage is to have the same speed which allows to plan and to avoid the biggest pebbles. 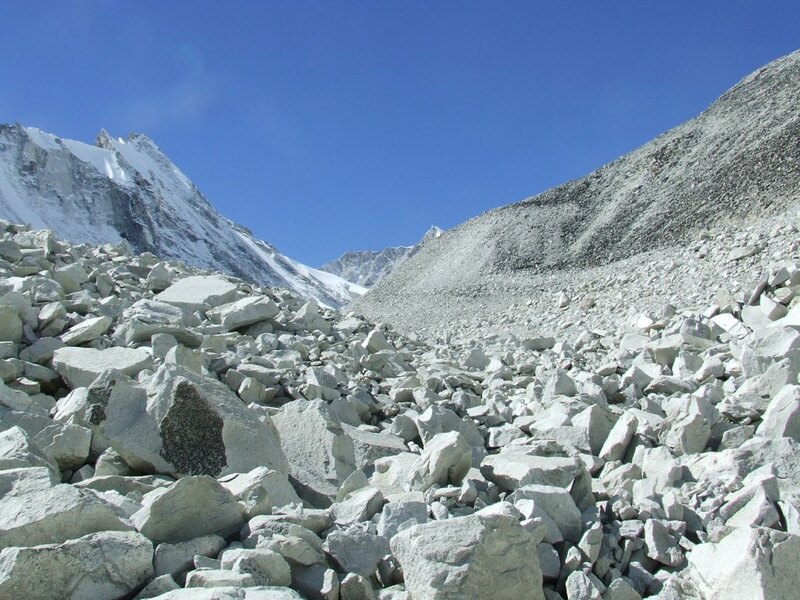 This time, I prefer to avoid the masses of fallen rocks by progressing on an uncertain line on the back of the glacier in the direction of the path to the second camp of Makalu. 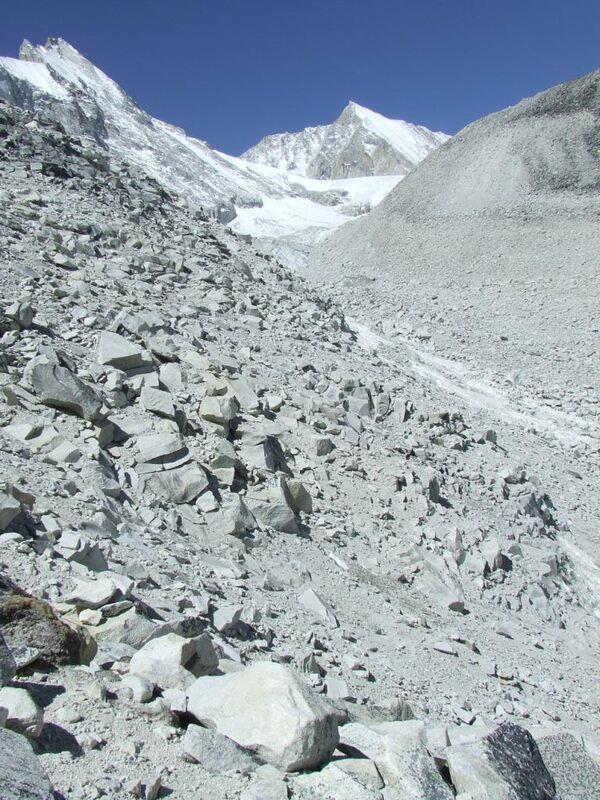 I avoid so much as possible hollows and bumps formed over the centuries by the slow advance of the glacier. My jeans will not take out whole there, torn in legs and on buttocks and my fingers of the left hand will superficially be cut, due to rubbing on granite rocks. I arrive really exhausted but happy to see again human beings in MBC after more than 10 hours of walking. Excellent evening when I celebrate my victory with the local vodka. At noon, the drizzle joined in. The return at the low heights is synonymic of overcast weather apparently. But nothing more can affect my morale now. I saw, this time, a shepherd installed in Shershong under a roof of covers recently settled. The farm of Langmale was also open and it would probably have been possible to take a meal or at least some tea there. It is not either by going down it that I was able to admire this magnificent valley. I spend an excellent evening with my new friends. Here the words are not necessary to feel integrated into the family by sharing the meal together. Some words as lasso (thank you) or salti (ni) (friend) cause true laughting and the conviviality is very there. The weather is as yesterday and on the way out covered. 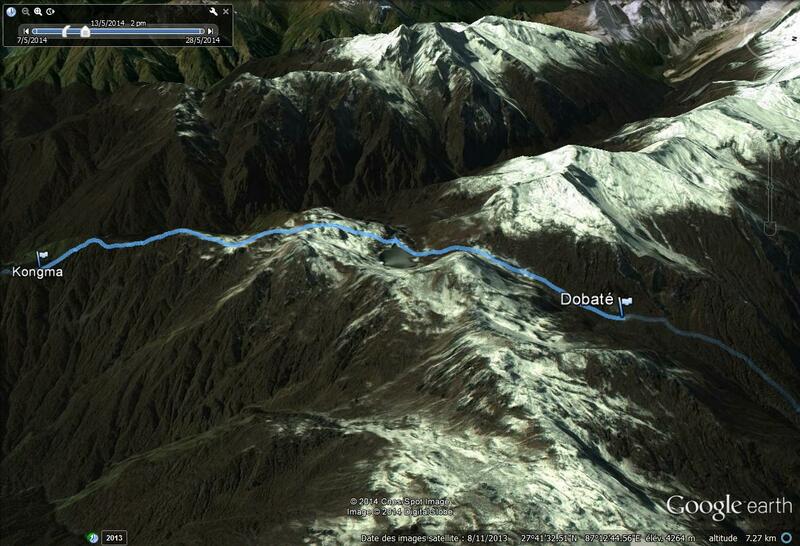 The ascent towards Dobate is terrible even with my bag having lost more than 2 kilos. The evening with Pemba and carriers will be a big reward of the efforts of the day. 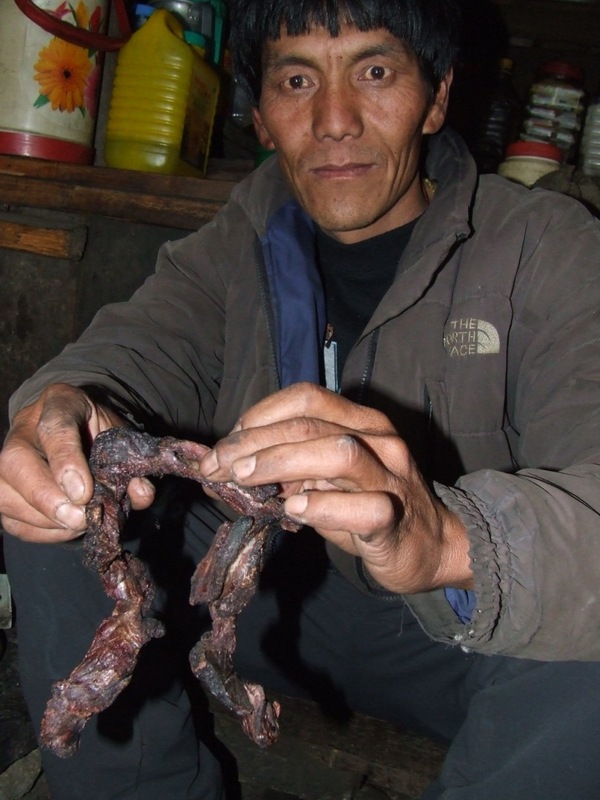 I discover the traditional sucutti, the yak meat dried by fire and placed again in the flame to be tenderized. Taste and share without moderation with the local Arack. The social life, in its original sense about which I am fond of is there. It is like a fabric warped day after day by the tradition. Everybody takes a place here in the warmth after the efforts of the day. Extraordinarily, I am included in this precious fabric. We don’t to think about anything, we enjoy simply the present moment, together. Depature after review of my « exploit » by looking at photos with Pemba. He remember me that he had told, on the way out, by analyzing the drawings of cooking on my pancakes that my trek would be a success. His grandfather taught to him to read the future in this way. It is the day of four passes. Everybody told me that the snow melted since my first passage. It is true that the path is a little more visible. 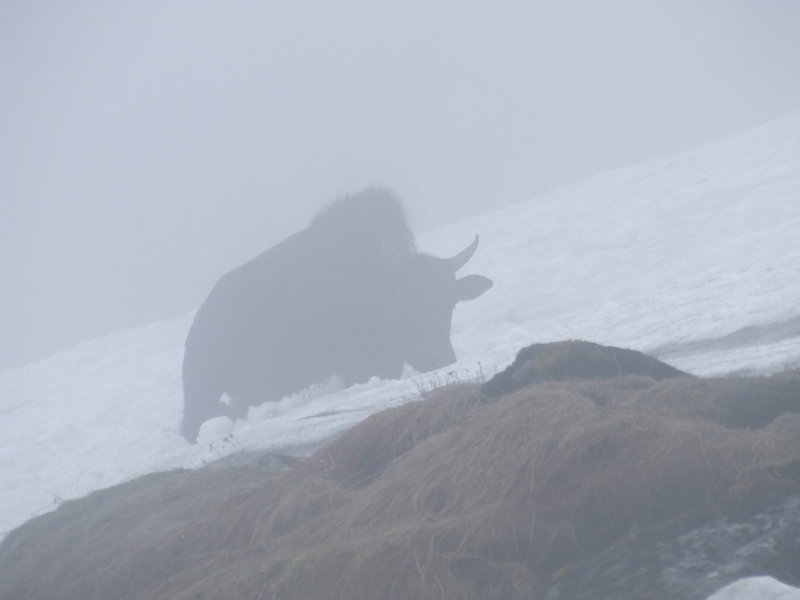 It will be necessary to fight all the same step by step to move forward in the soft and thick snow on several kilometers, in the drizzle and the fog sometimes. I look for the crampon lost on the way out without finding it. I find the warm atmosphere of Kongma where I shall spend a new exceptional evening. A dinner guest shows me his invaluable booty: he has in his pocket three yarsagumba, collected in the region of Yangle Kharka. It is about caterpillars infected by a mushroom which eventually kills them. 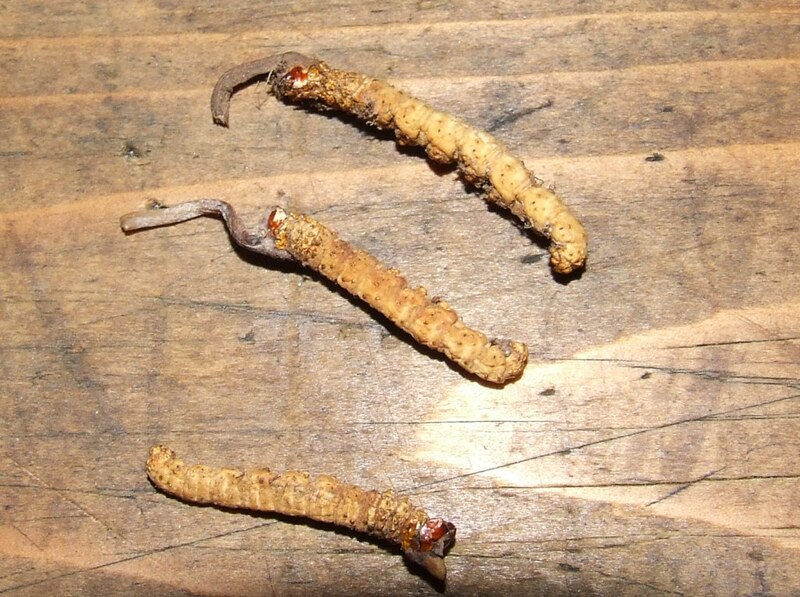 Middle plants middle insect, this is a medicine with numerous virtues in particular the increase of the sexual capacities, that the rich Chineses buy at a high price, up to 5000€ / kg. I leave shaved but always dirty. I shall wait to find a waterfall to take a shower on the way while the temperature appreciably went back up. 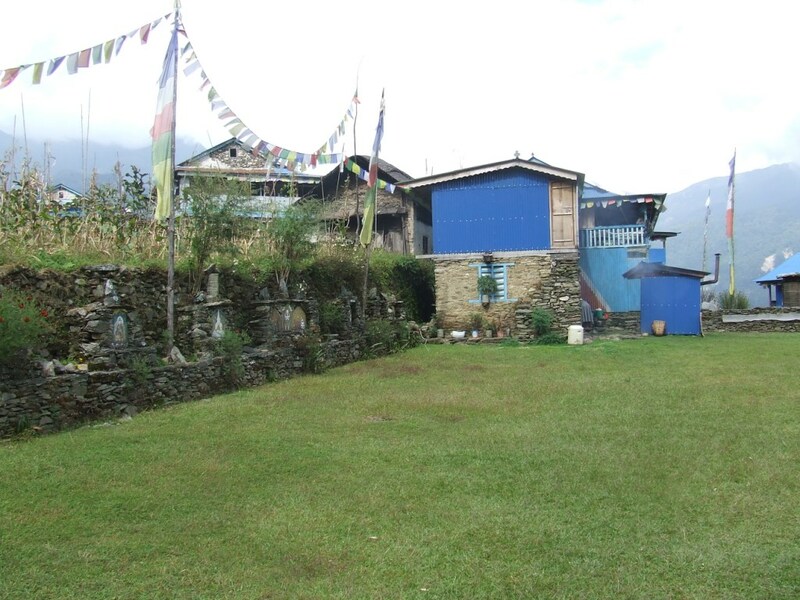 In Tashigaon, the guesthouse is unfortunately closed because its owner left with helicopter to Kathmandu. I am disappointed and I go to the guesthouse where we stayed in March, 2013. The atmosphere is more hoisted and the exchanges more limited although cordials. I find no more leeches on the way. I find Dawa in his school in Chyaksa danda where he took the place of Head teacher during my trek. It is an excellent news which we shall celebrate in family that evening by getting away the neck of one of its chickens in Seduwa. We shall never enough say that this abyss to be crossed between Seduwa and Num is a torture because we already believe that trial is finished when it is necessary to go up by an steeply ascent furthermore of 700m, in the tropical torpor.